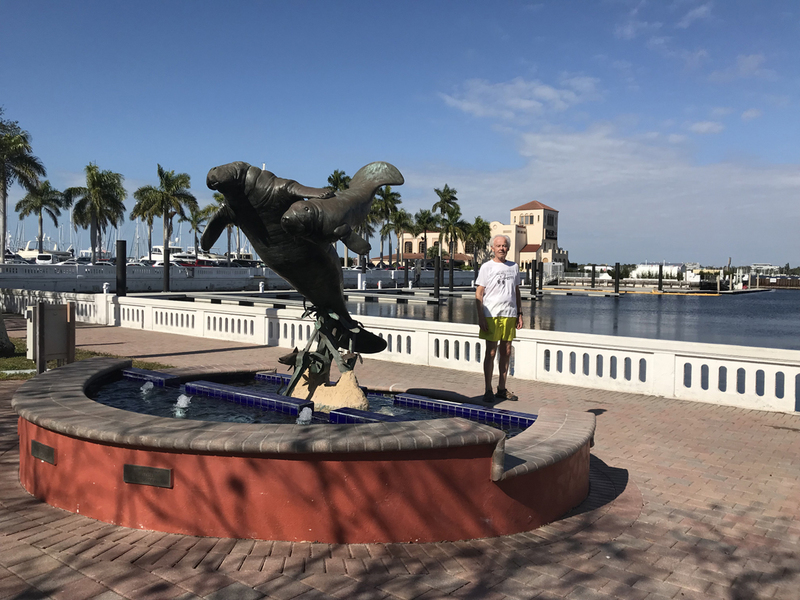 12/31/2018 M – New Year’s Eve! 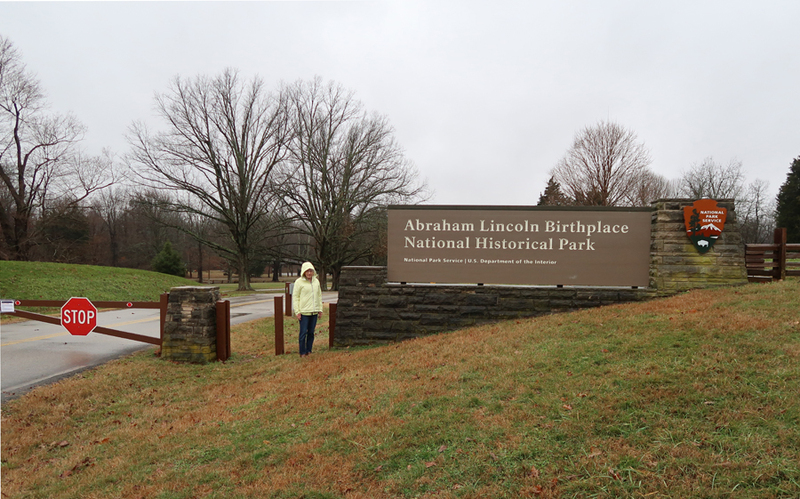 Four hours of driving through heavy rain brought us to Hodgenville KY and Abraham Lincoln Birthplace National Historical Park. 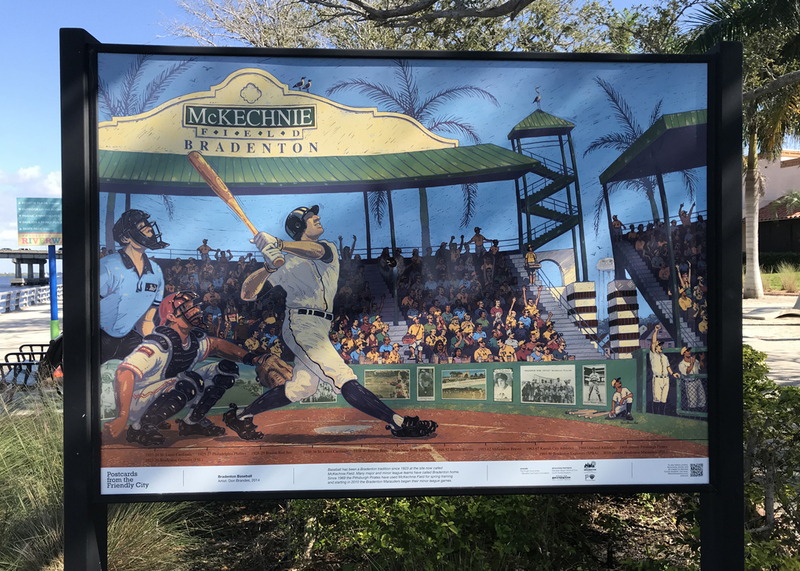 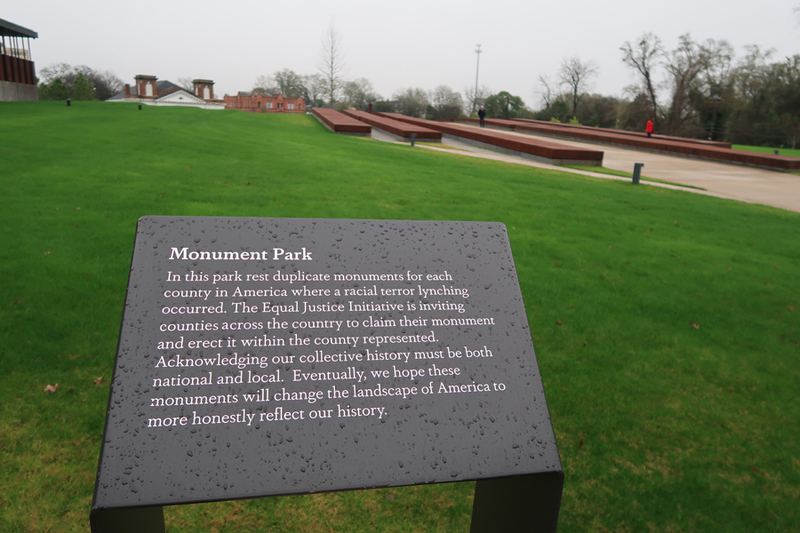 However, we were able to tour the park. 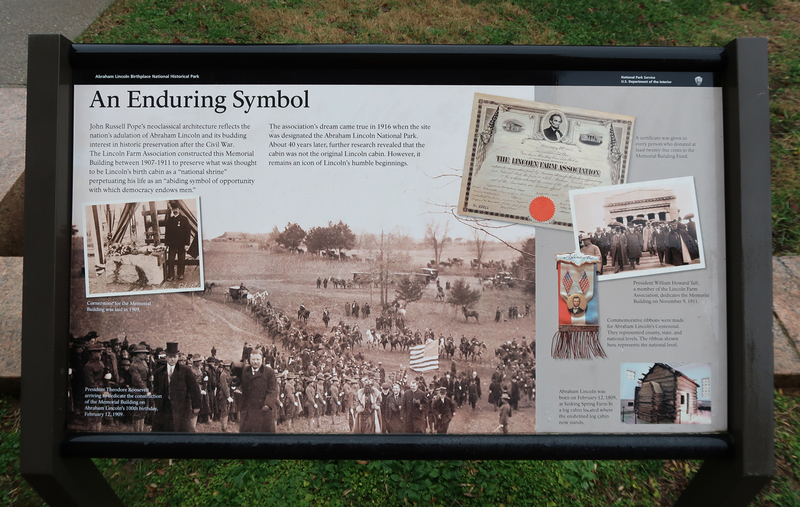 The “First Lincoln Memorial” was dedicated by President William Howard Taft on 11/9/1911. 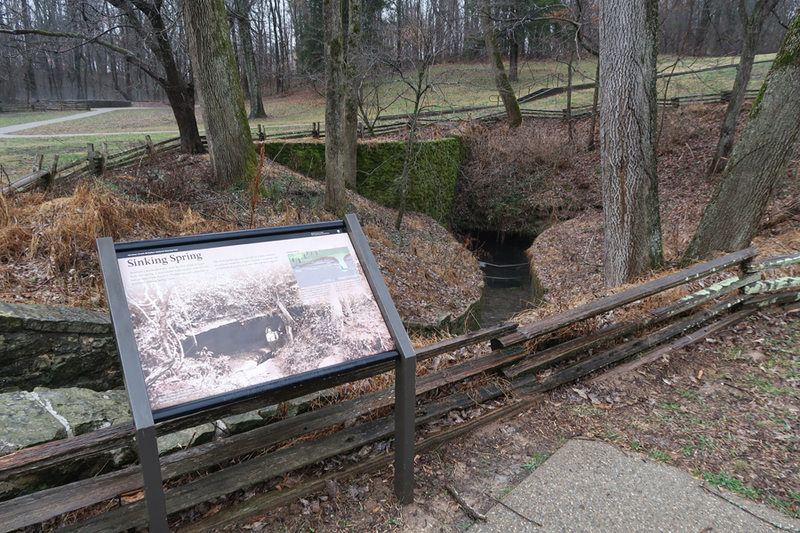 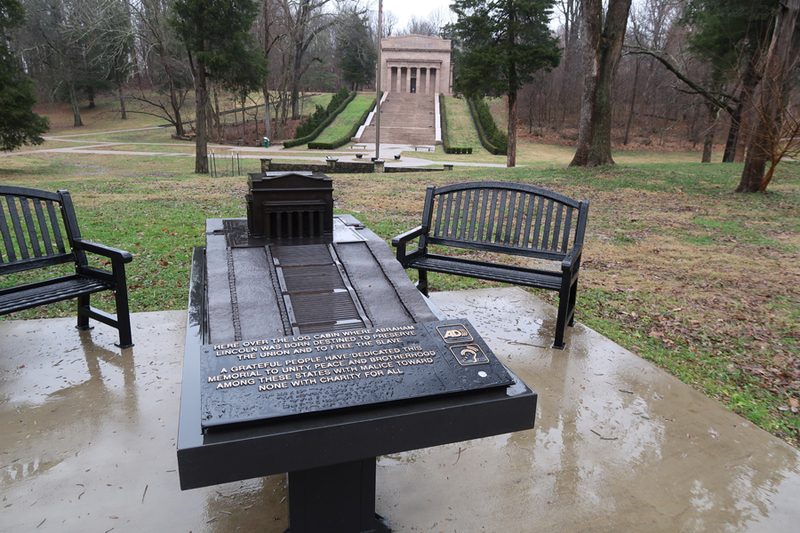 A wood cabin, originally thought to be the home of the Lincoln family, is inside the Memorial. 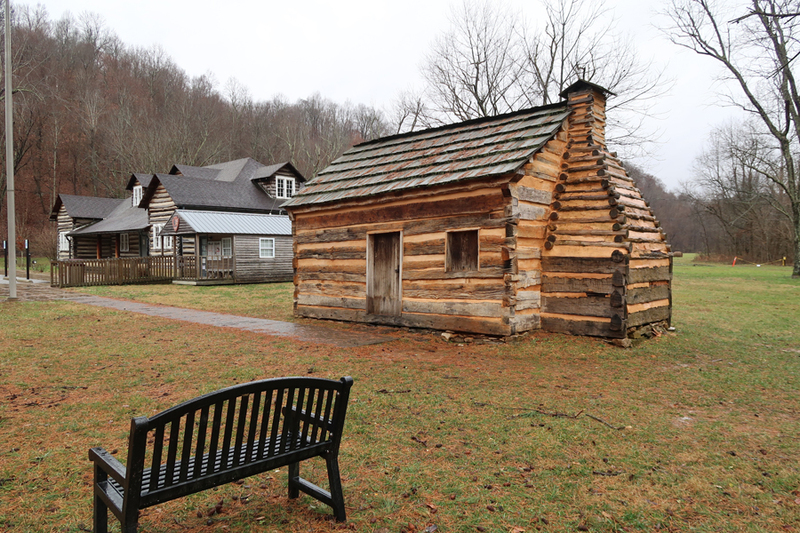 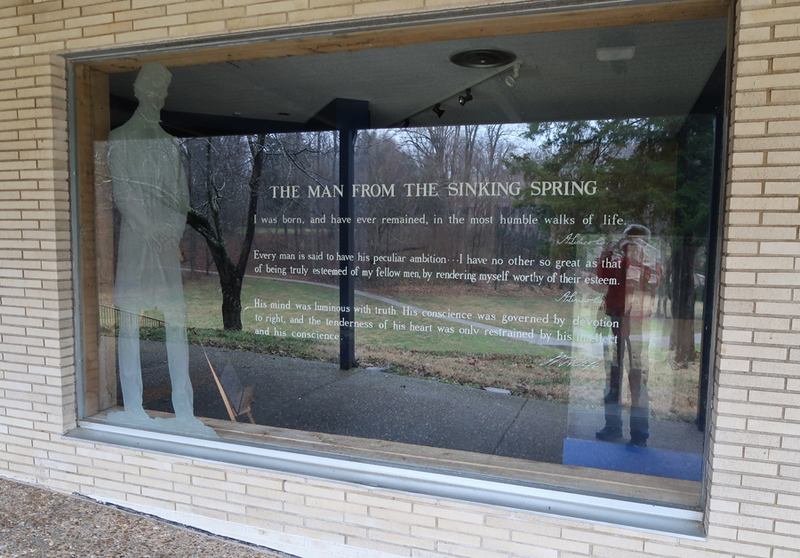 Abraham Lincoln was born on 2/12/1809 in a log cabin here at Sinking Springs Farm. 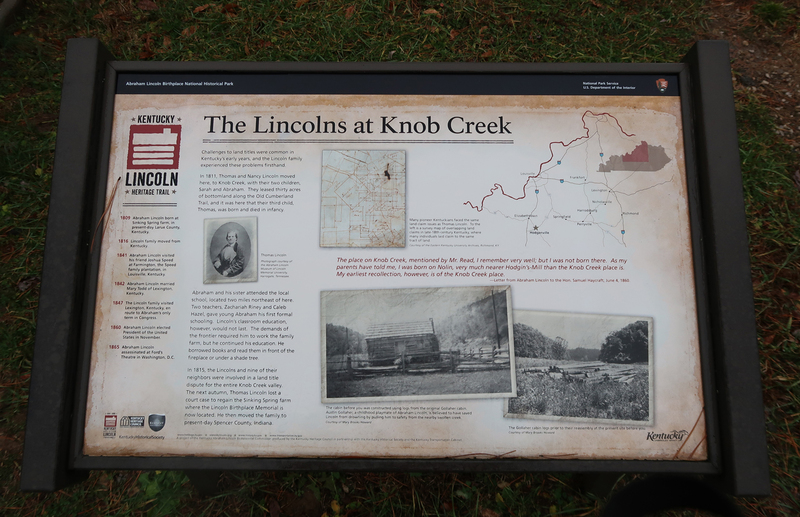 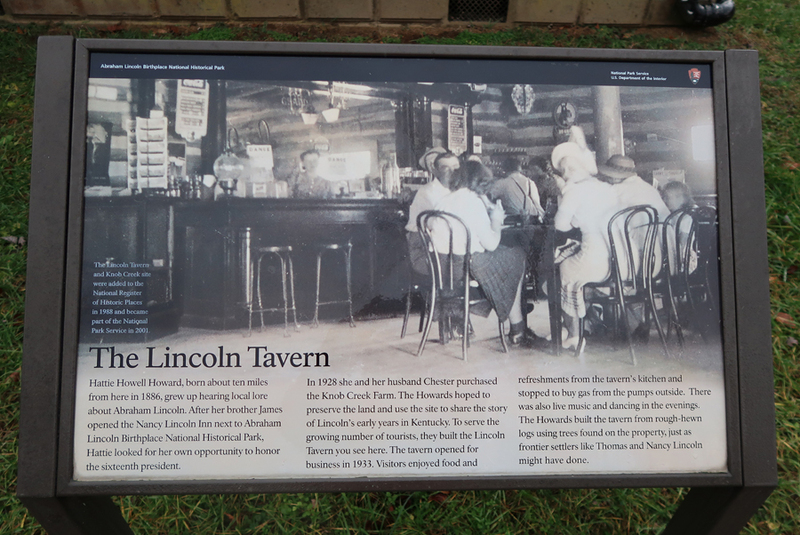 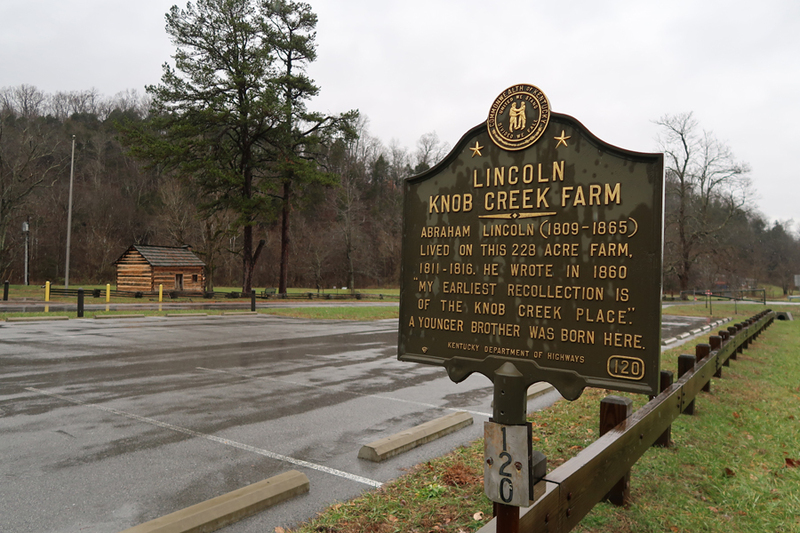 We then drove 10 miles north to the Lincoln Knob Creek Farm where Abe lived from age 2 to 7. 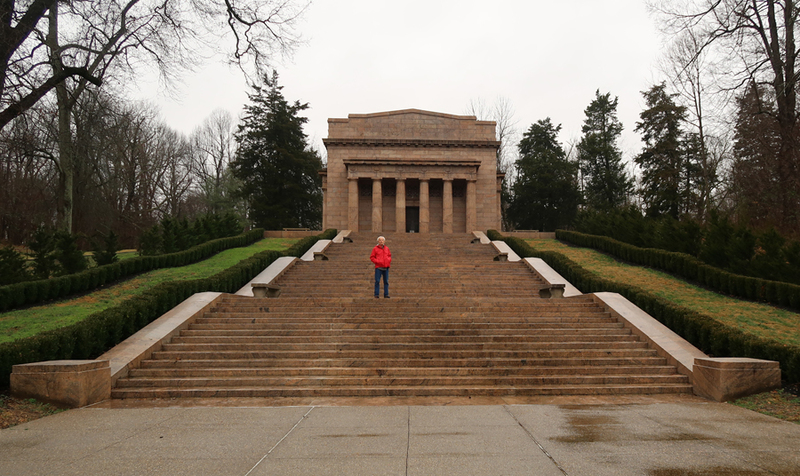 The Lincoln family then moved again in 1816 crossing the Ohio River into IN. 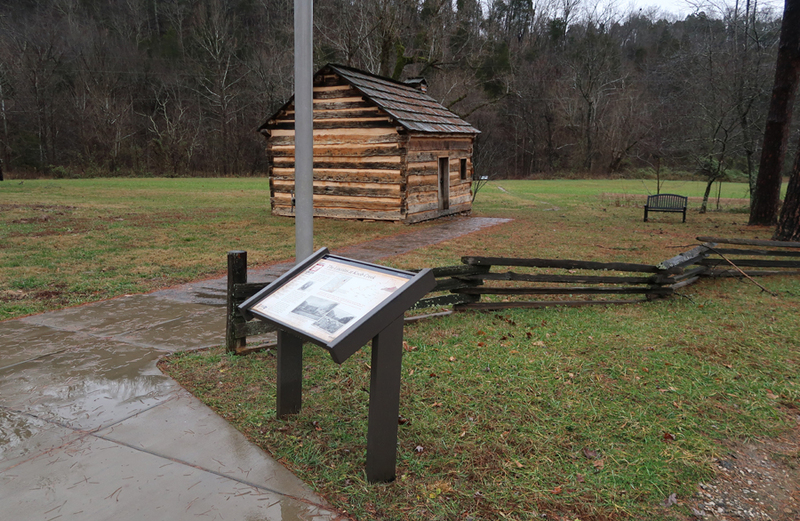 The Lincoln Boyhood Home National Memorial tells the story of Lincoln’s life from age 7 until 21 (1830), when the family moved to IL. 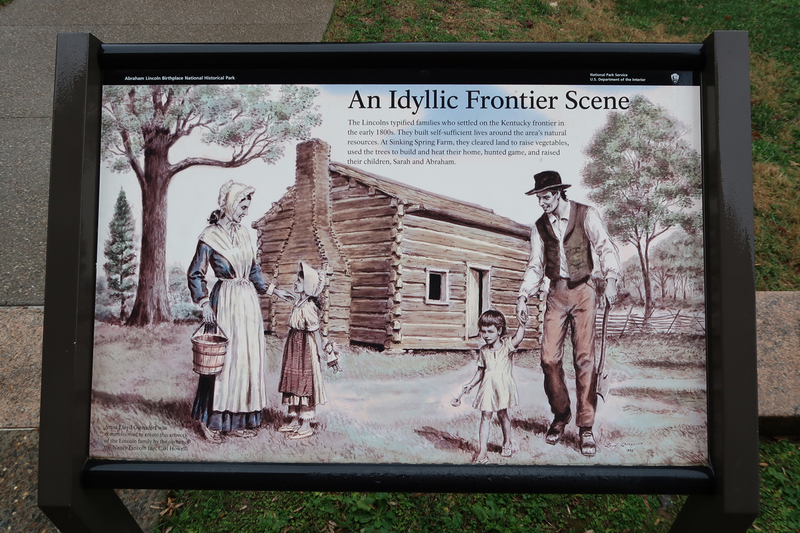 An additional 3hrs driving took us to Peter and Heather’s home in Franklin TN. 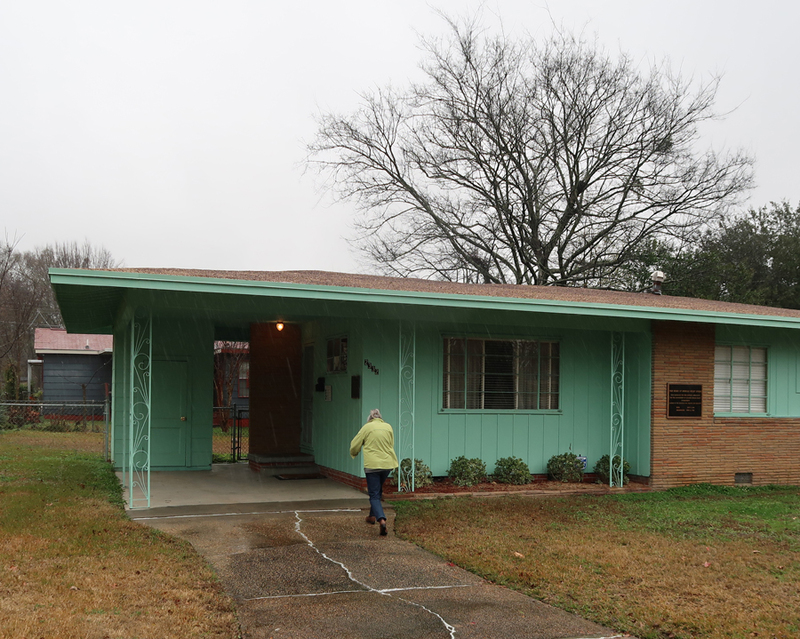 We ate home-made chili and watched the ball drop in NYC on TV (ET). 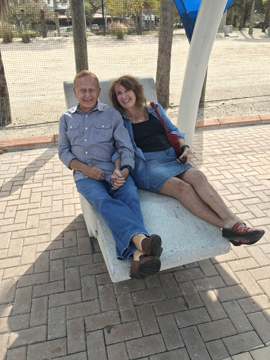 Then these two old folks went to bed at 11pm CT!!! 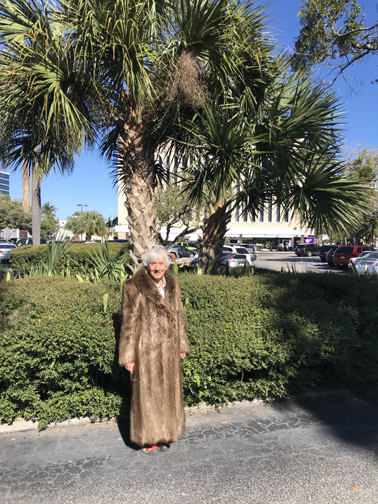 1/1/2019 Tu – Happy New Year! 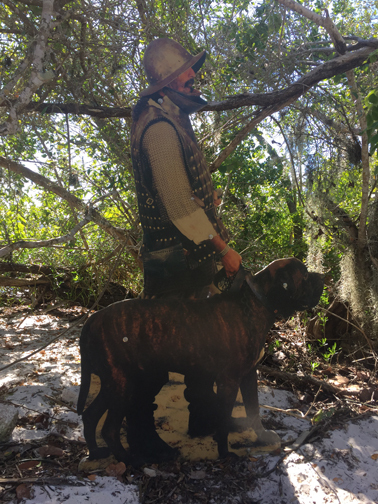 Walked the dogs with Peter, watched football (e.g. 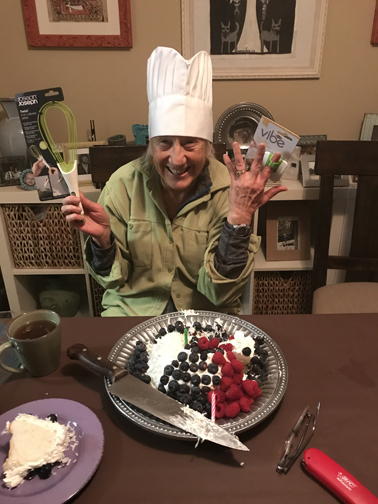 Ohio State 28, Washington 23, in the Rose Bowl), had BBQ ribs, and P & H did a Pre-Birthday Birthday celebration for Helen (cake, presents, etc.). 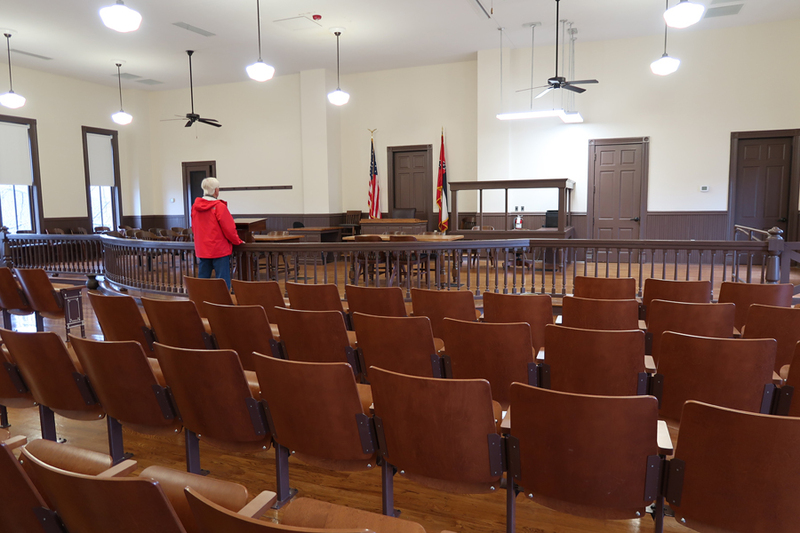 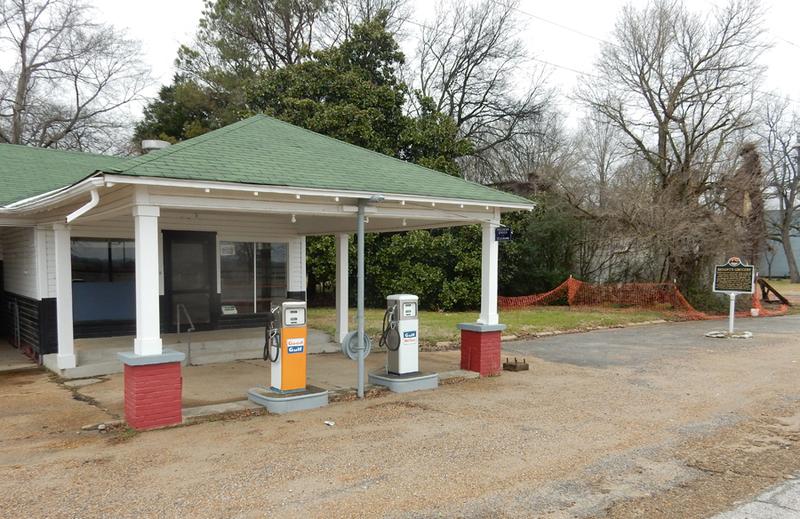 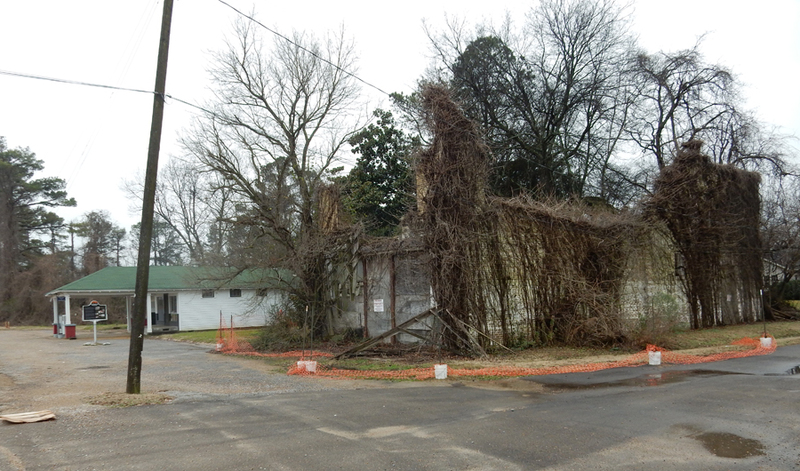 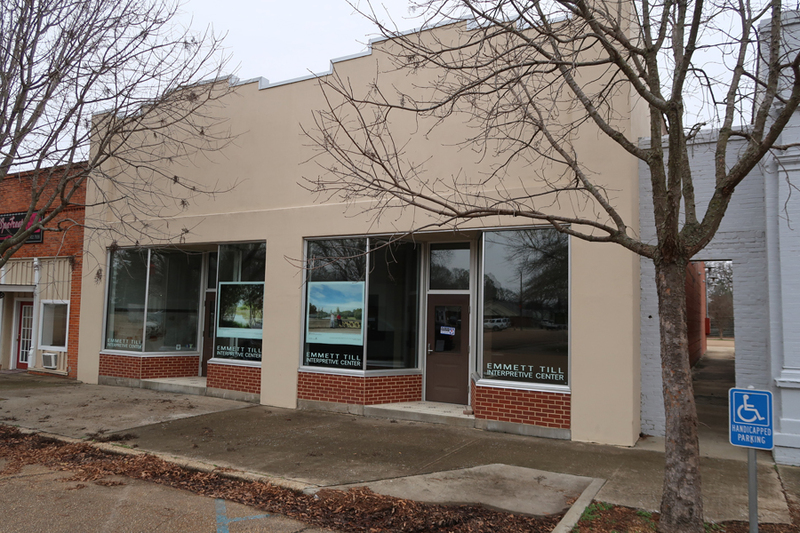 The children of unrepentant juror Ray Tribble own it and obtained a MS state historic-preservation grant for civil rights-related projects but used the money instead to restore a 1950s service station next door, which was basically empty during our visit. 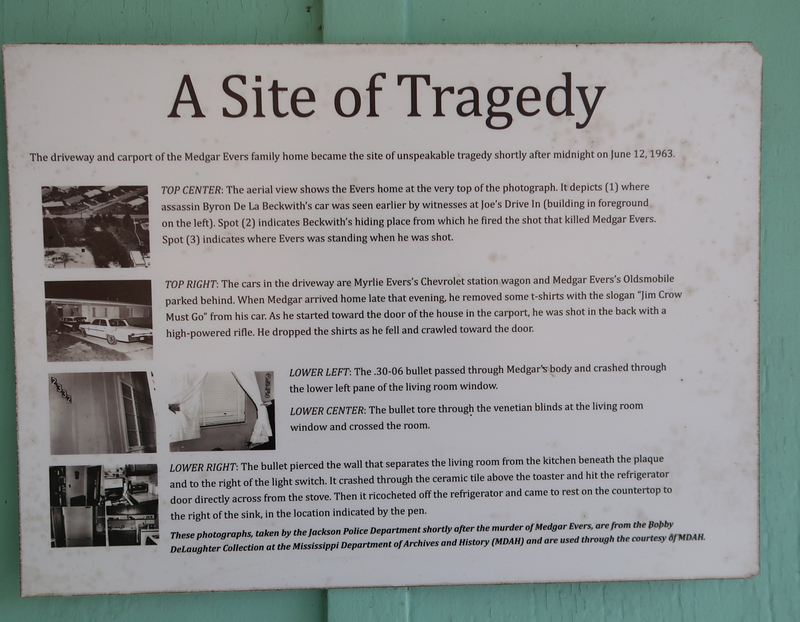 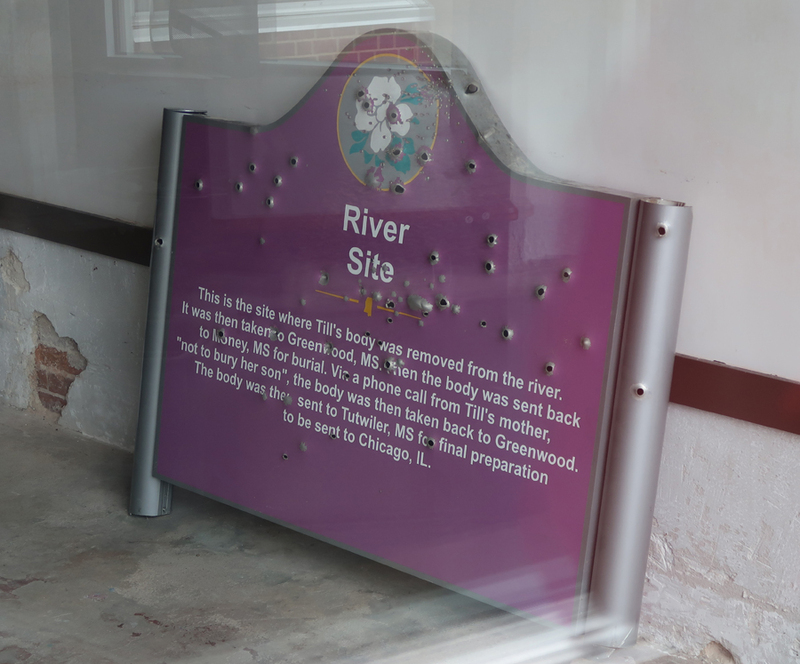 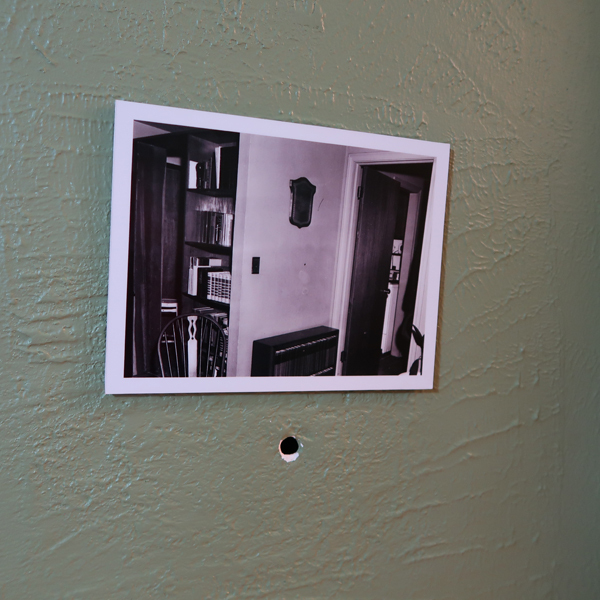 Inside the window was a bullet riddled sign that had recently been removed from the spot on the Tallahatchie River where Till’s body was found. 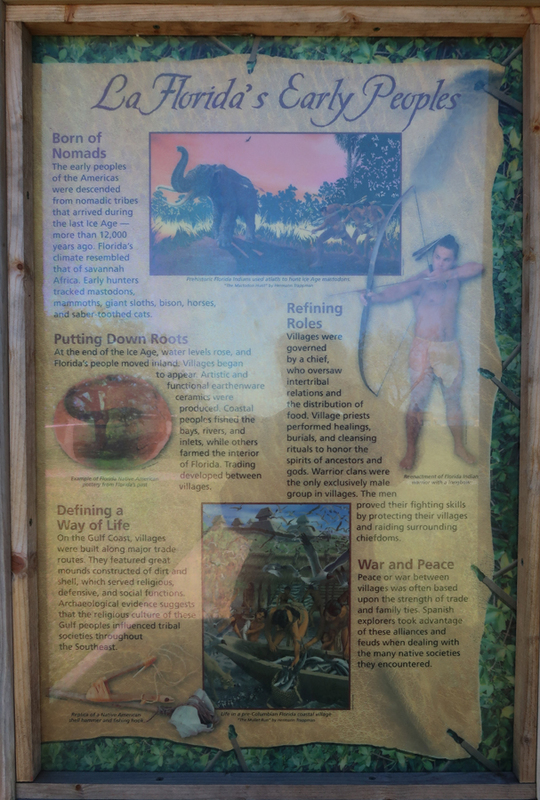 The new sign outside of Glendora MS already has bullet holes in it! 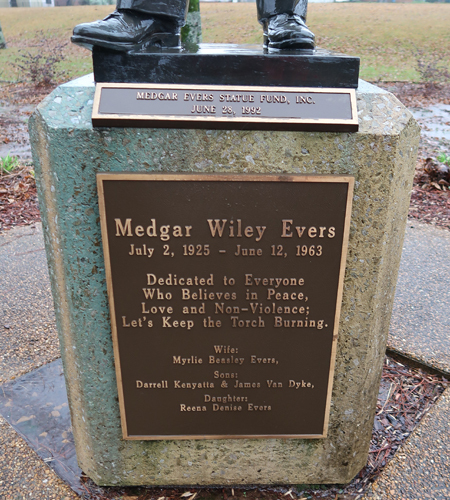 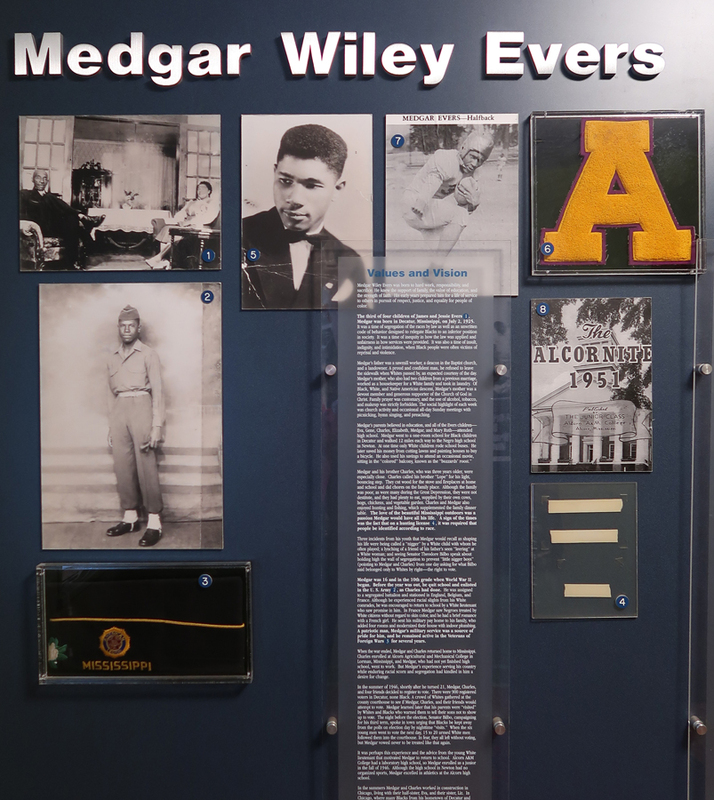 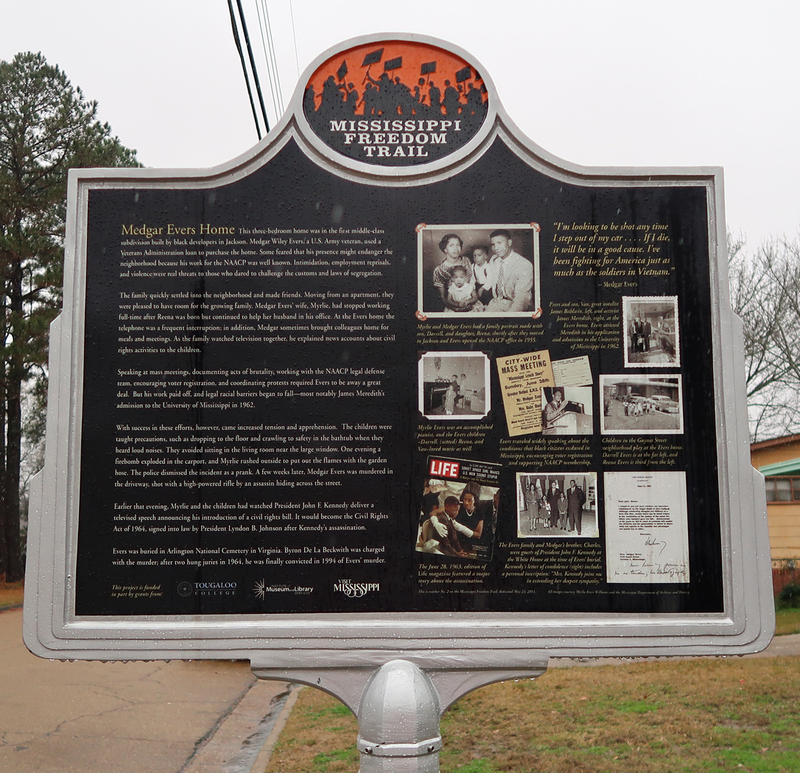 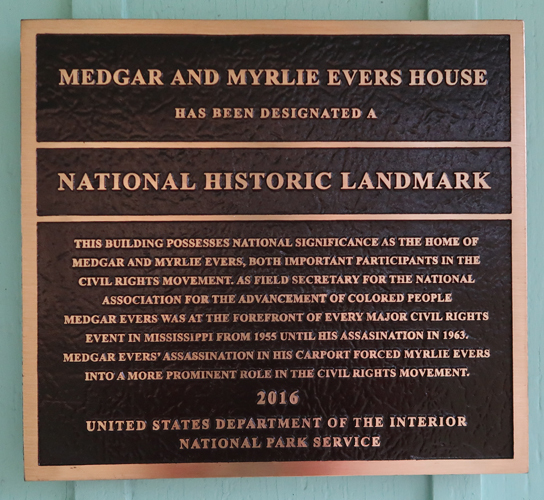 We then drove into Jackson MS to the newly authorized Medgar Evers National Monument. 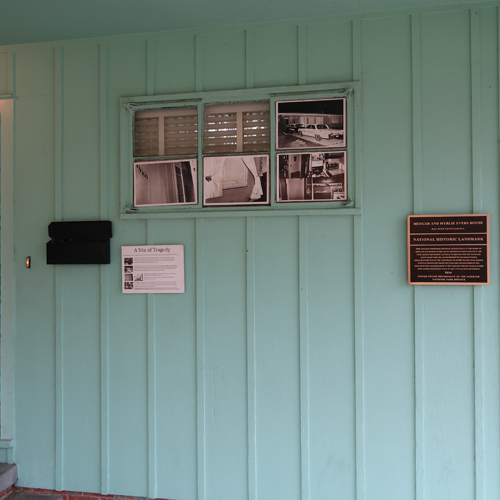 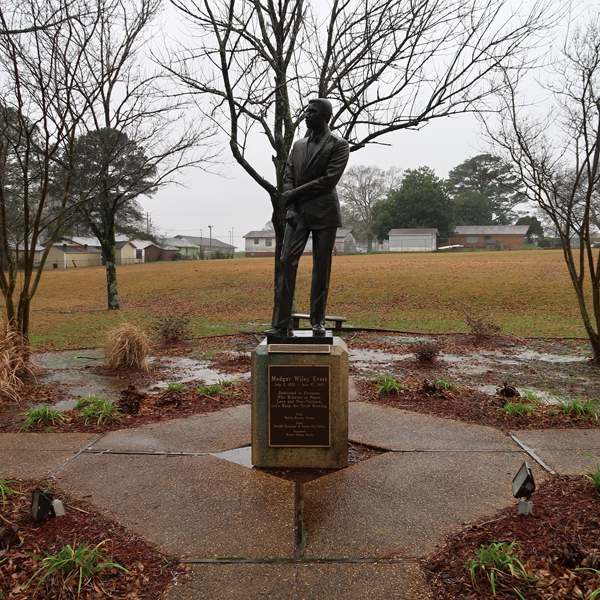 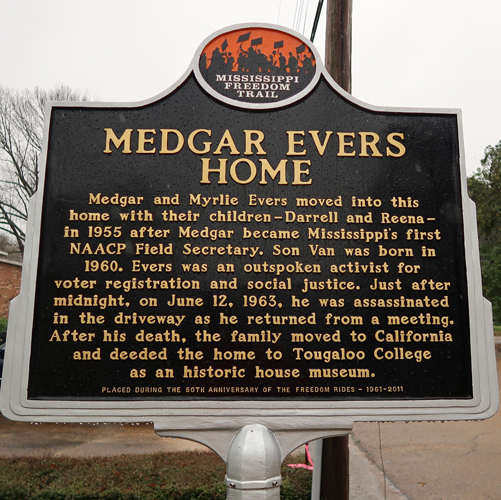 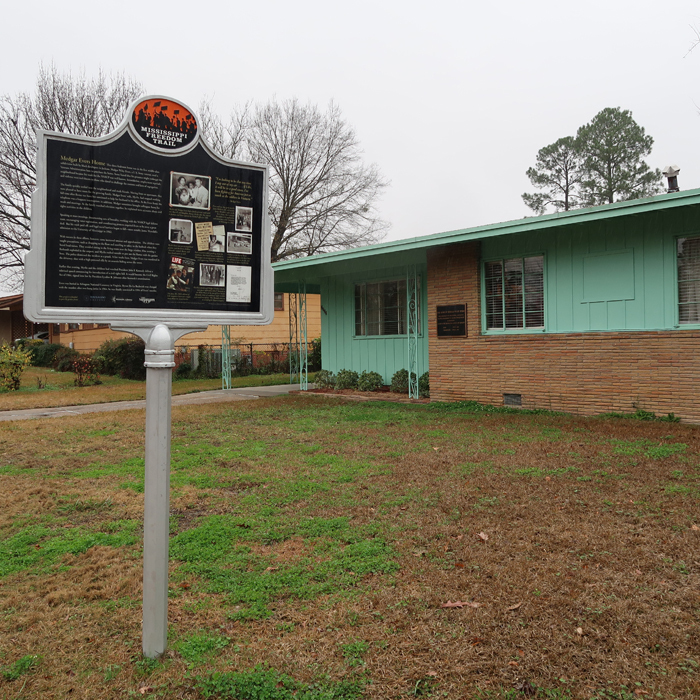 Medgar Evers’s home, the site of his assassination in 1963, is owned by Tougaloo College. 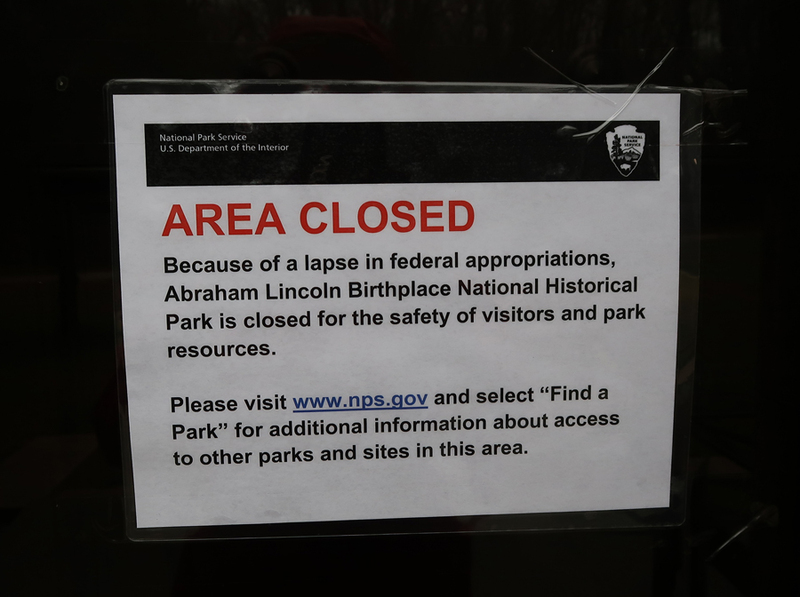 It is in the process of being transferred to the NPS. 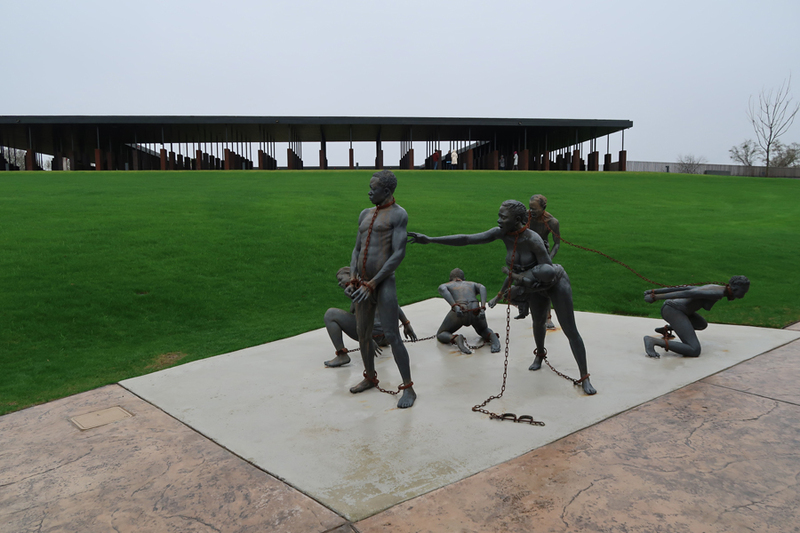 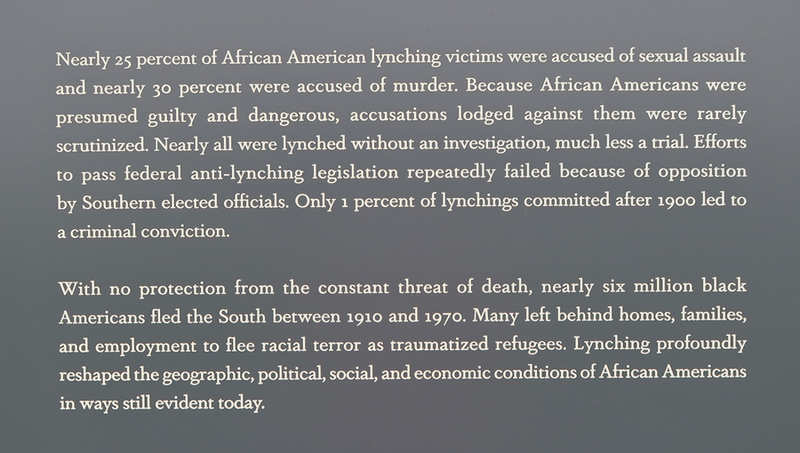 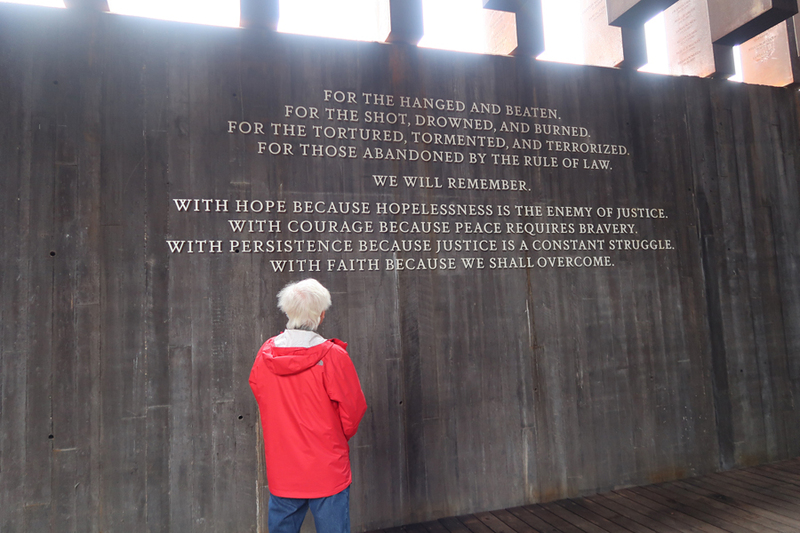 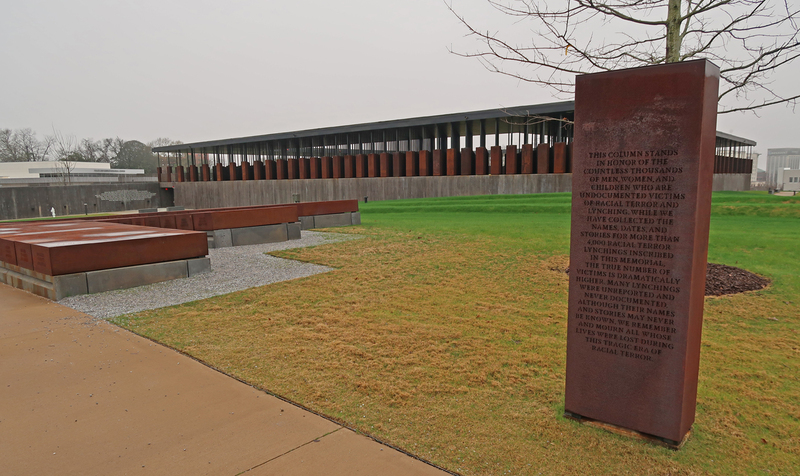 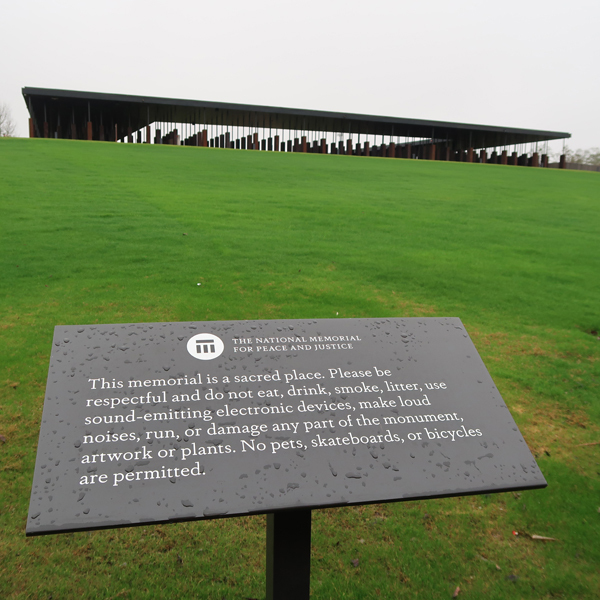 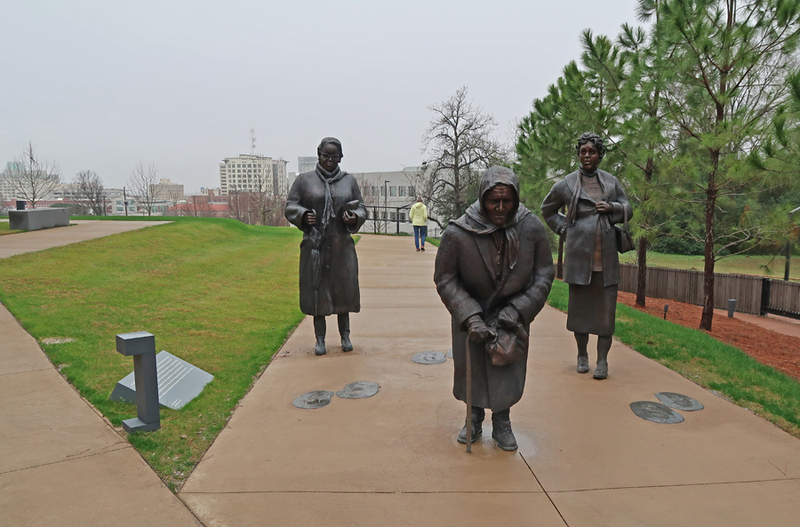 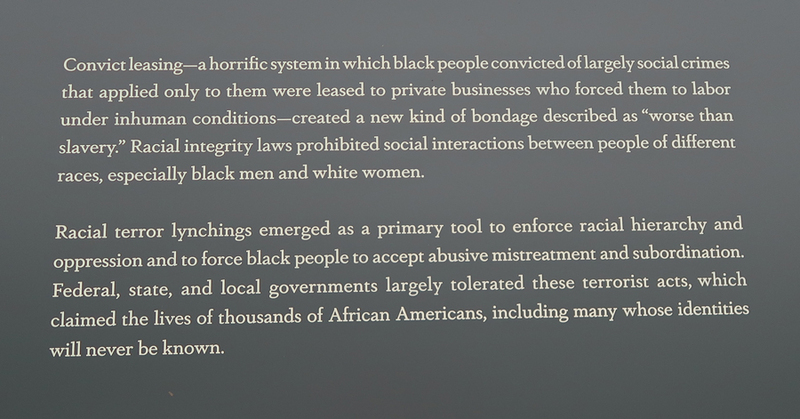 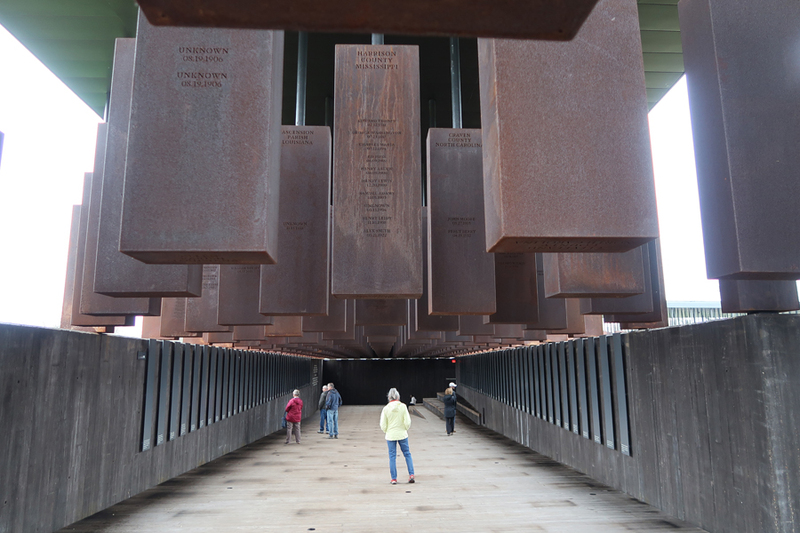 1/3 Th – We arrived at the National Memorial for Peace and Justice, also known as the National Lynching Memorial, just after it opened at 9am. 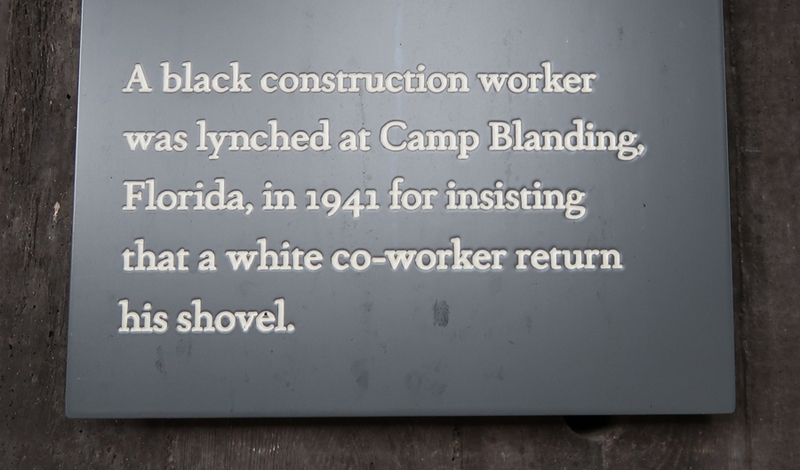 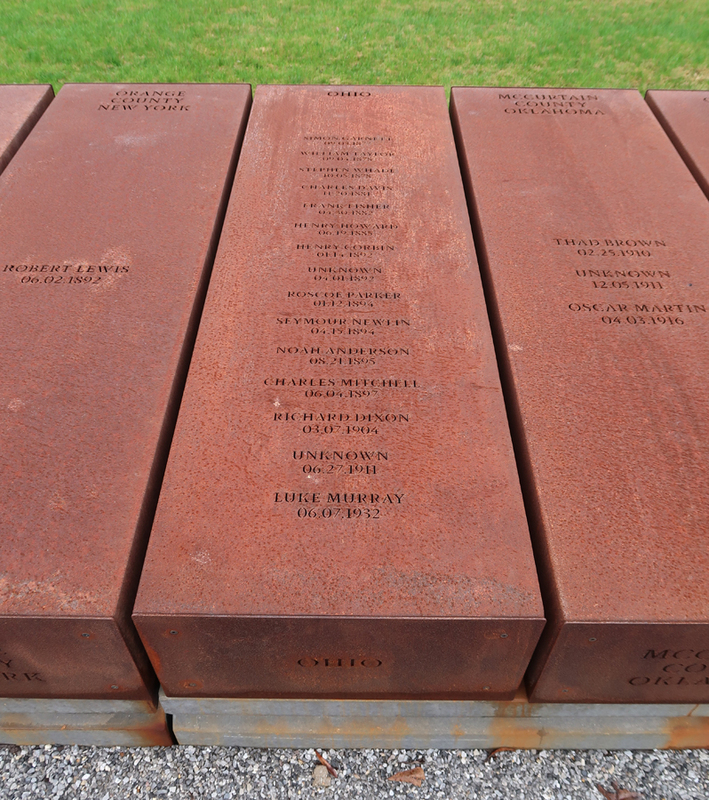 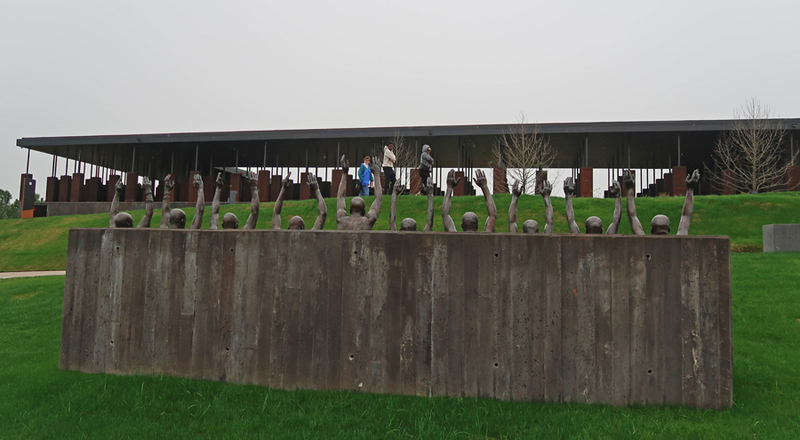 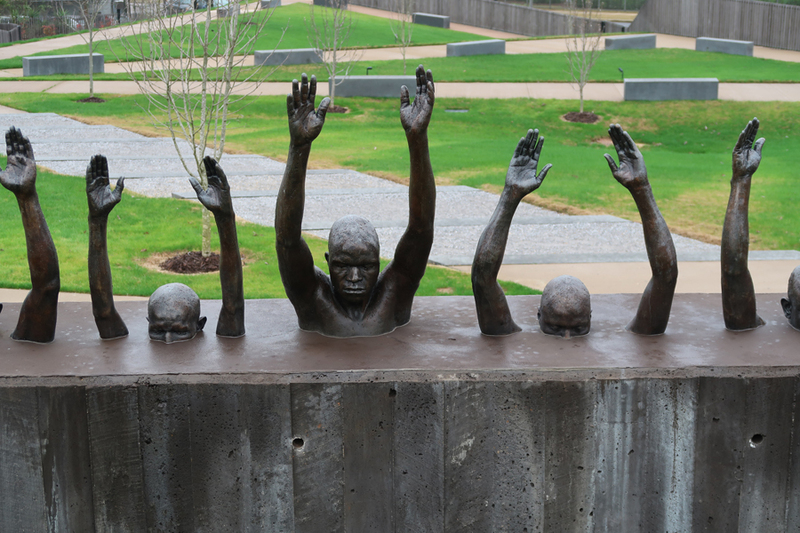 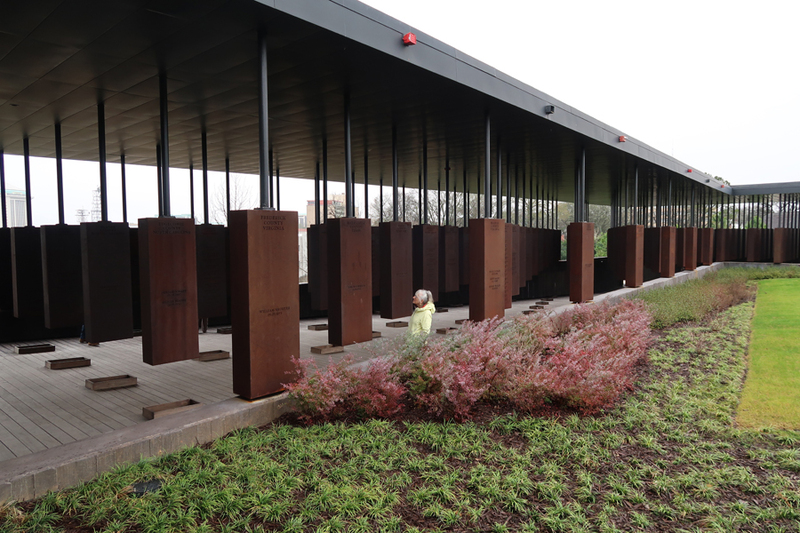 This is a memorial to the more than 4400 African American men, women, and children who were hanged, burned alive, shot, drowned, and beaten to death by white mobs between 1877 and 1950. 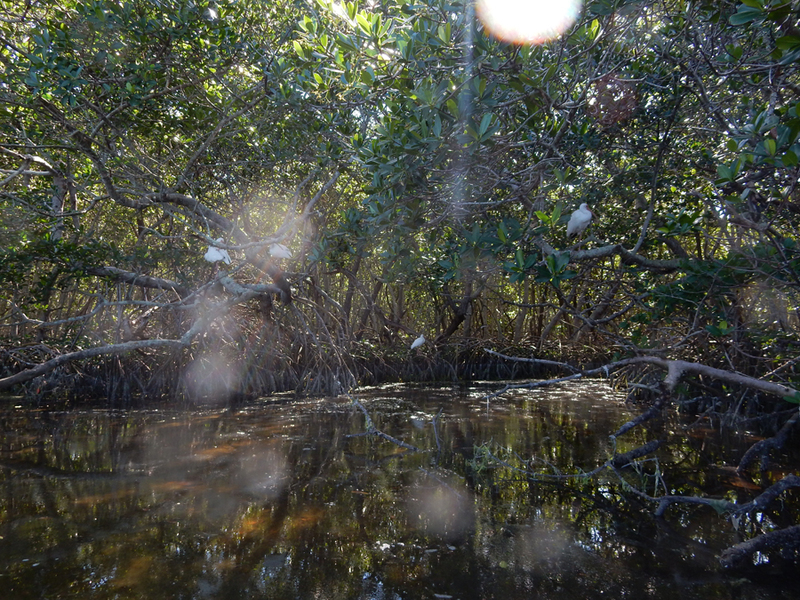 Mind you, there were many, many, more – these are the ones that have been documented! 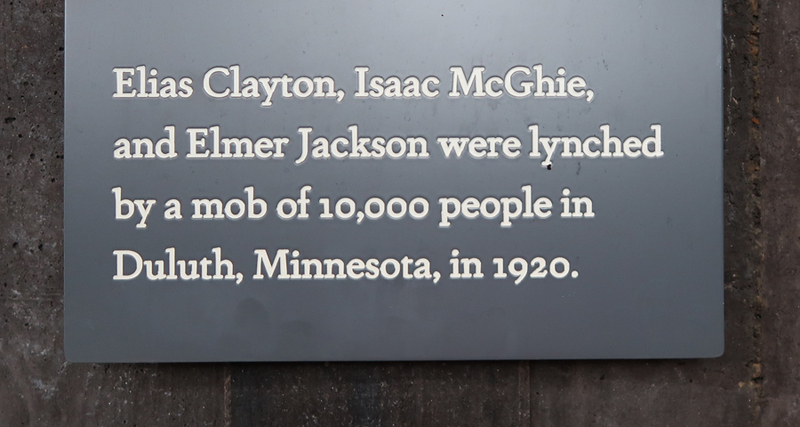 AND the number does not include those killed since 1950. 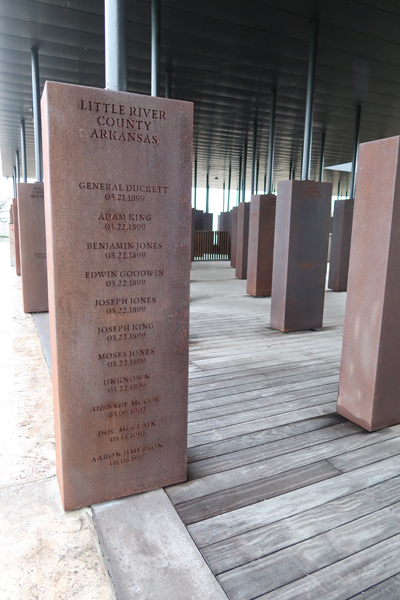 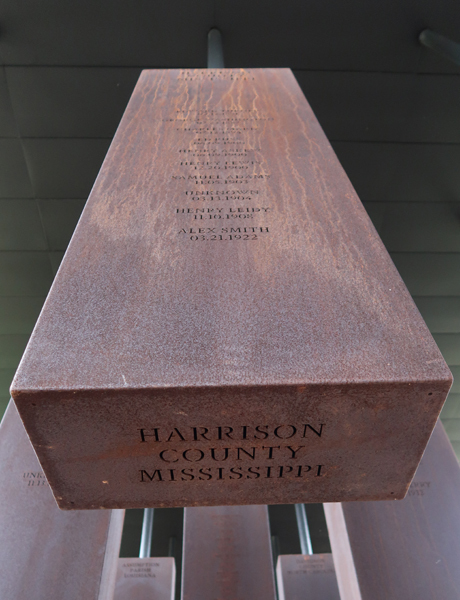 The structure contains over 800 steel monuments, one for each county in the U.S. where one or more racially related killings took place. 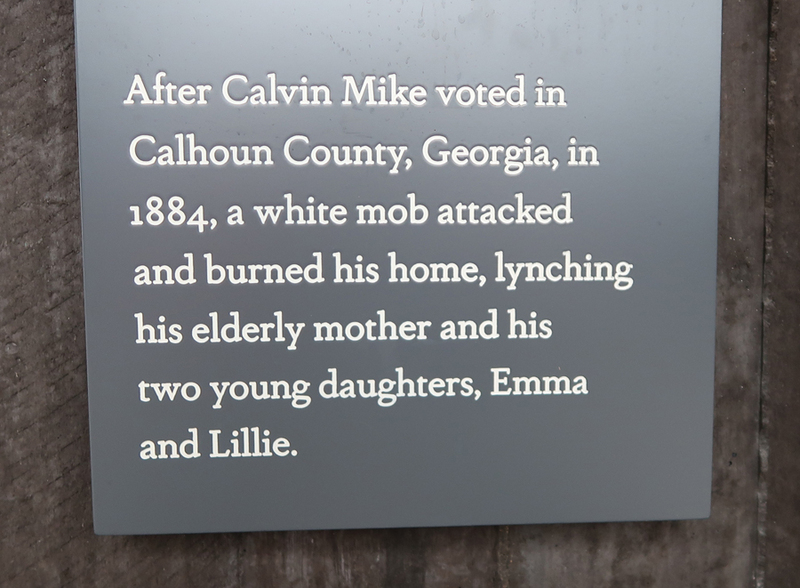 The name(s) of the victim(s) is/are “engraved,” i.e. 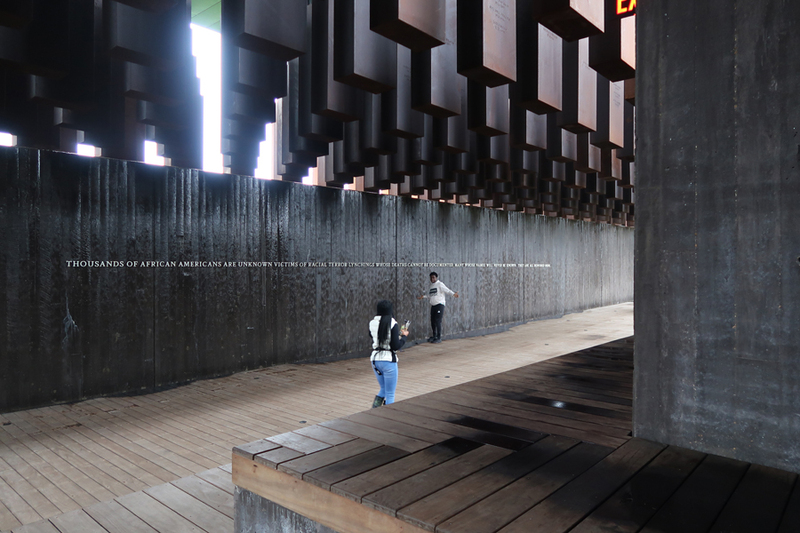 cut-through the steel. 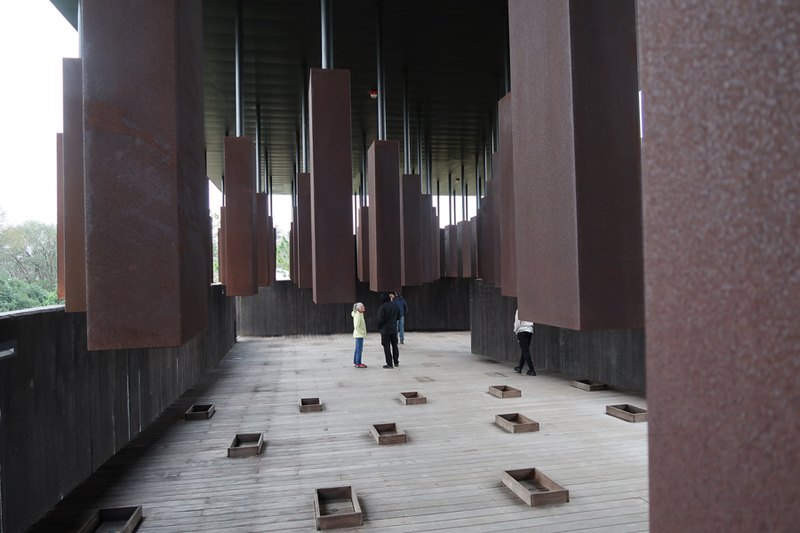 As you enter, the first side of the rectangle has the steel monuments hanging with the bottom just off the floor. 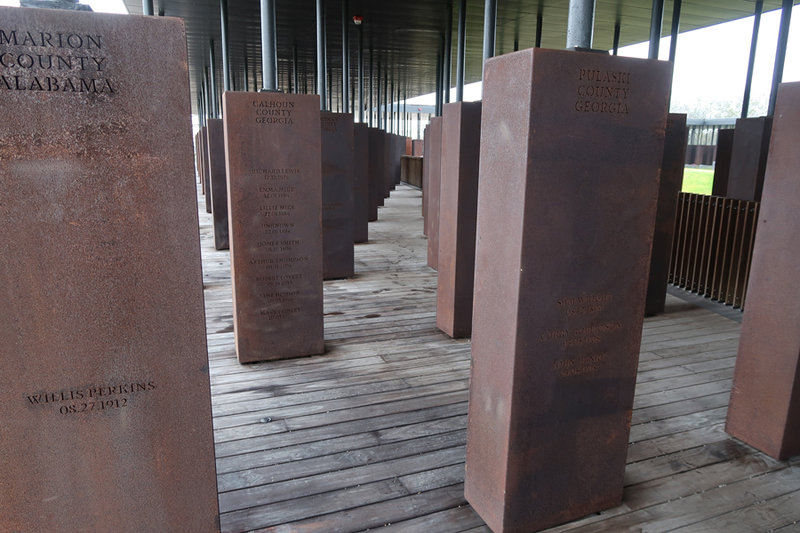 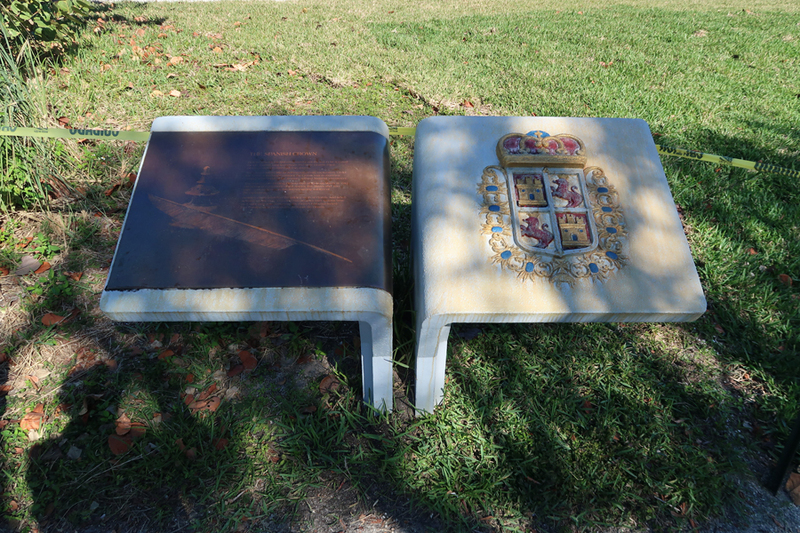 Just outside the memorial are duplicate steel monuments that can be taken and erected in the states/counties where these tragedies occurred. 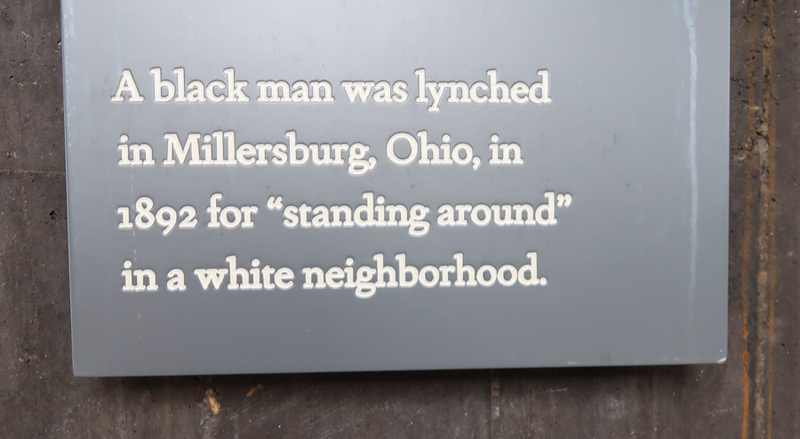 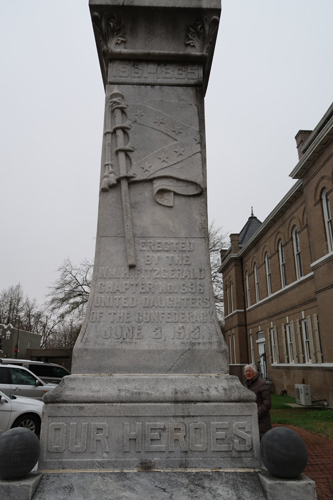 OHIO – Richard Dixon, third name from the bottom, was lynched in Clark County OH on March 7, 1904 – that is where we live! 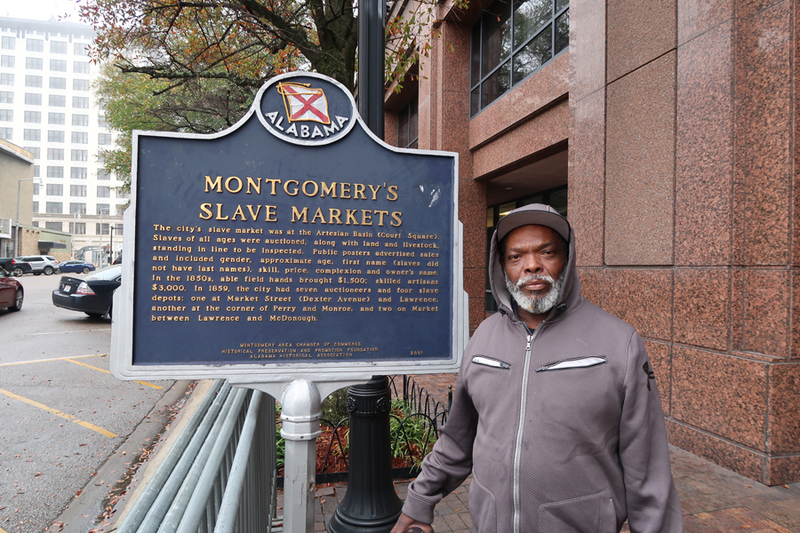 Frank, a 55-year-old diabetic ex-marine, said he wanted to work but couldn’t find a job. 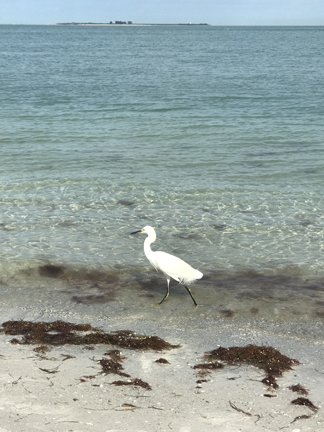 He selected chicken wings, a salad, and hot tea for lunch. 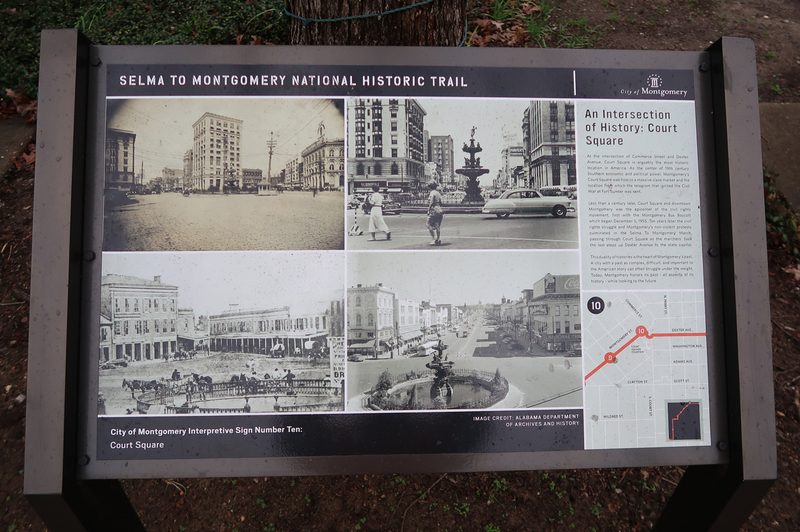 The Selma to Montgomery Voting Rights March (54 miles) took place March 21-25, 1965. 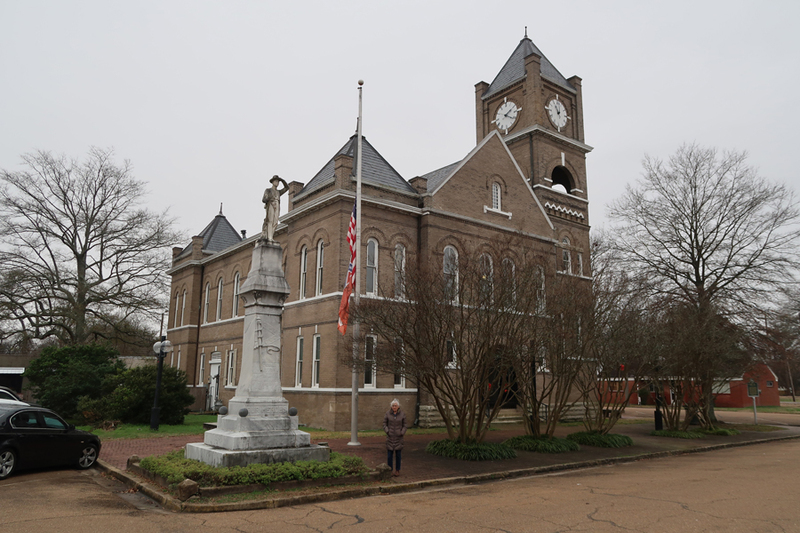 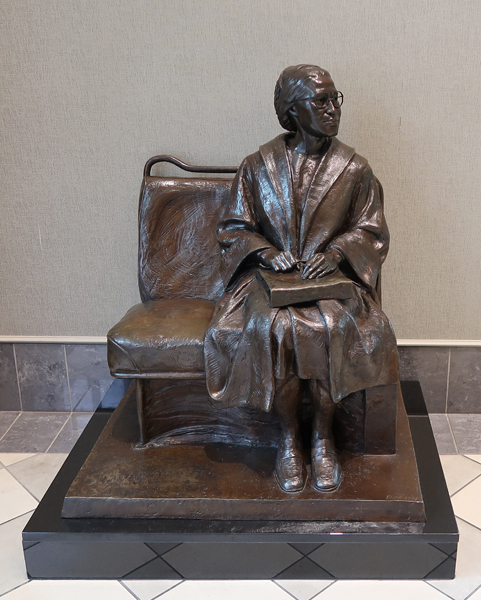 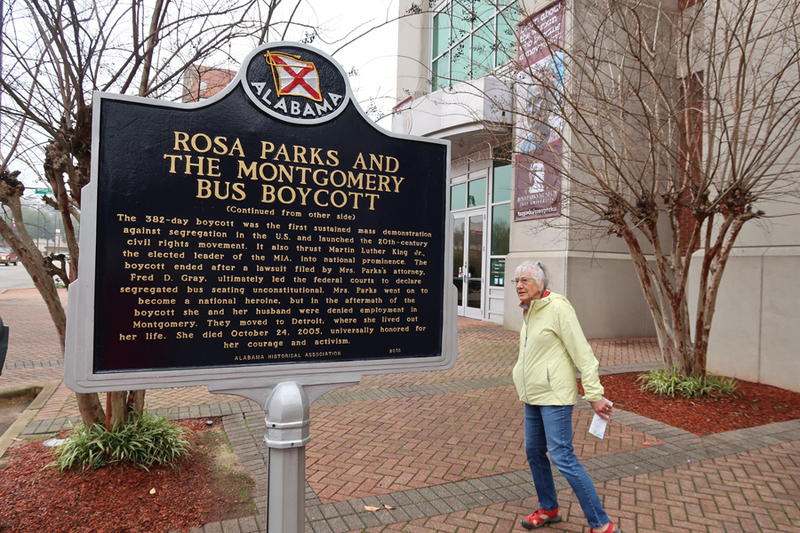 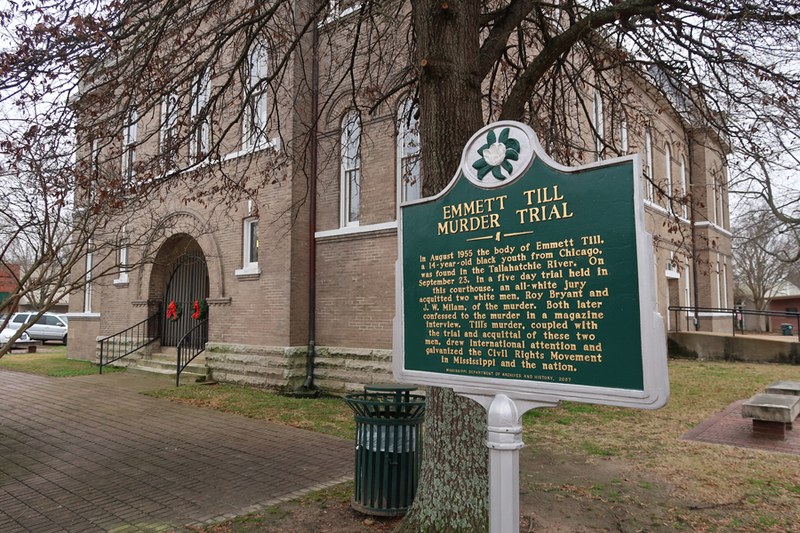 It began at Brown Chapel AME Church in Selma and ended at the AL State Capitol. 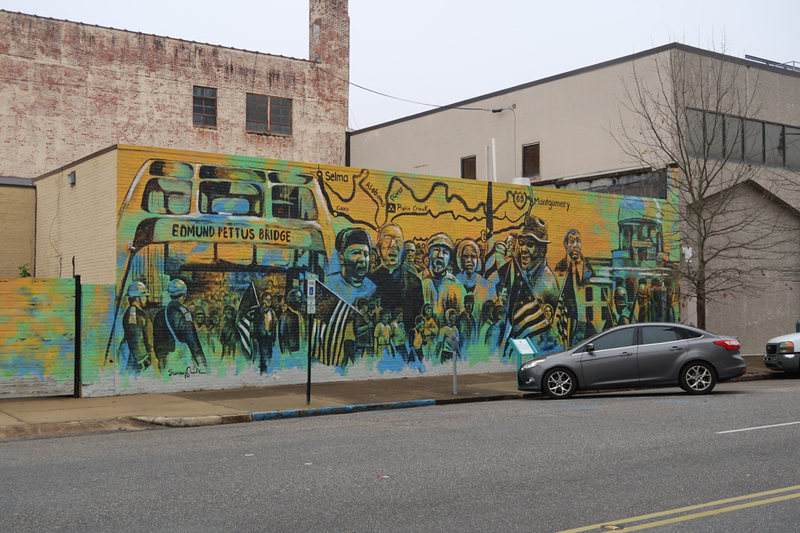 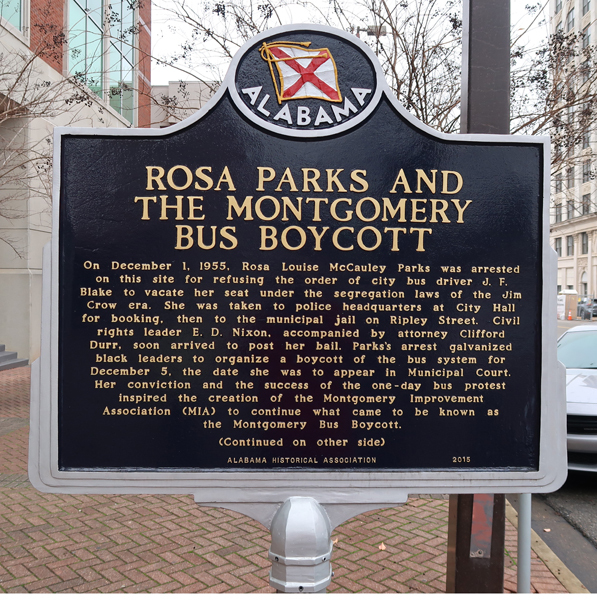 The first March attempt took place on March 7th and became known as “Bloody Sunday.” When the marchers reached the end of the Edmund Pettus bridge over the Alabama River in Selma, they were met by a wall of state troopers blocking US 80. 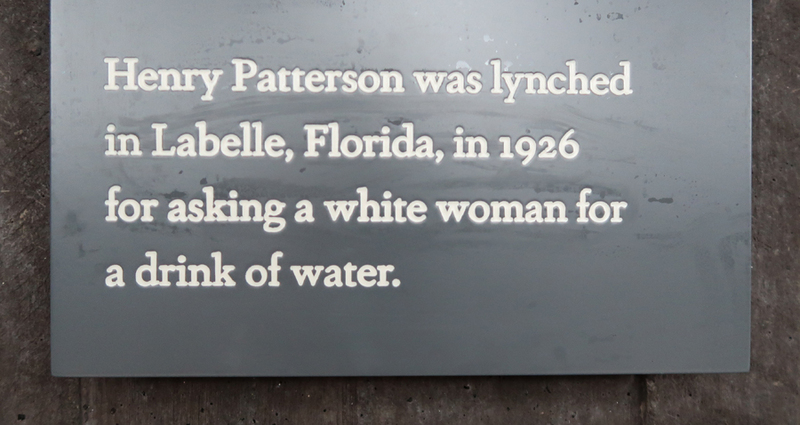 The marchers stopped and asked to speak to their leader. 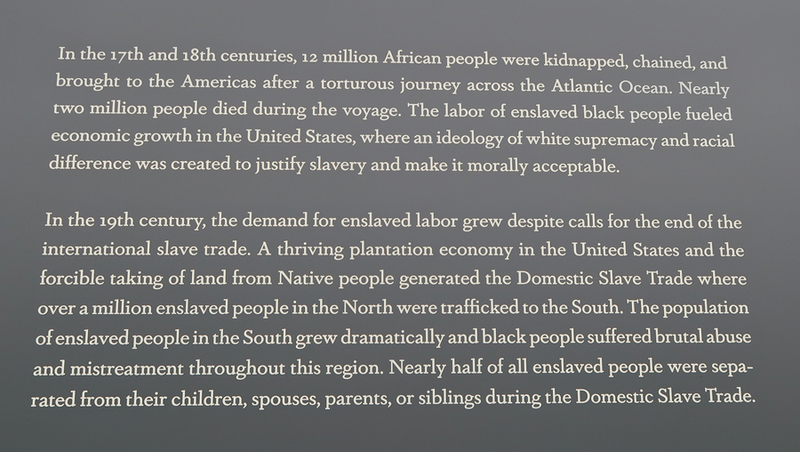 They were given two minutes to return to their homes or church. 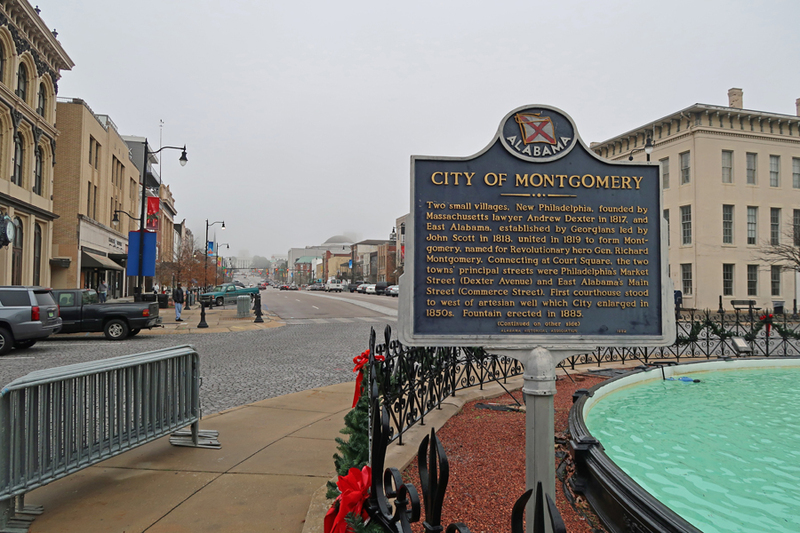 When they did not move, troopers advanced with nightsticks, horses, tear gas, whips, and rubber tubes driving the marchers back through the streets of Selma. 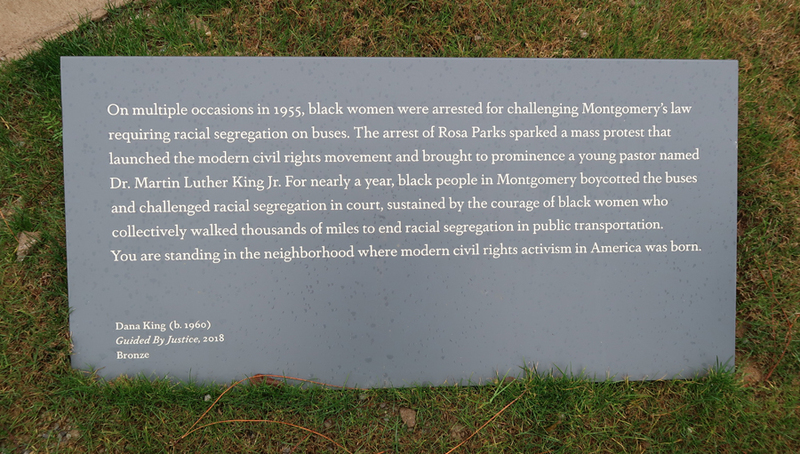 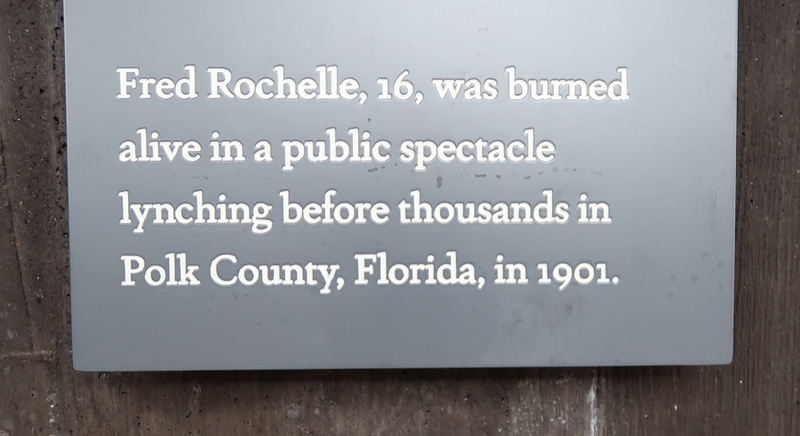 Enraged onlookers called for retaliation – the principle of nonviolence was being tested. 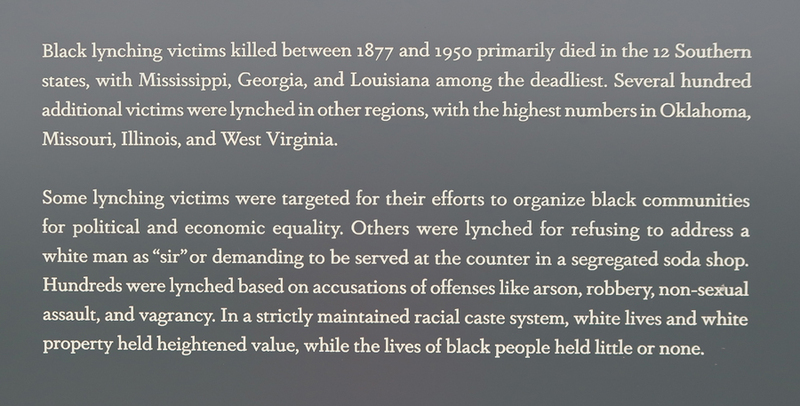 Leaders convinced them that retaliation would only hurt the movement. 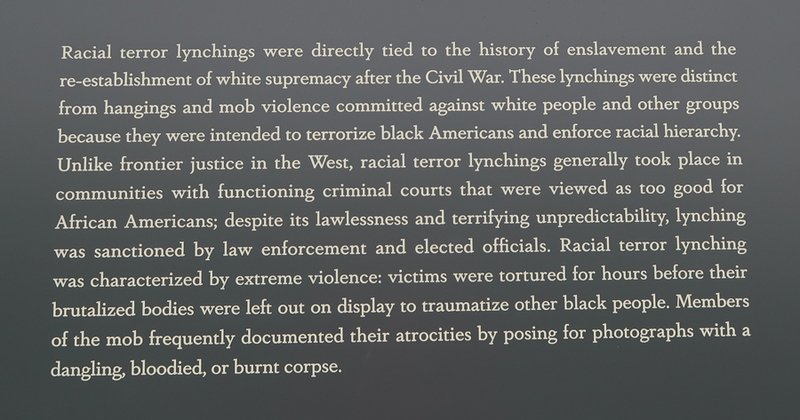 US and international news outlets showed the troopers attacking and beating unresisting marchers blinded and gagging from the tear gas. 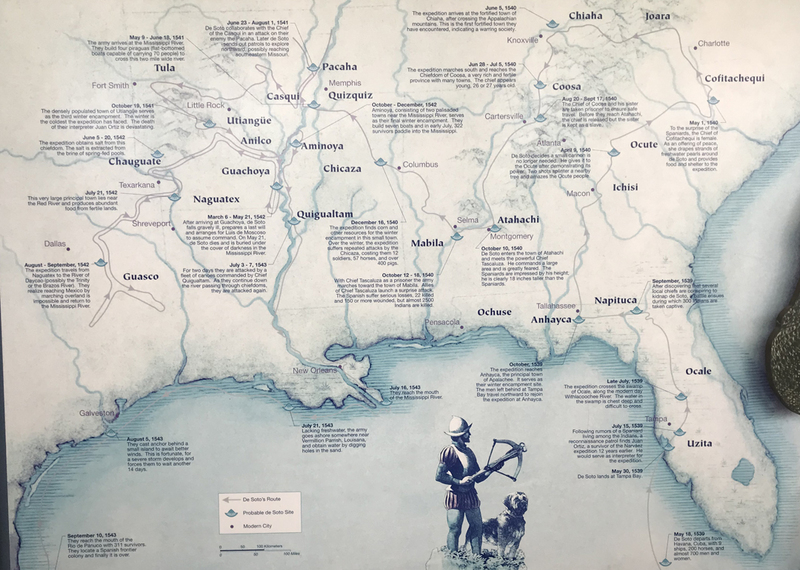 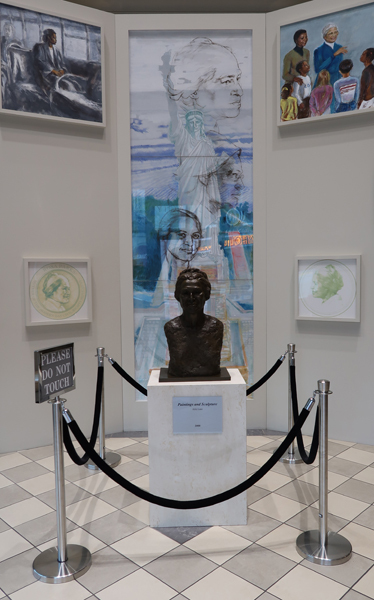 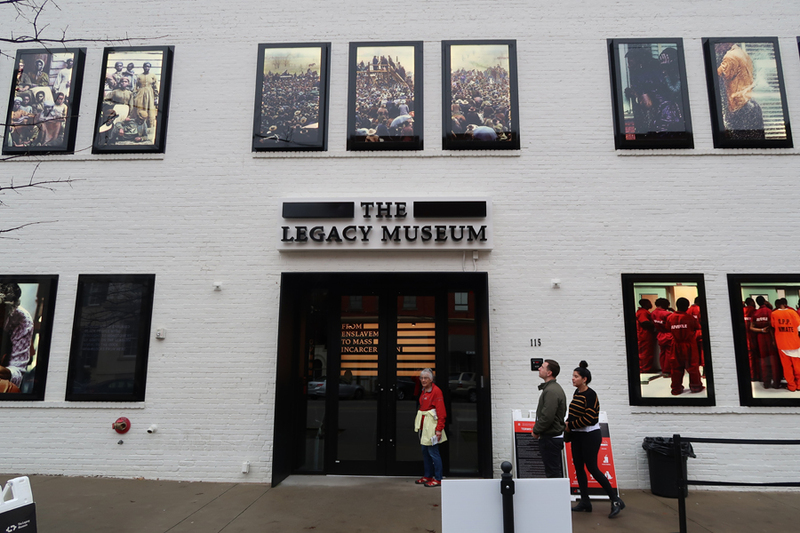 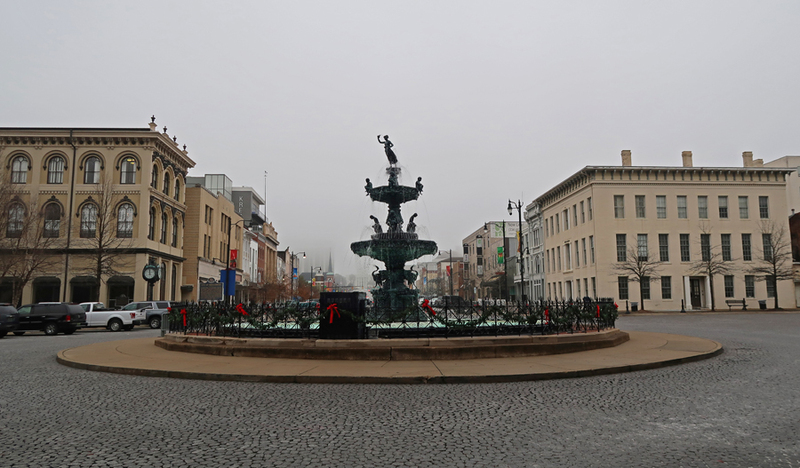 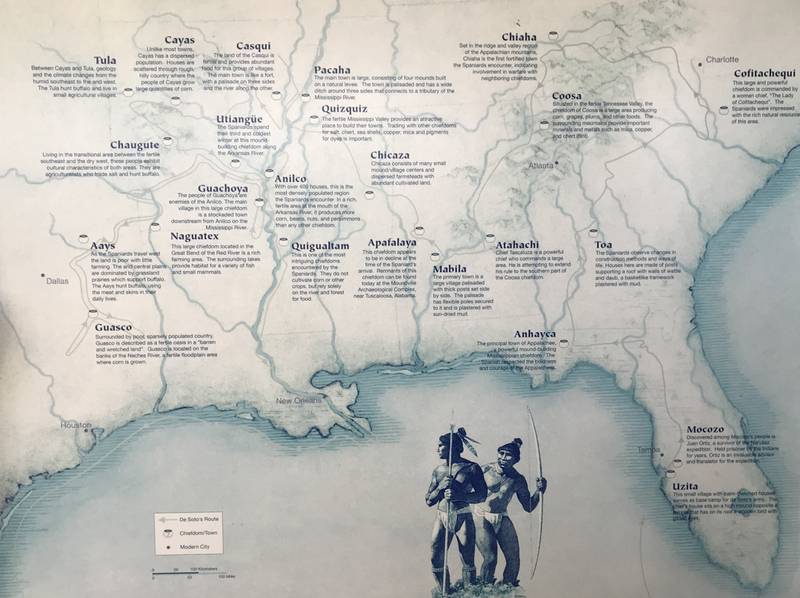 The Legacy Museum is in downtown Montgomery midway between a slave market and the river dock and train station where tens of thousands of enslaved people were trafficked during our Domestic Slave Trade. 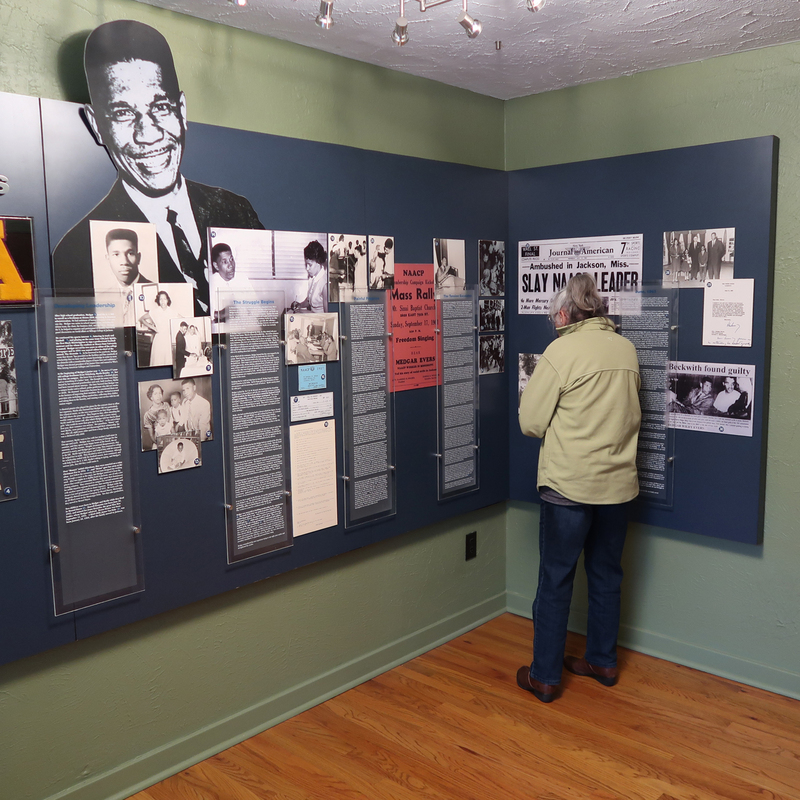 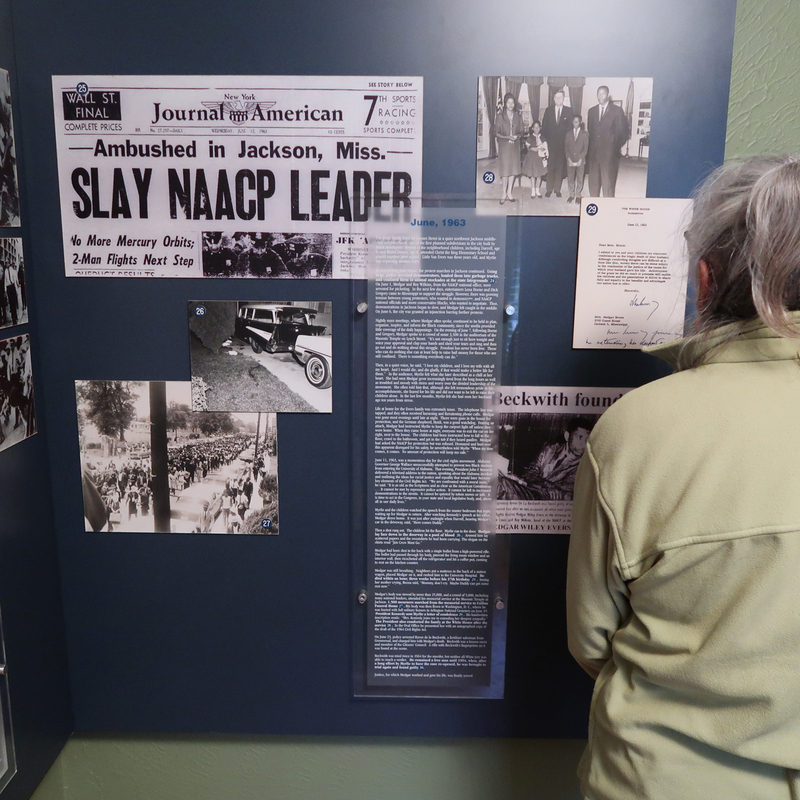 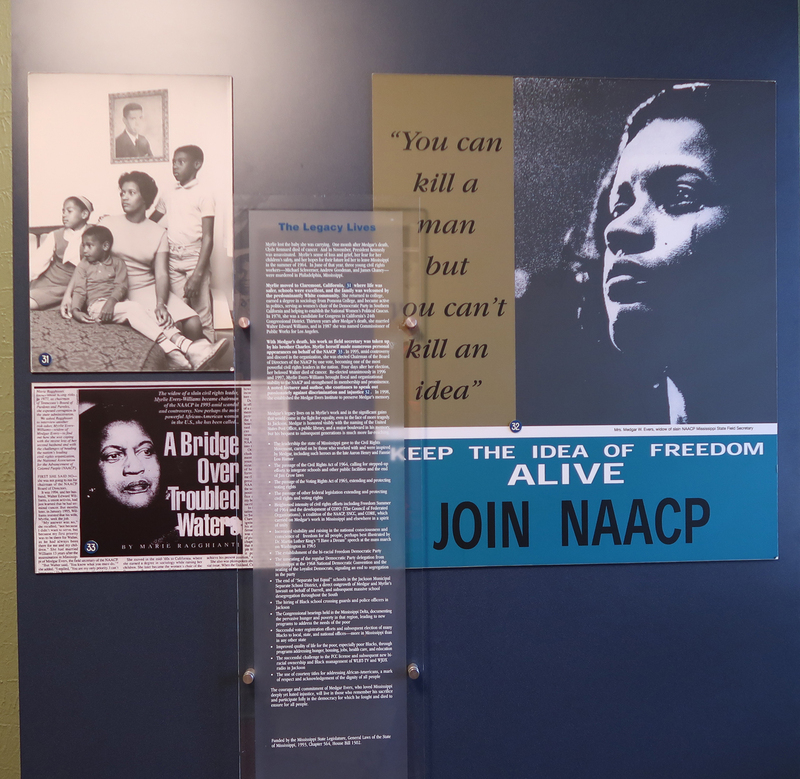 It utilizes the latest technology in telling the story of racial injustice in the US. 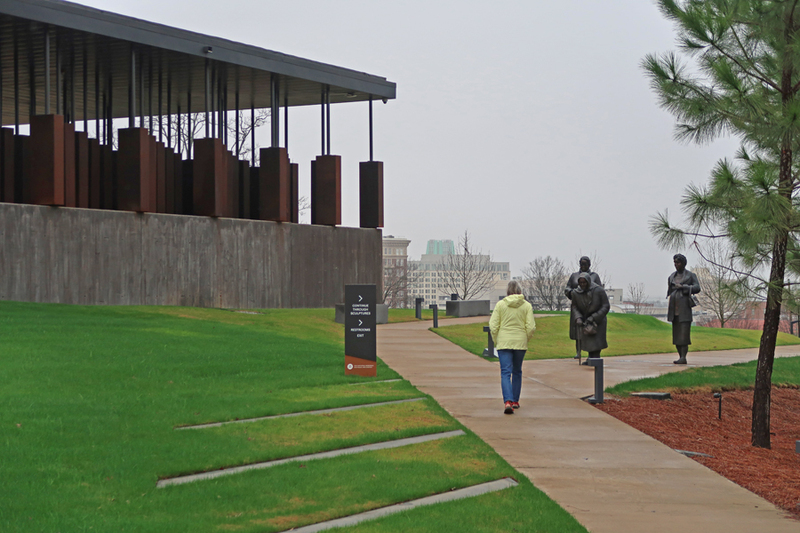 A combined senior ticket for the National Memorial for Peace and Justice and the Legacy Museum is $7. 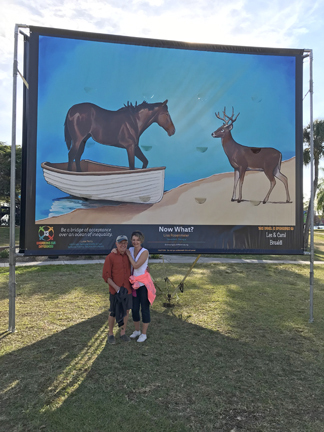 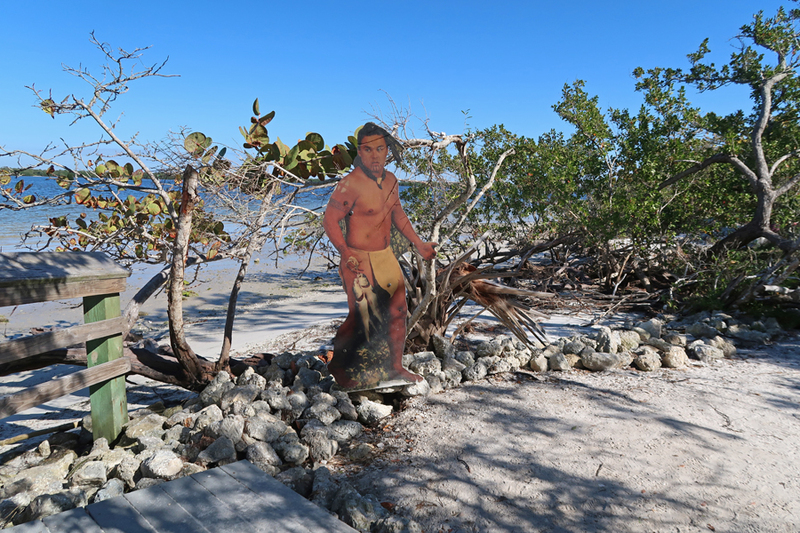 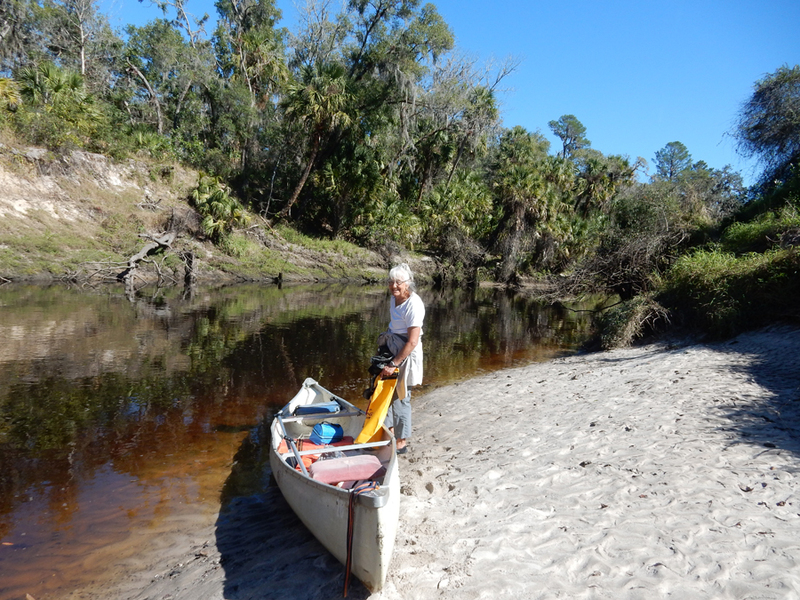 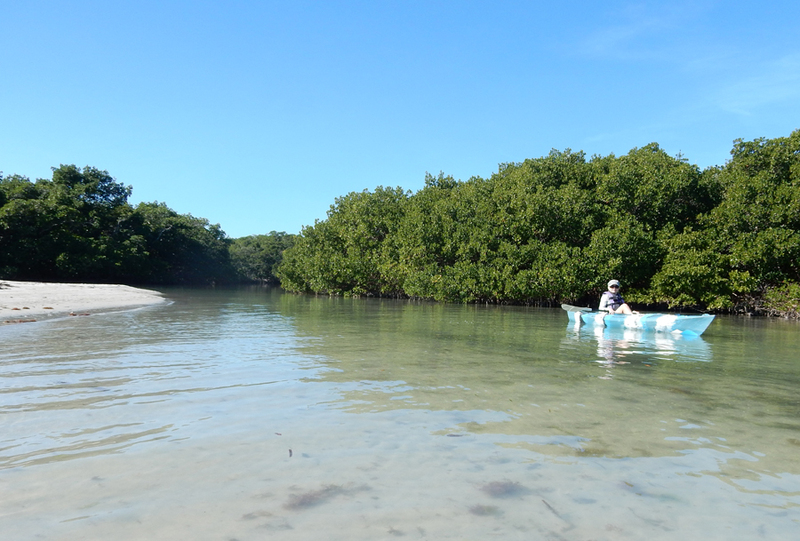 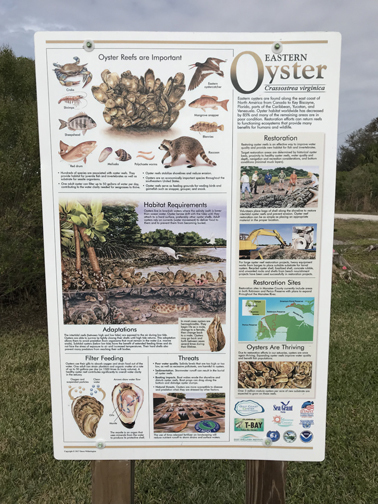 1/4/19 F – It took about 2hrs to get to Crystal River State Park on the Gulf Coast. 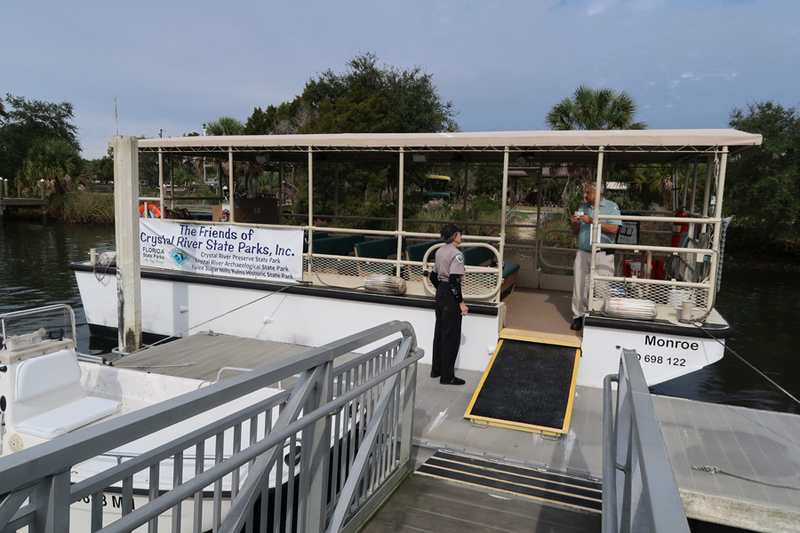 We happened upon a Friends of Crystal River State Park 10am pontoon boat tour at the Visitor Center and signed up. 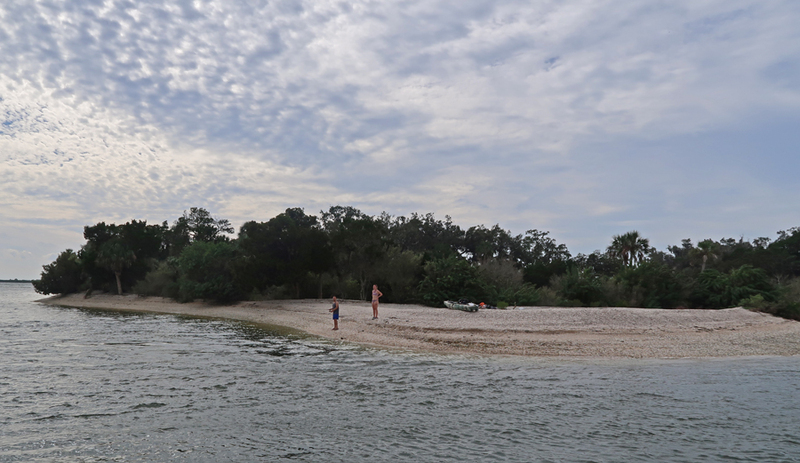 Manatees are one of the big draws to Crystal River, however, they were still out in the Gulf of Mexico. 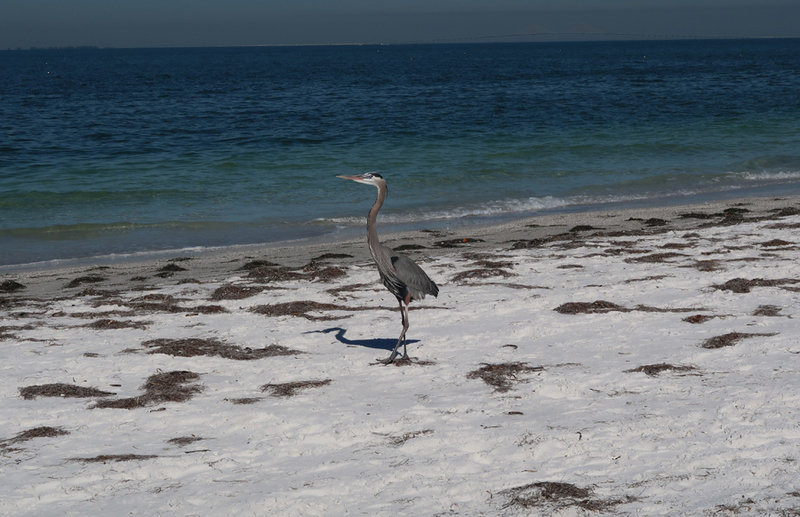 They come into shore as the Gulf cools in the winter. 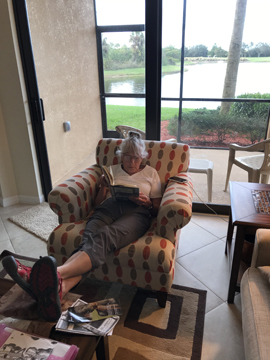 Another 2hrs got us to our River Strand condo in Bradenton FL – our home away from home for four weeks. 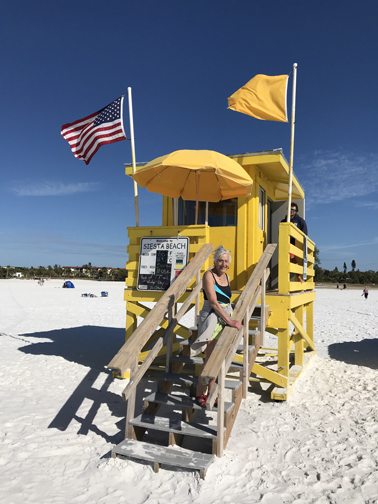 Our friend Nancy allowed us to use her condo for the month of January. 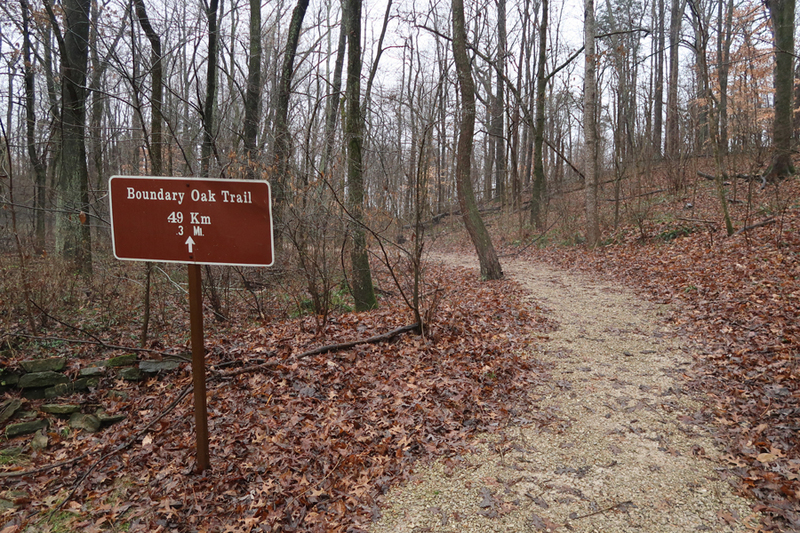 Our brakes were grinding and getting progressively worse to the point that I felt I should not drive the Sequoia. 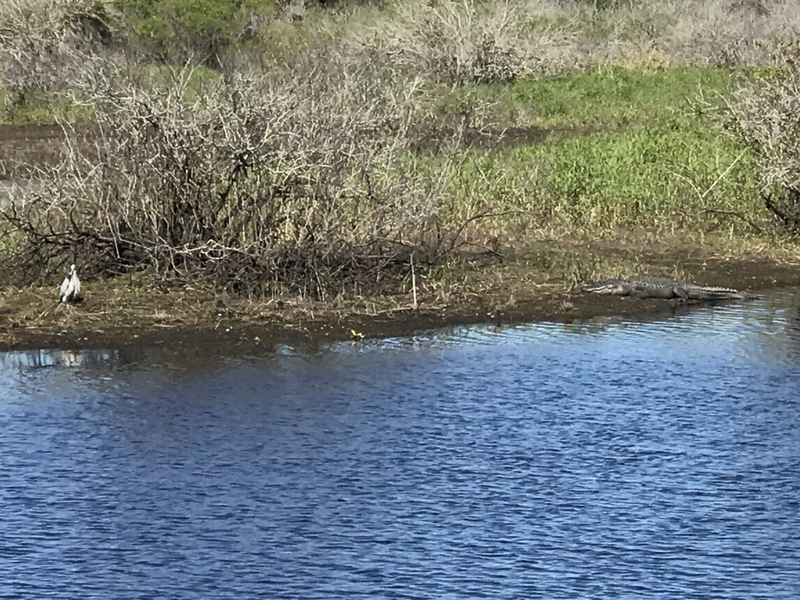 The good news was that there was a Toyota dealer 1.5-miles from our condo. 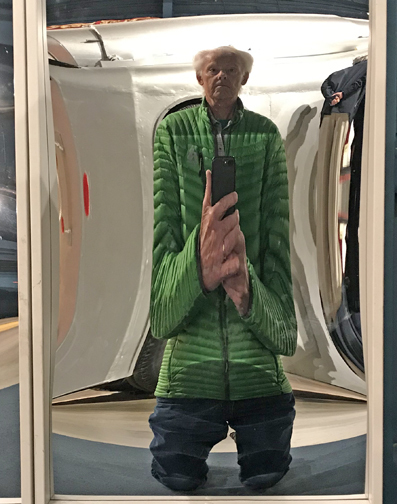 The bad news was that I couldn’t get an appointment until Monday. 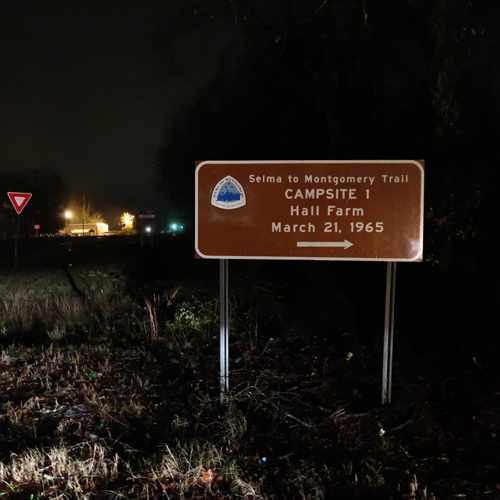 That meant we were “stranded” for our first weekend. 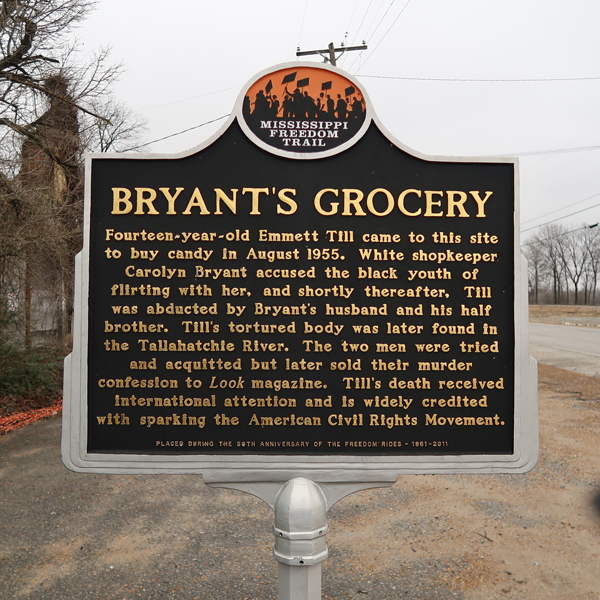 But it was OK because it was only a 3-mile roundtrip walk to Walmart, which allowed us to get provisions for our stay! 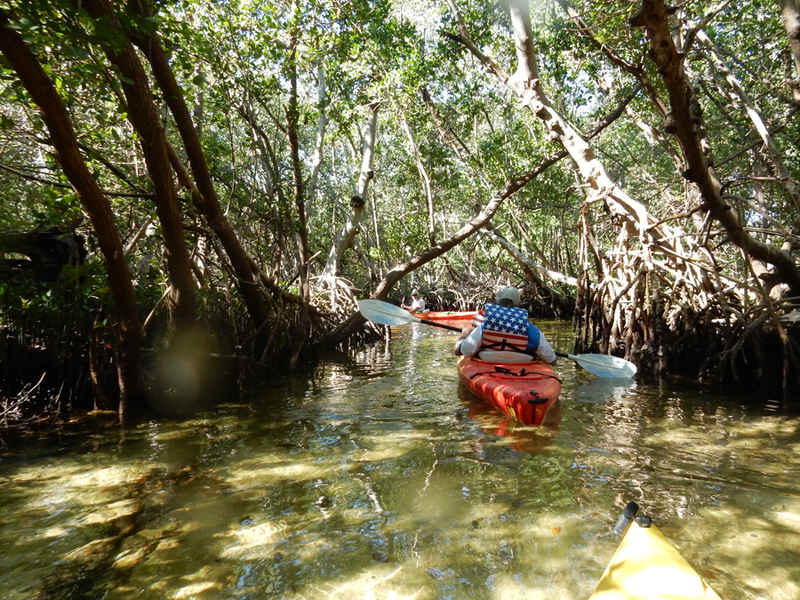 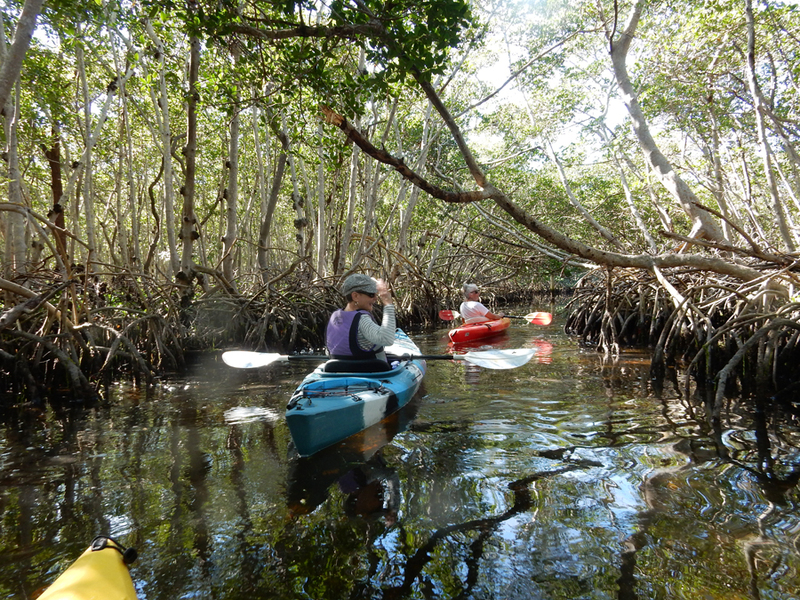 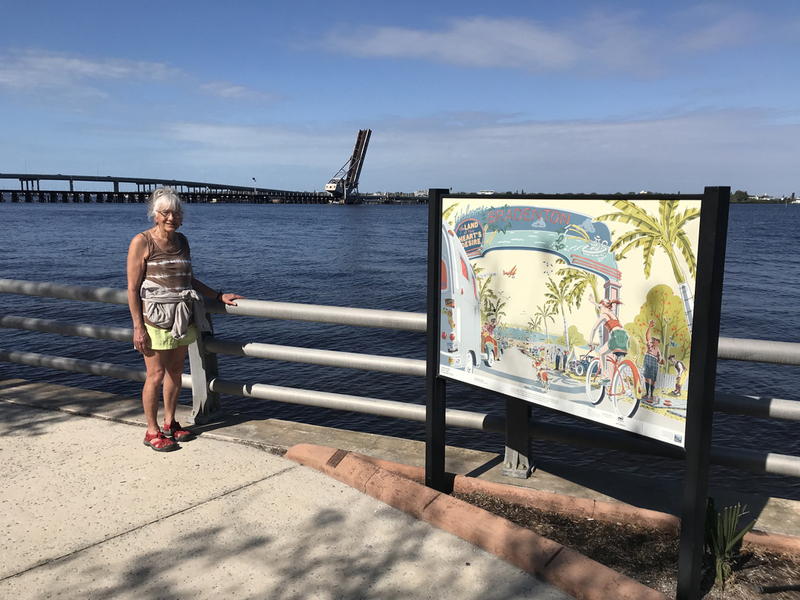 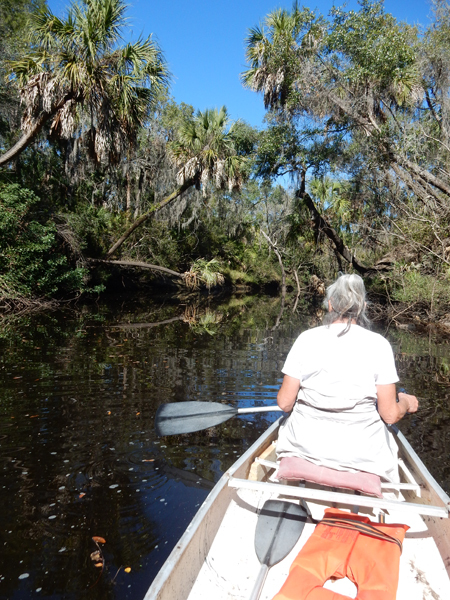 1/5 Sat – 1/6 Sun – explored the River Strand condo complex, which is on the Manatee River. 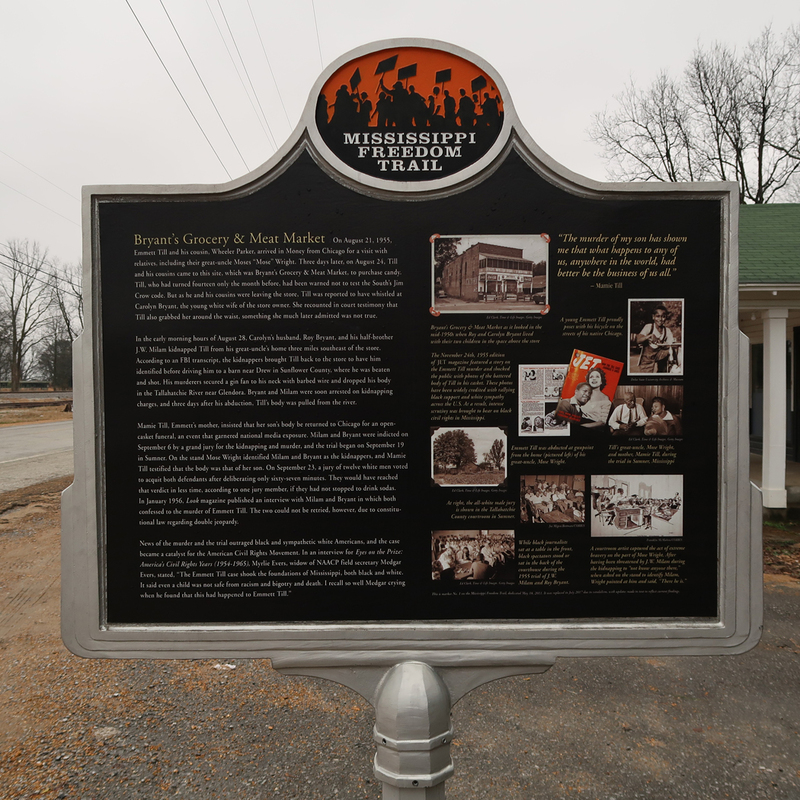 It is big, about 1 x 2 miles. 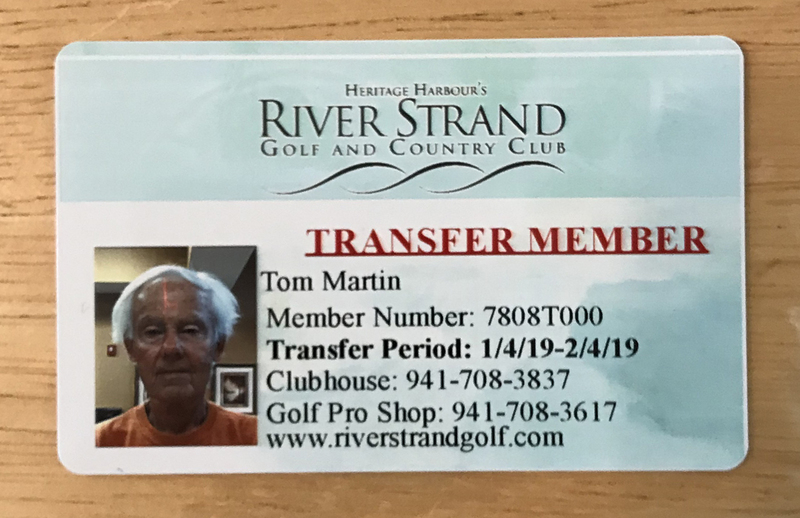 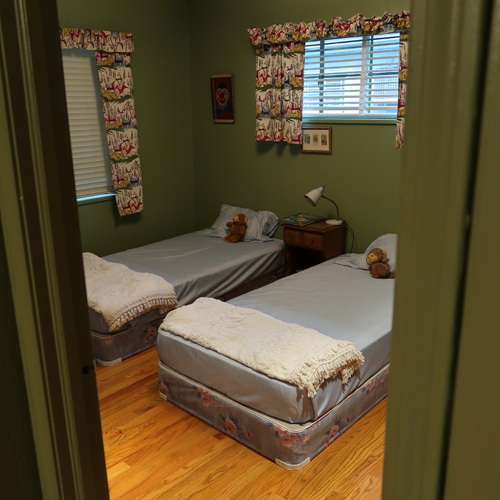 There are three nine-hole golf courses, club house, two fitness centers, many tennis/pickle ball courts, two large pools as well as our own heated local pool a short walk away. 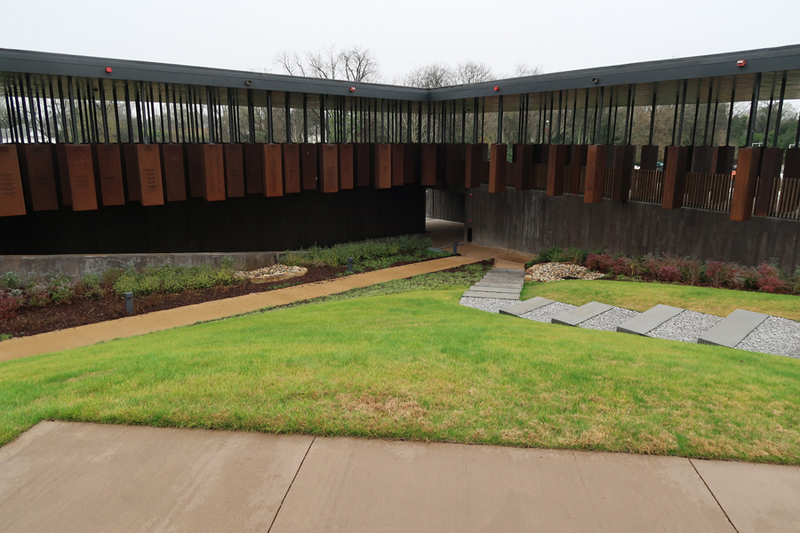 There is a concrete golf cart path that also provides for miles of comfortable/scenic walking around the complex. 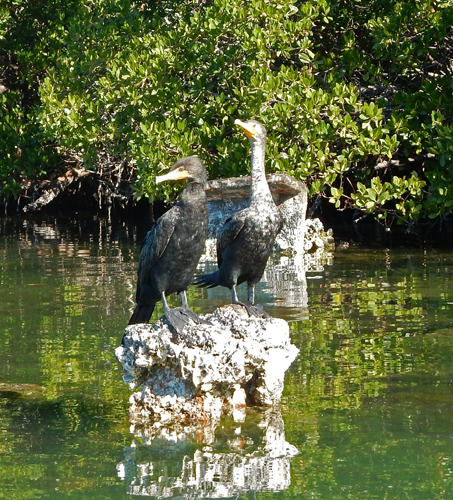 Our condo is at ground level overlooking one of numerous large ponds. 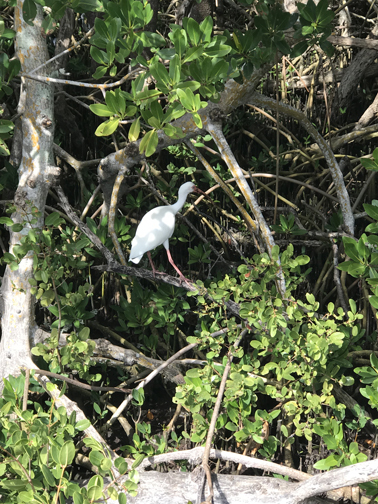 Lots of wildlife out there, a variety of birds, jumping fish and a family of small furry animals we have not yet identified. 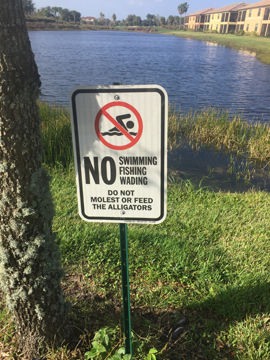 Don’t go in the pond! 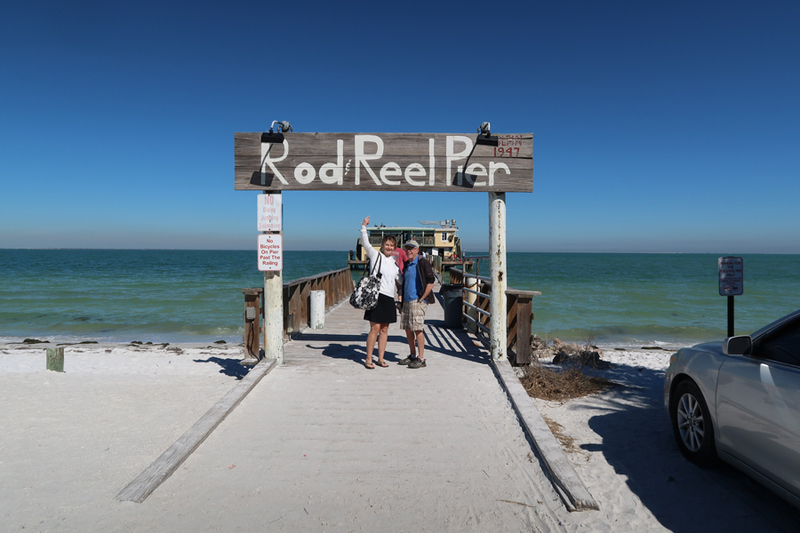 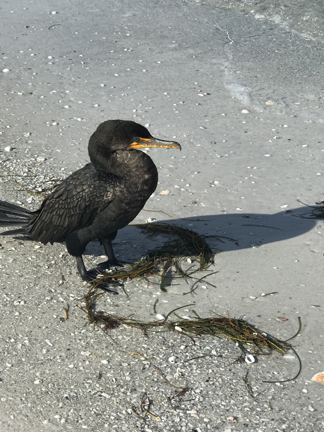 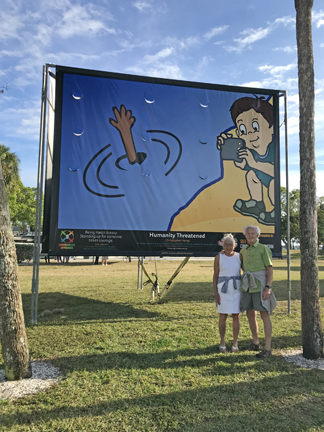 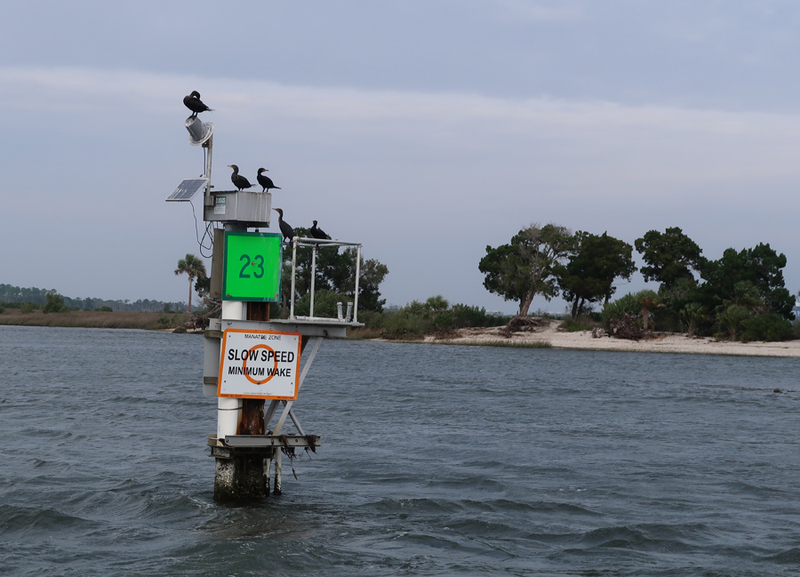 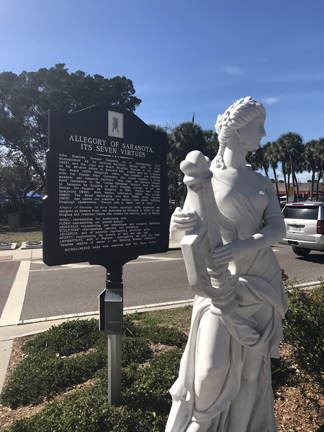 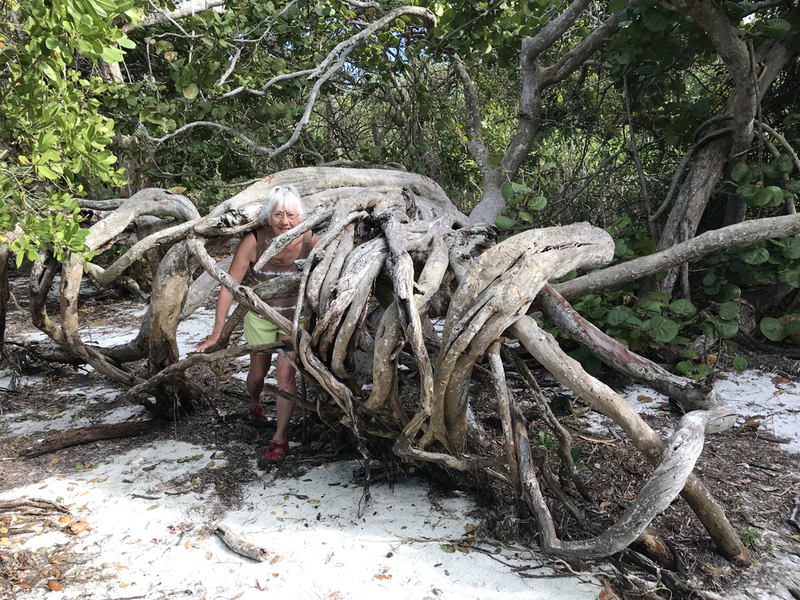 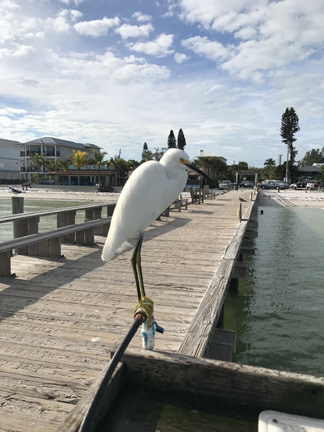 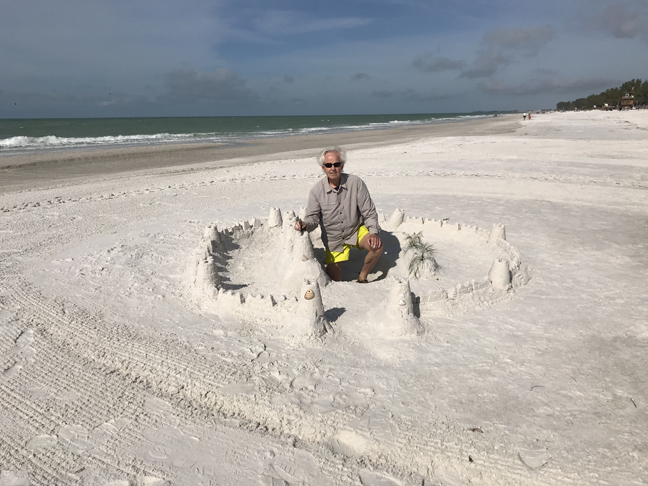 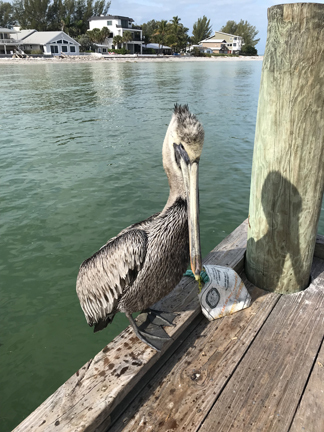 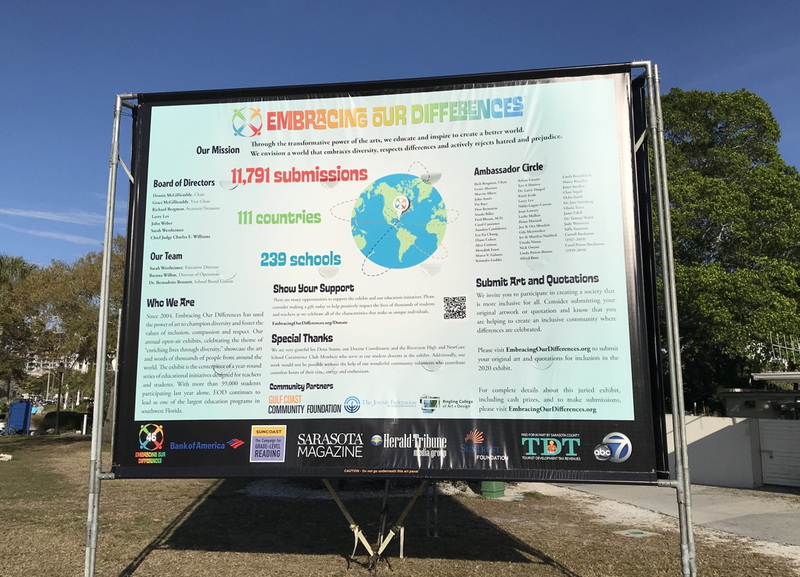 1/8 Tu – It took about 45min to drive to Bean Point on the northern tip of Anna Maria Island. 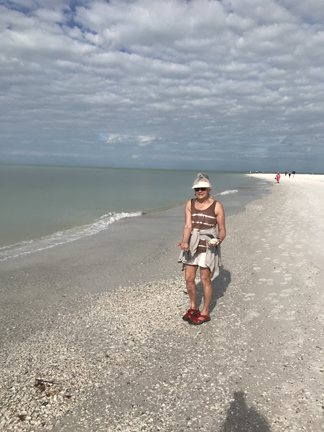 Walked for 1.5hrs on the beach with Helen collecting shells as usual. 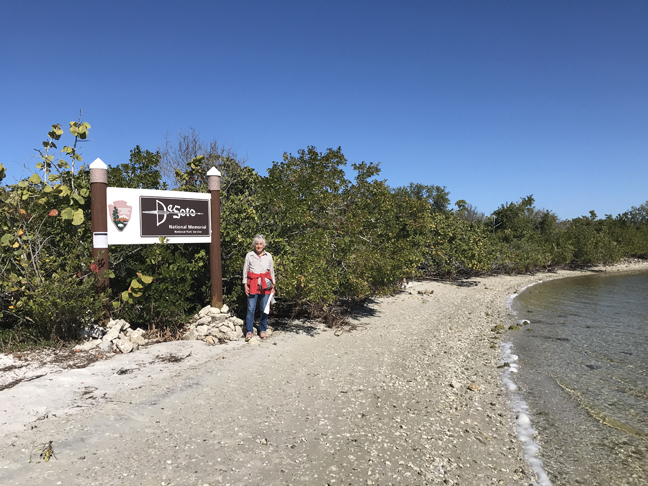 1/9 W – Checked out Cortez Beach, too many people; then drove a short distance to Coquina Beach for a 1.5mi walk and more shells. 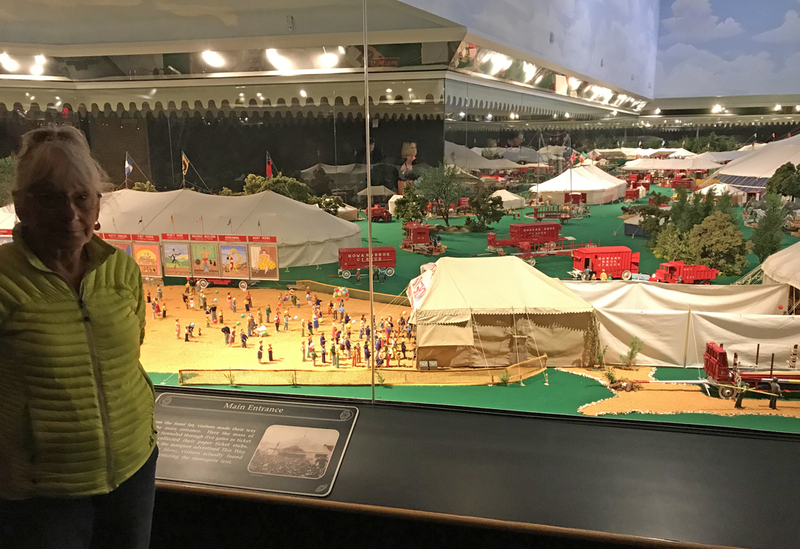 We browsed the tent craft market that is there every Wednesday. 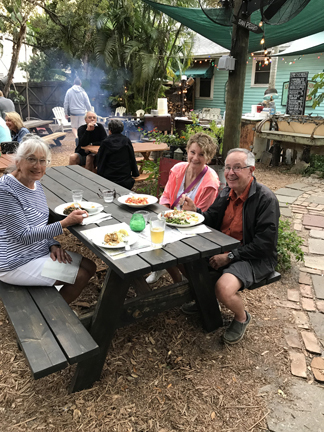 1/12 Sat – First stop Red Barn Flea Mkt in Bradenton. 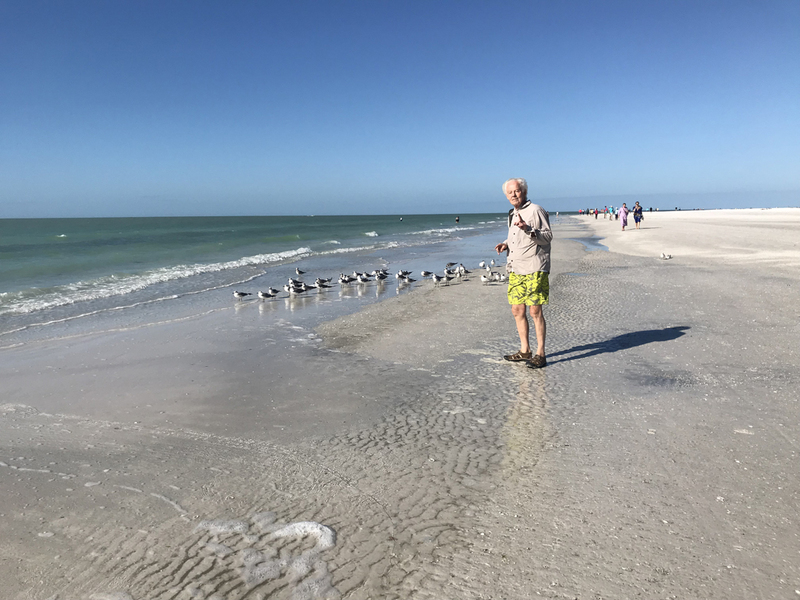 Next stop Siesta Key. 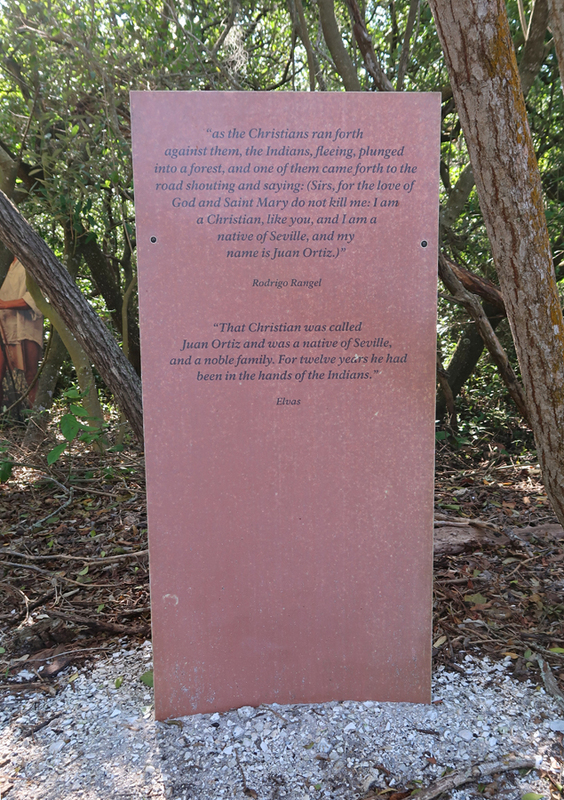 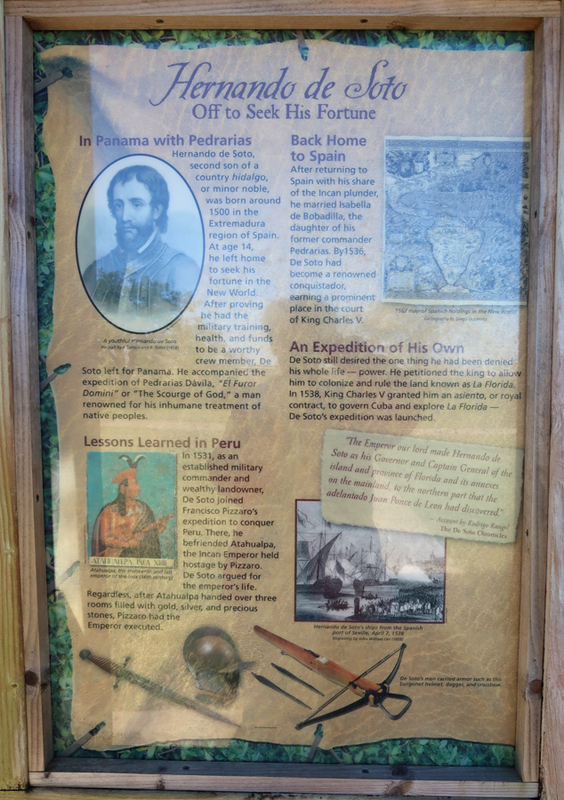 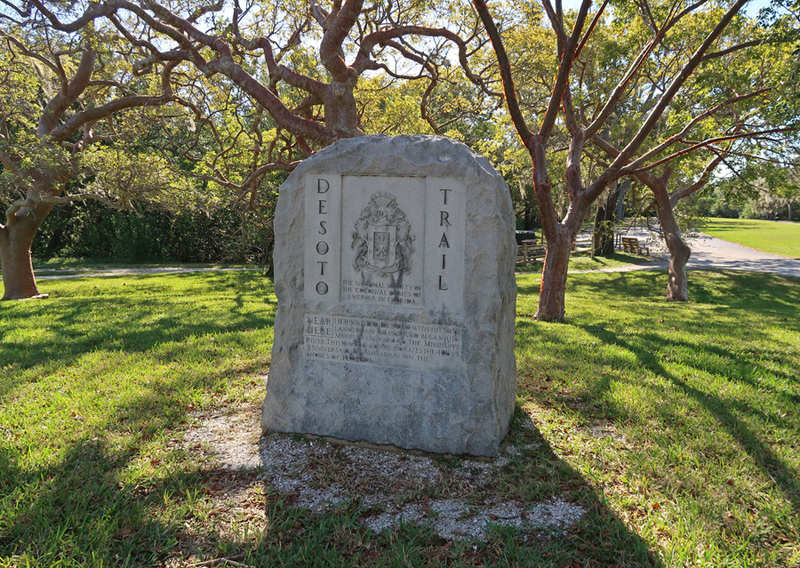 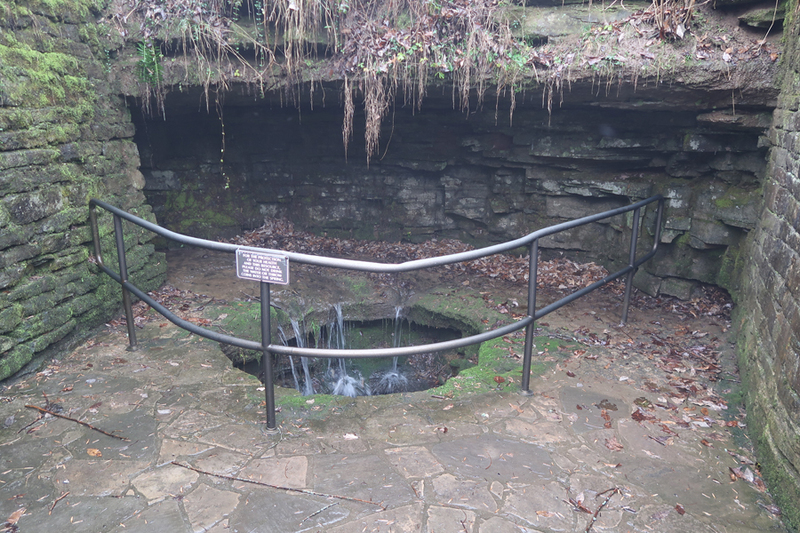 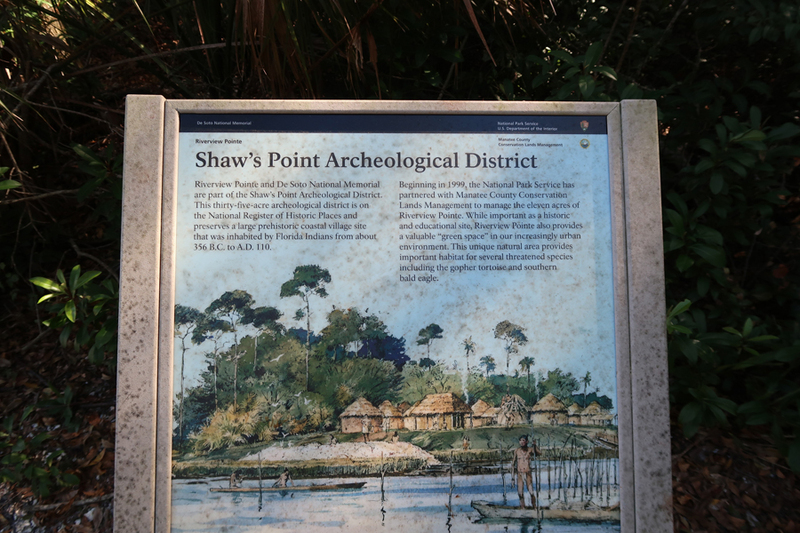 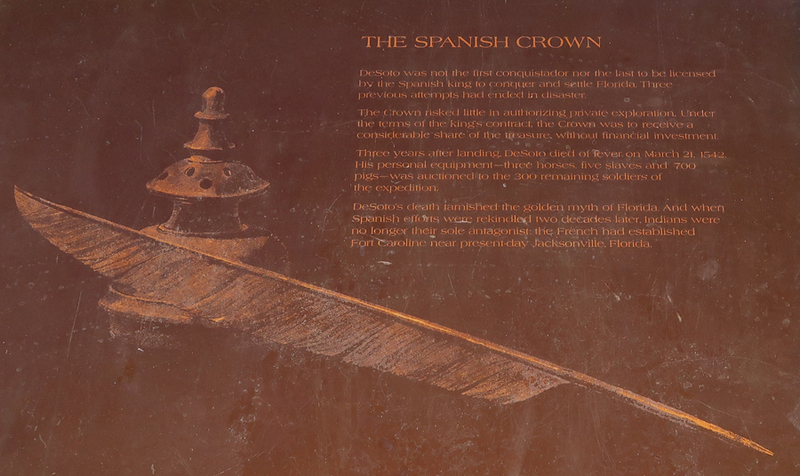 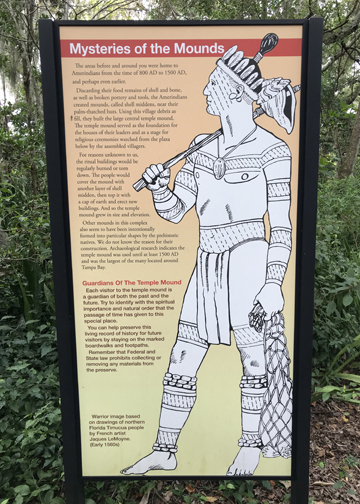 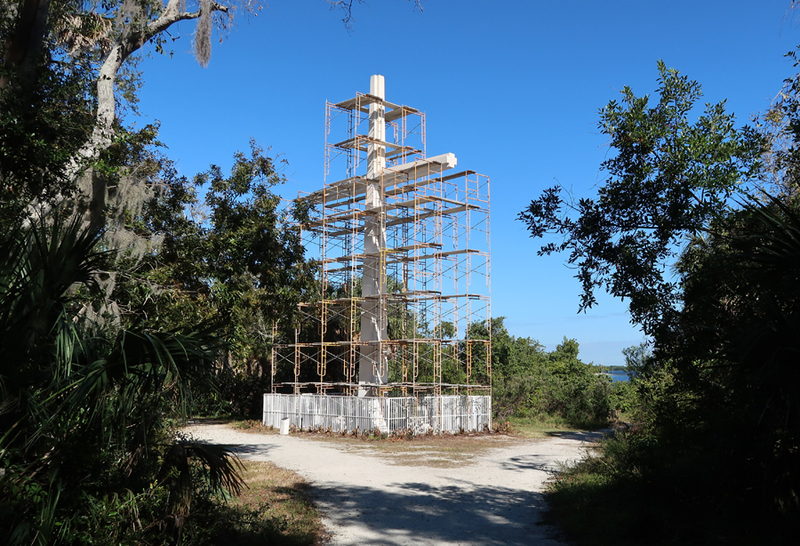 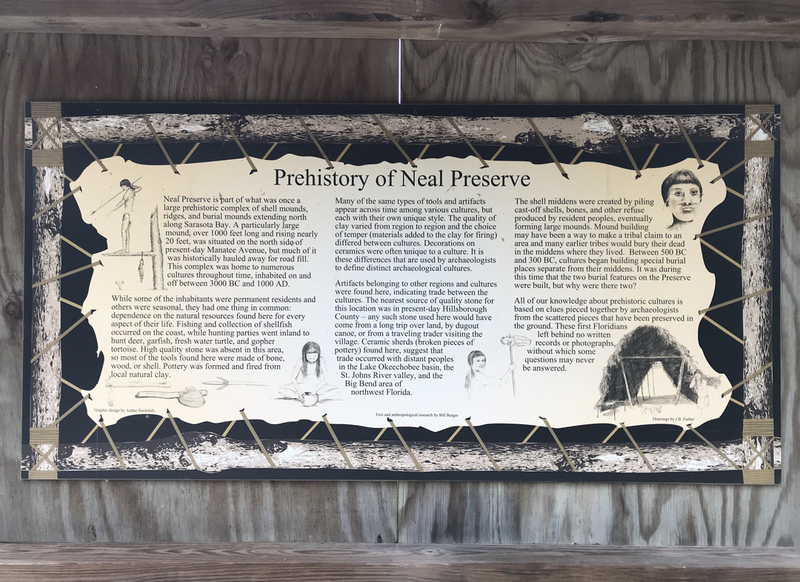 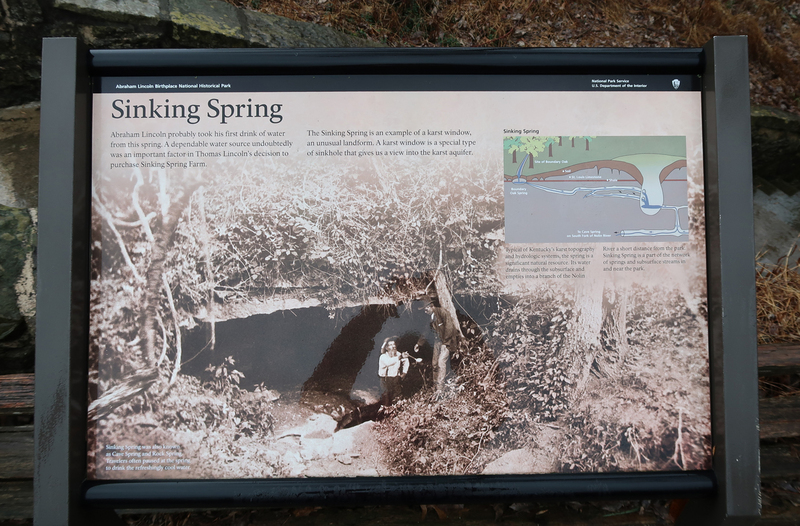 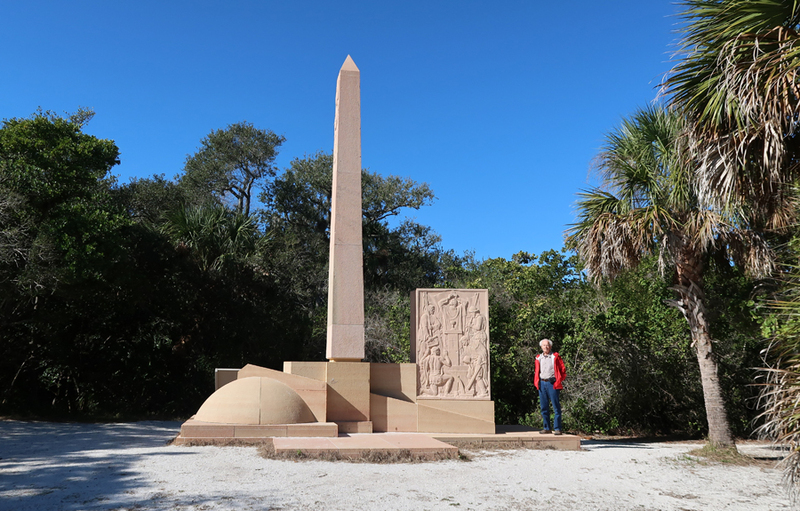 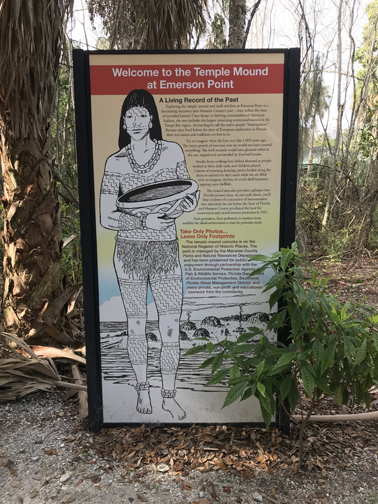 1/14 M – Drove back to Emerson Point Preserve to hike the 1mi Portavant Temple Mound Trail. 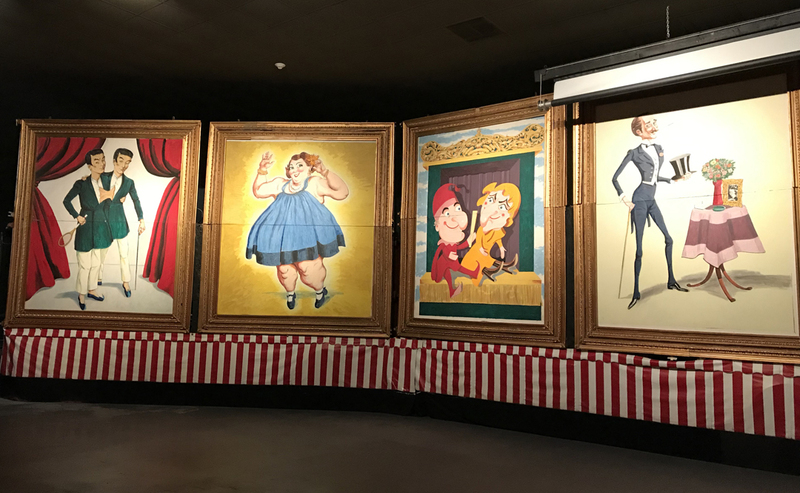 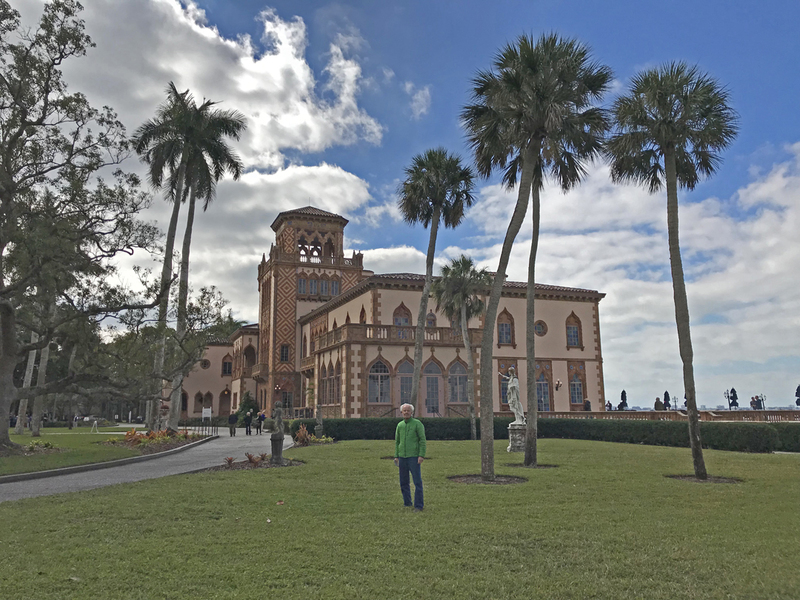 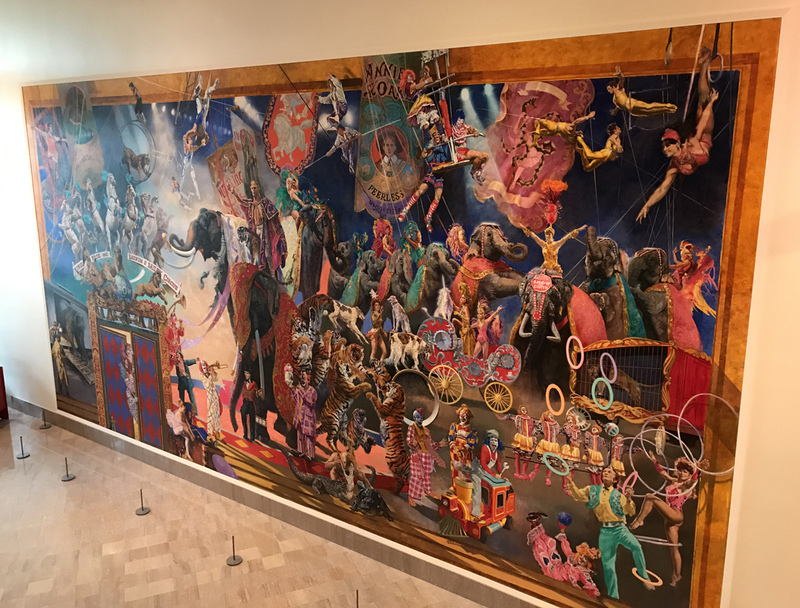 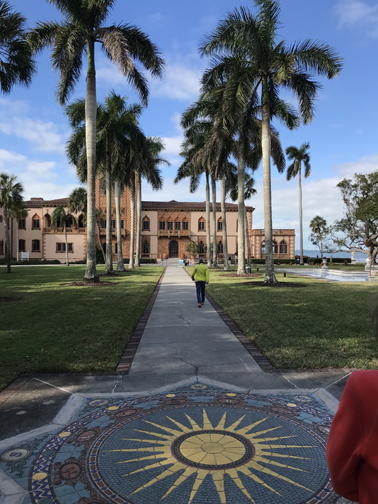 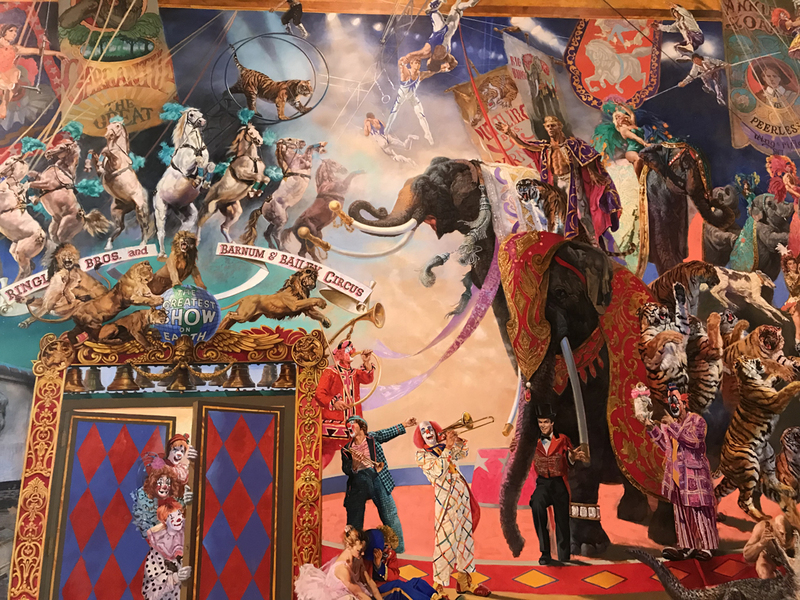 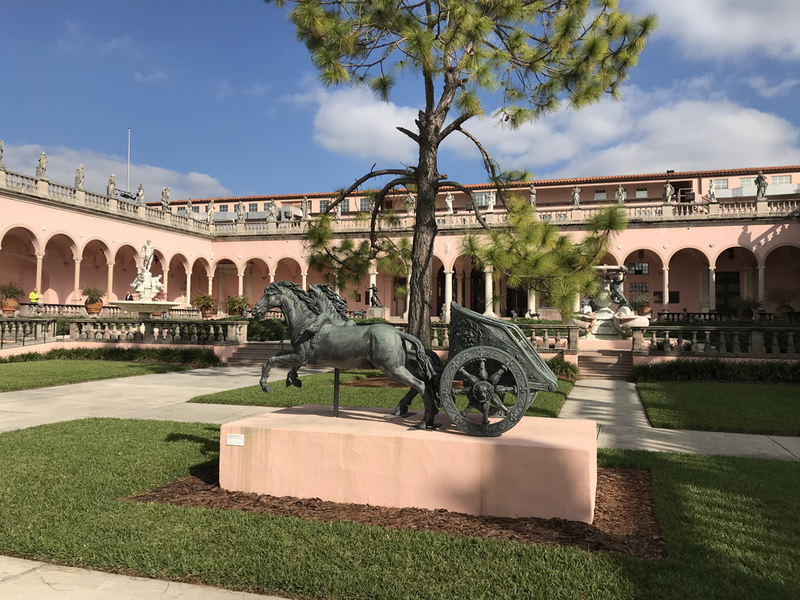 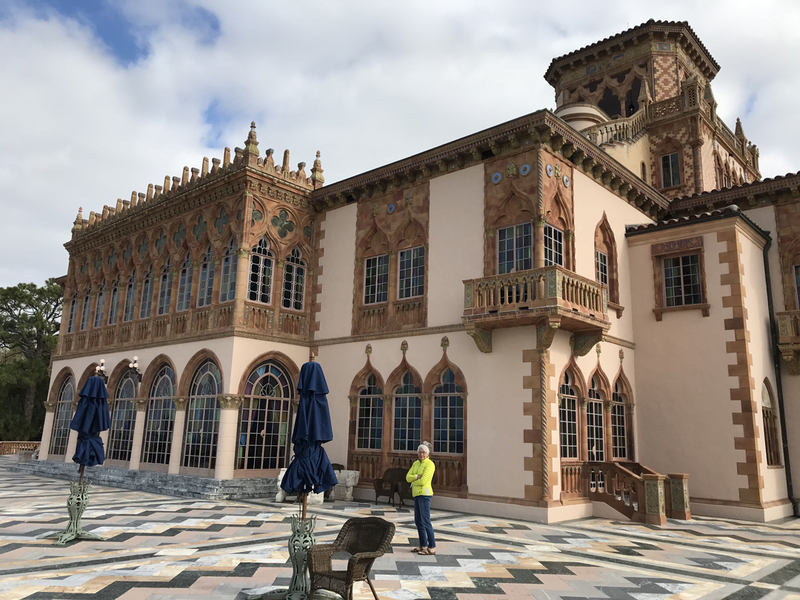 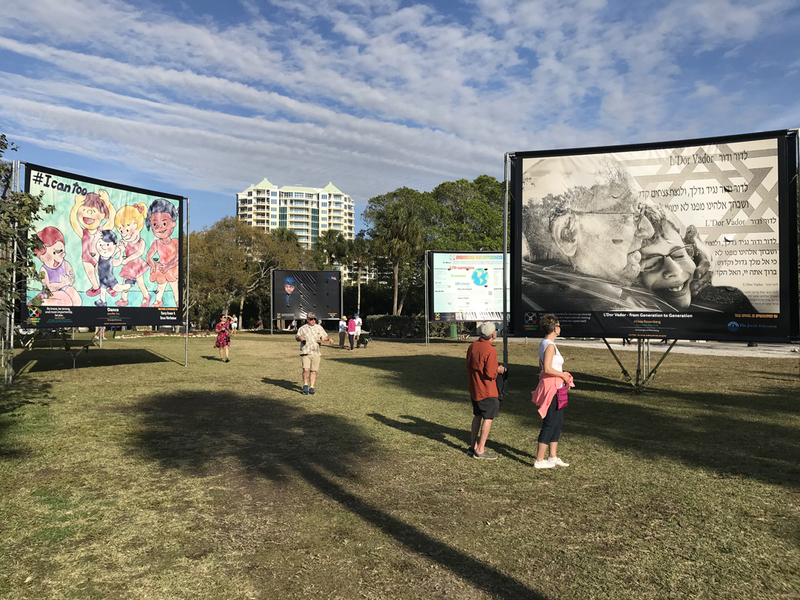 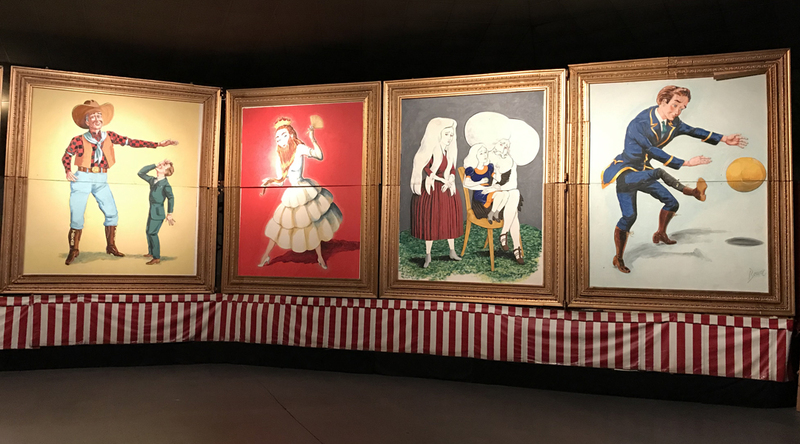 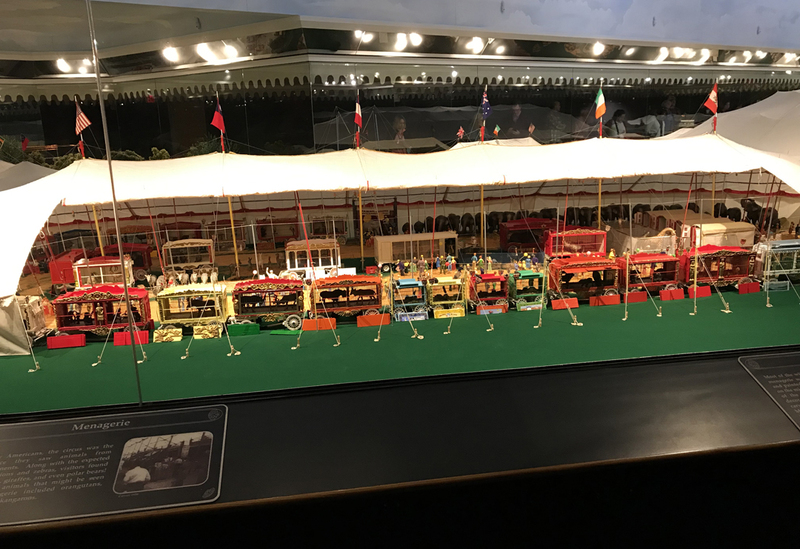 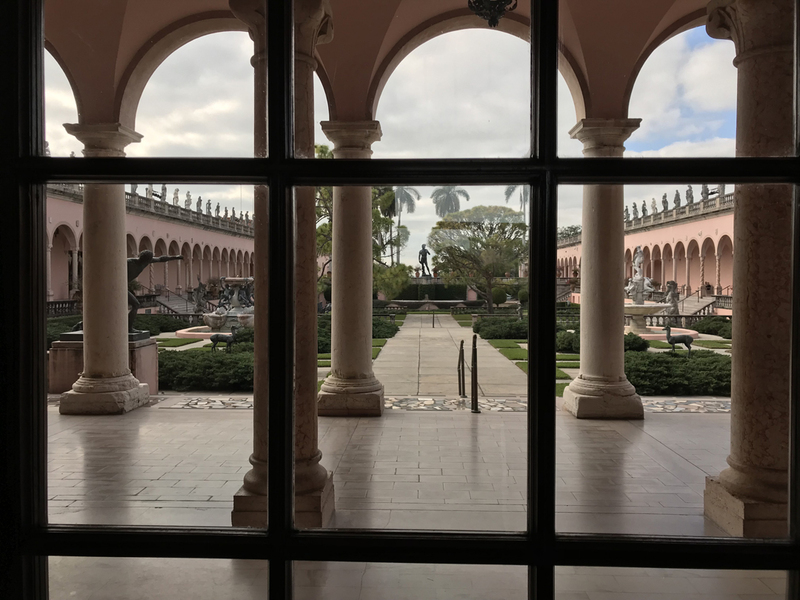 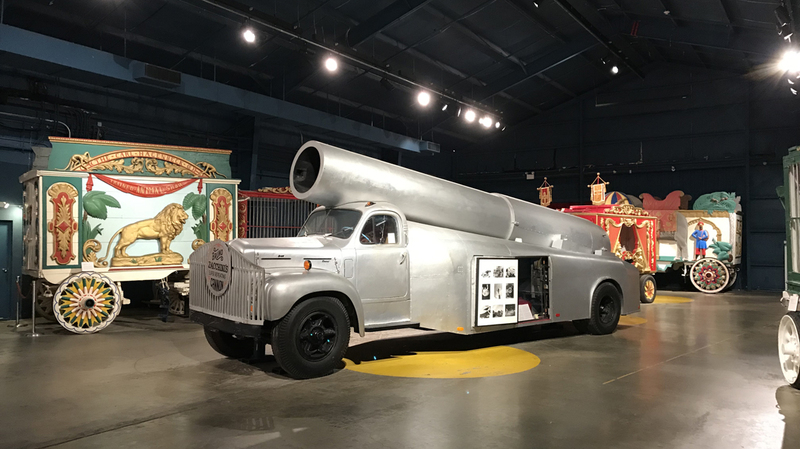 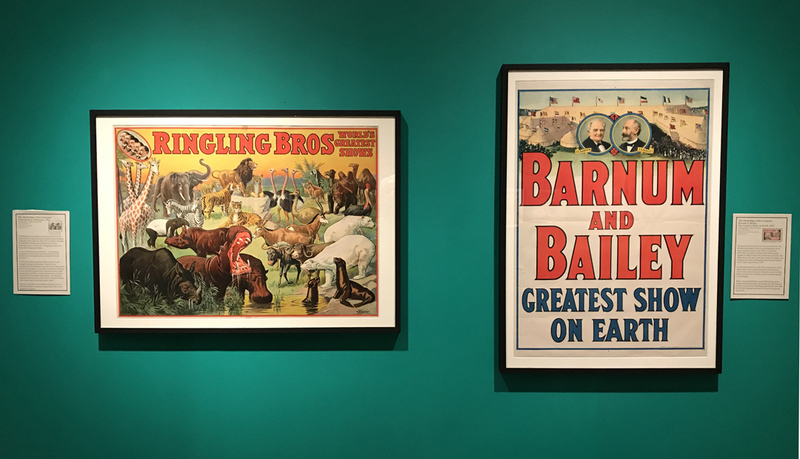 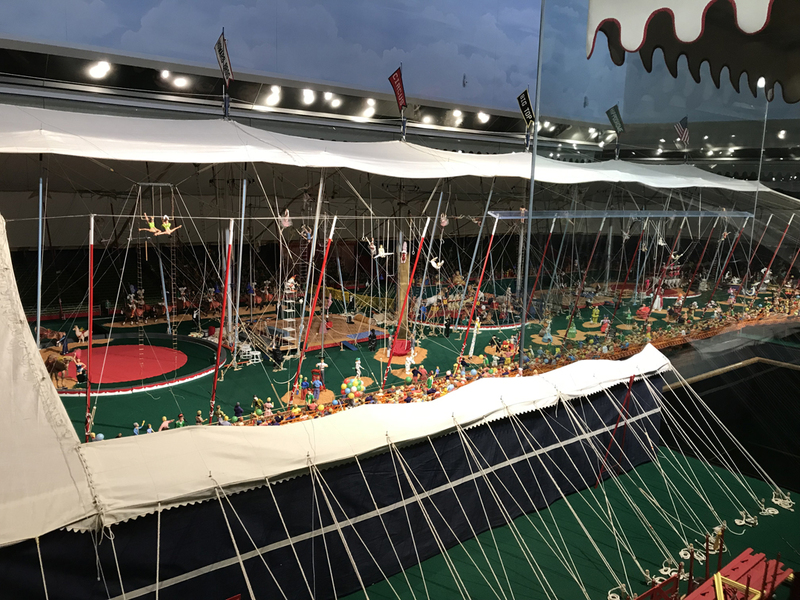 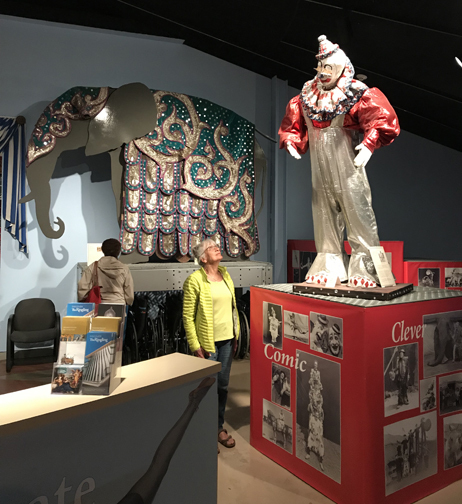 1/15 Tu – Spent the day at the John and Mable Ringling Art and Circus Museums, Gardens, and Ca’D’Zan (Ringling home). 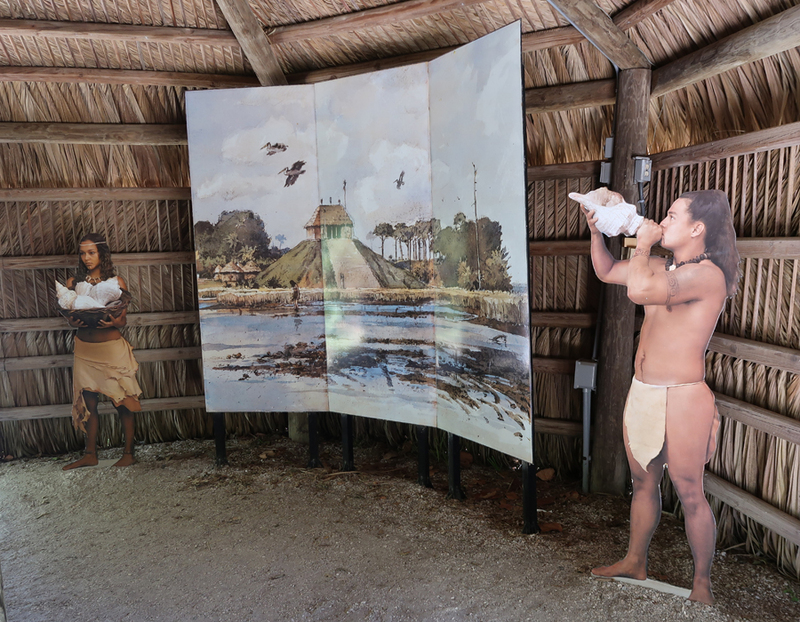 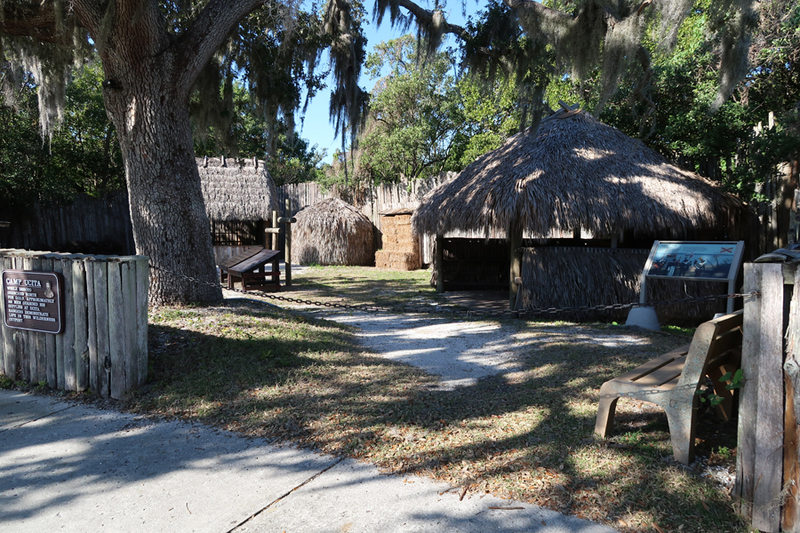 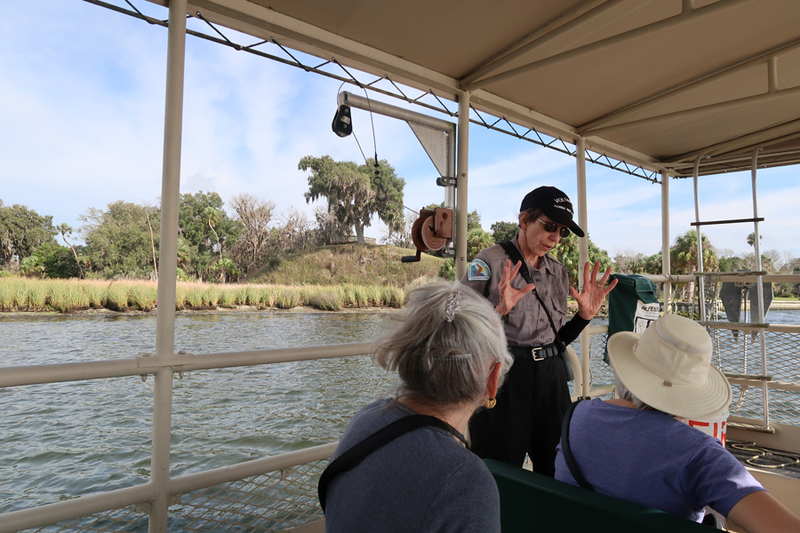 The Myakka Outpost, which is in the middle of the park, is a great place for viewing wildlife. 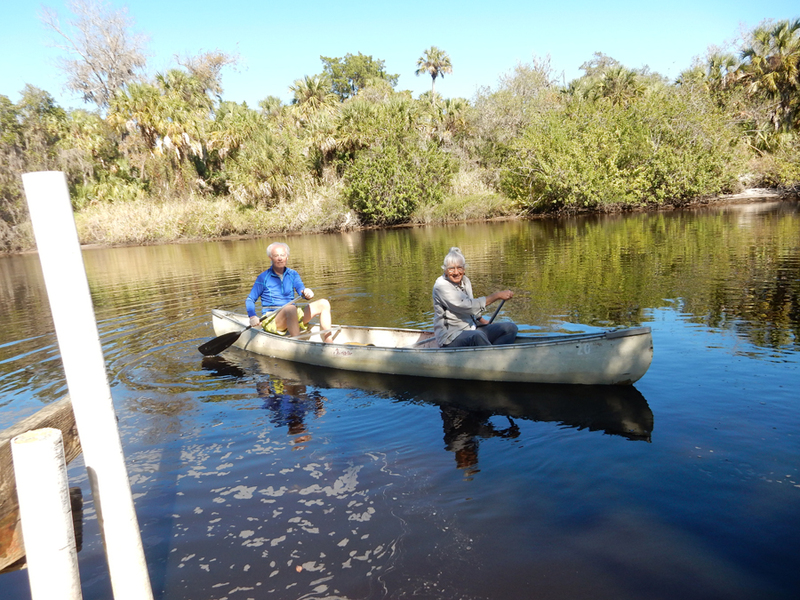 You can also rent canoes there. 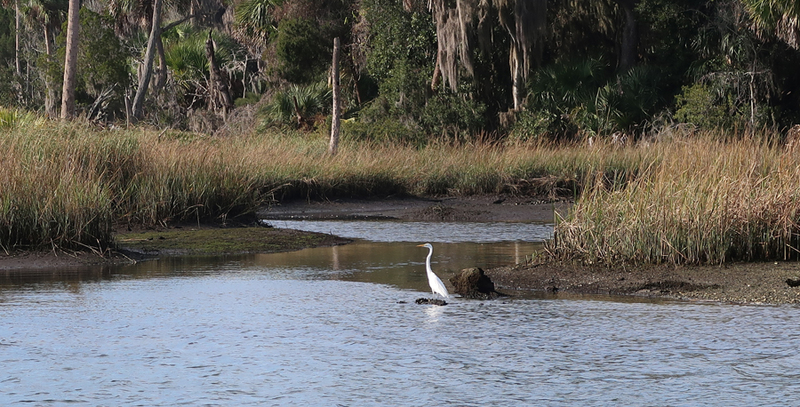 We saw many birds and some alligators. 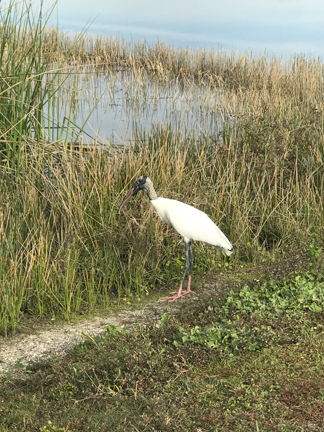 We saw a flock of rosette spoonbills land and two egrets doing a mating dance, but they were too far away to get good photos. 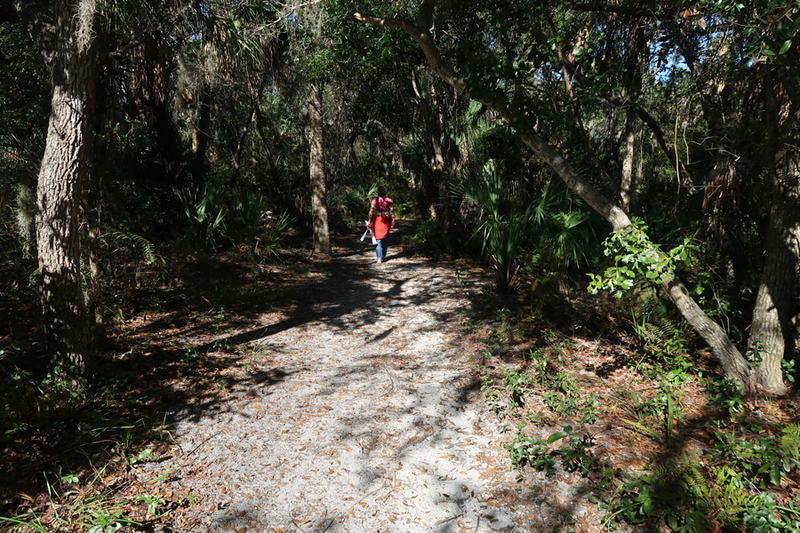 Hiked the Boylston Nature Trail through a hammock along the Myakka River. 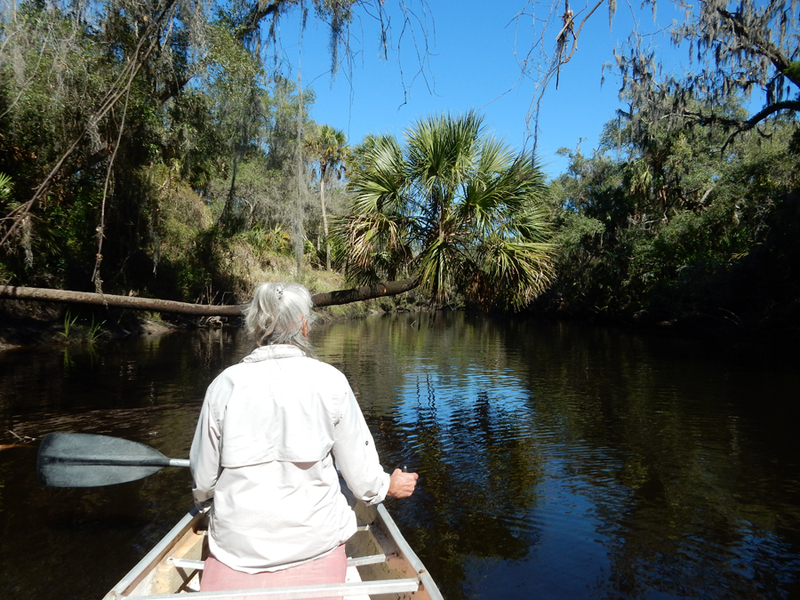 1/23 W – a little food shopping, camera questions answered, sunbathing, walking, . 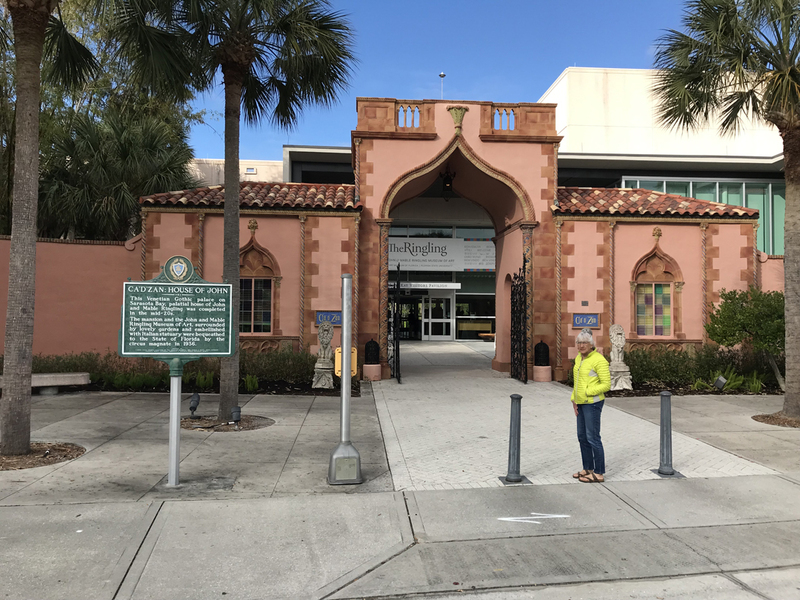 . .
1/27 Sun – church, Theresa’s for breakfast. 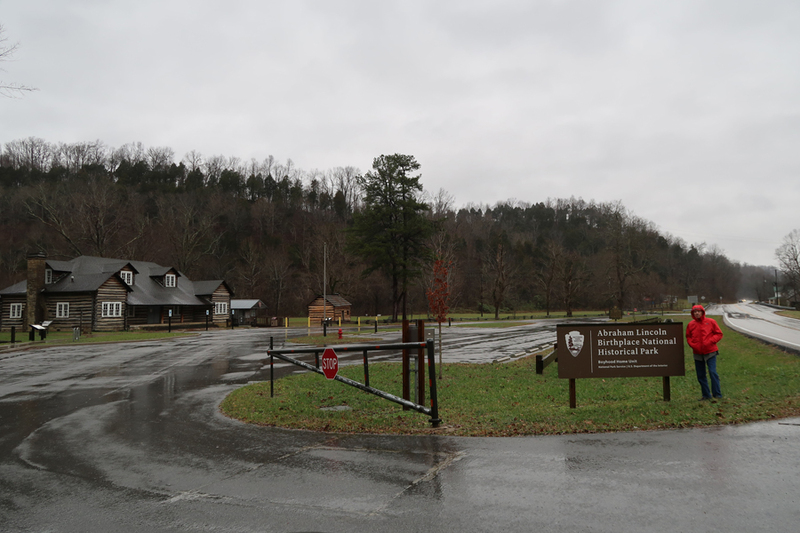 It rained all day. 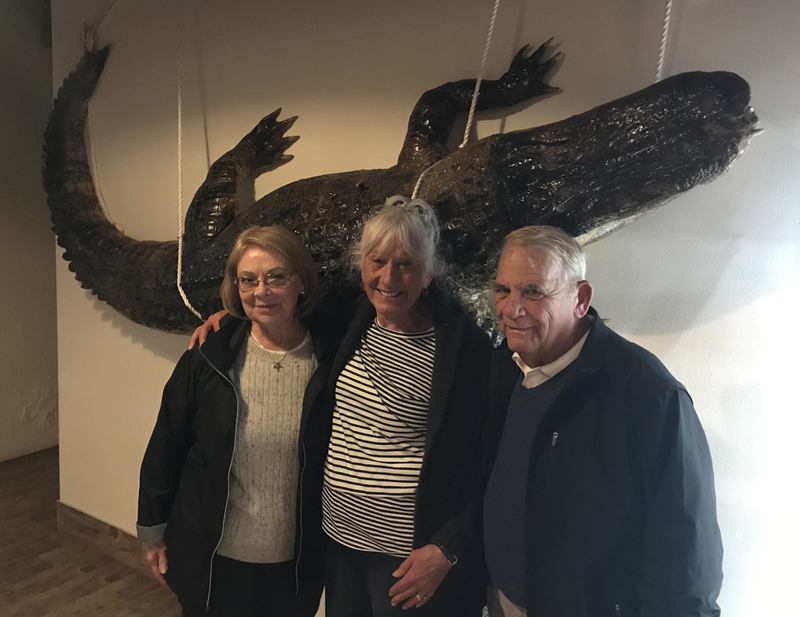 We had hors d’oeuvres at Howard (Nancy’s brother) and Linda’s home, then dinner at the “Old Florida” Linger Lodge – alligator, frog legs, fried green tomatoes for appetizer; blackened catfish and crab cake sandwich for dinner. 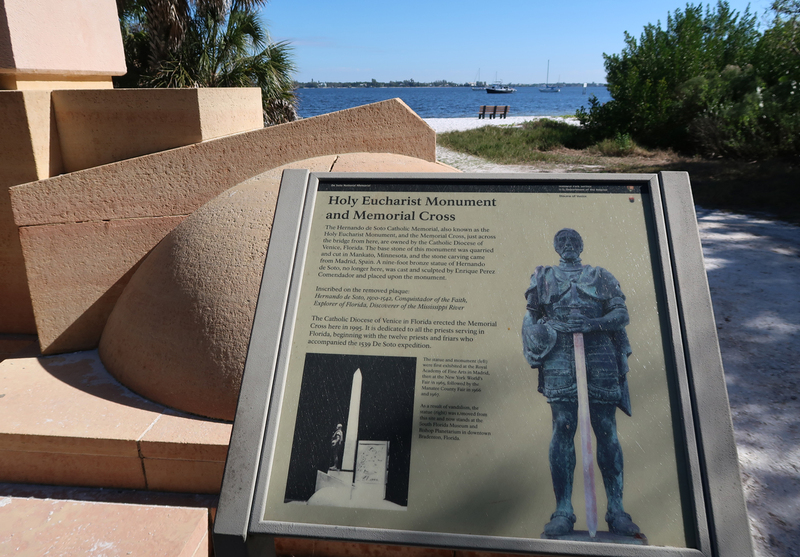 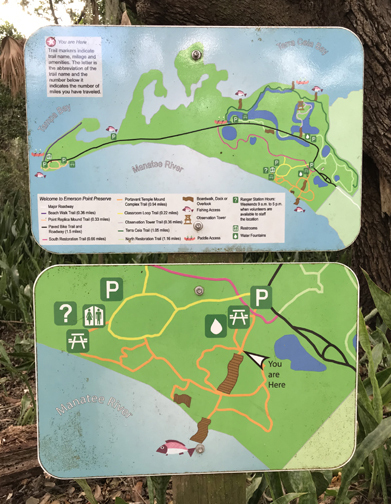 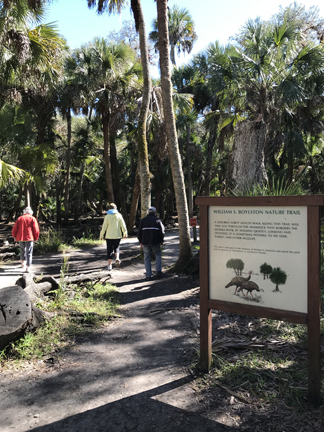 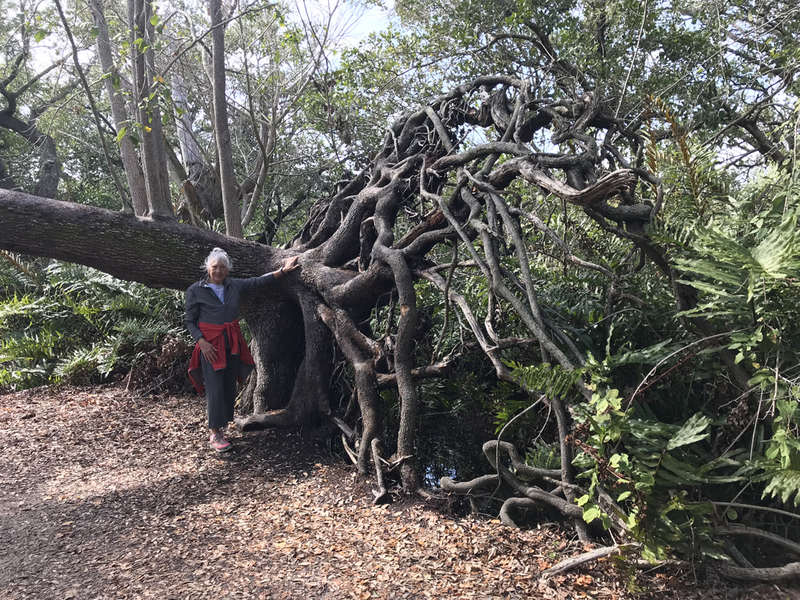 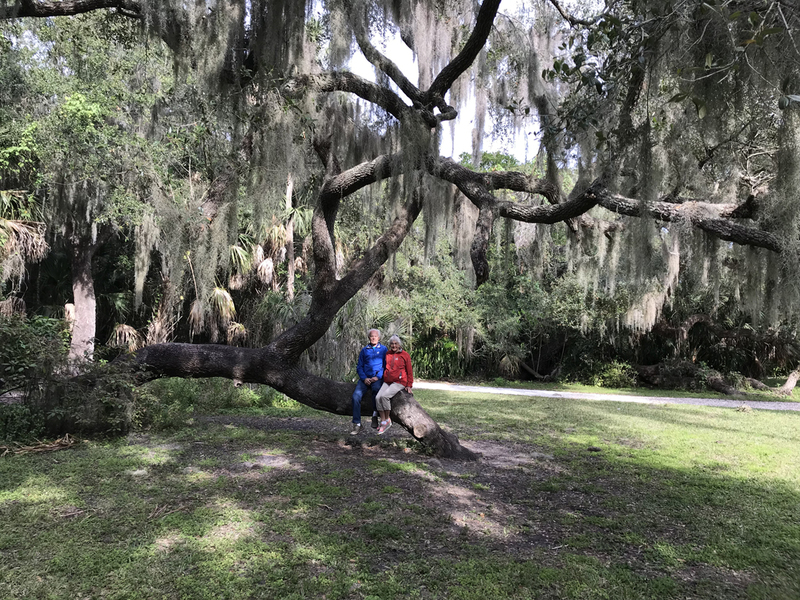 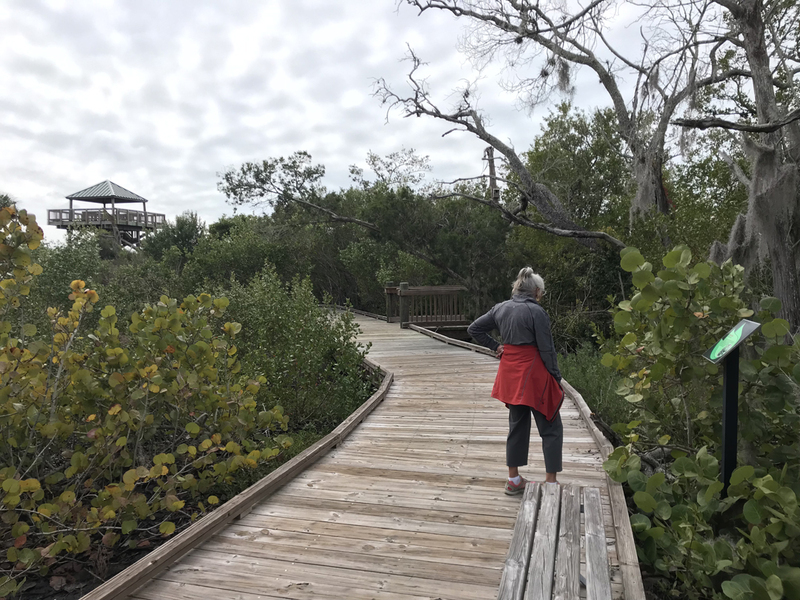 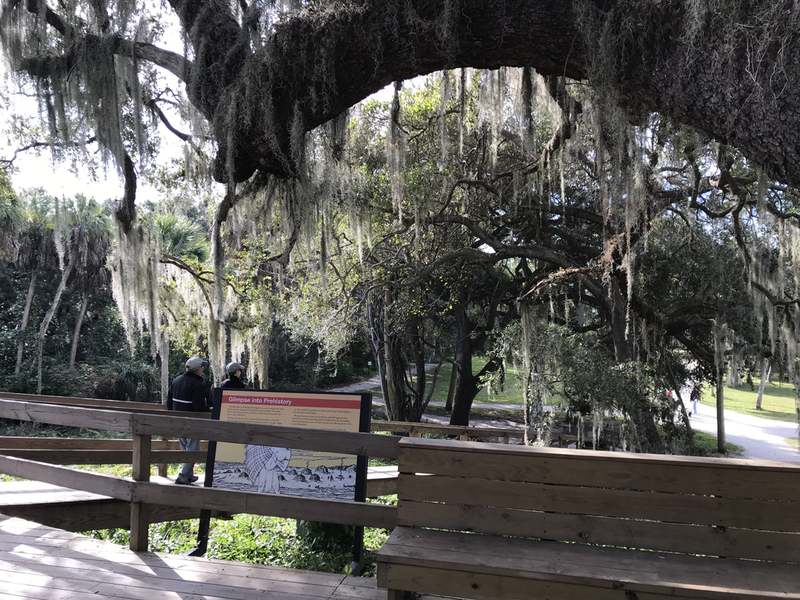 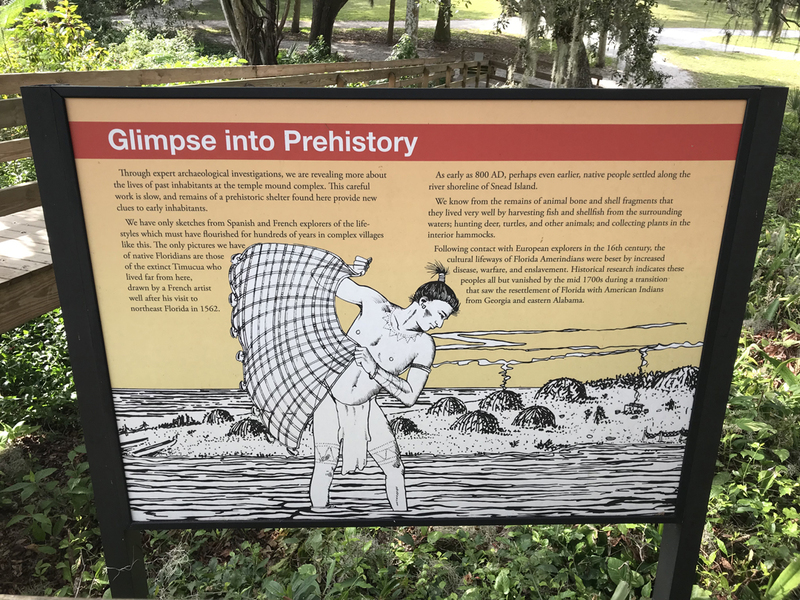 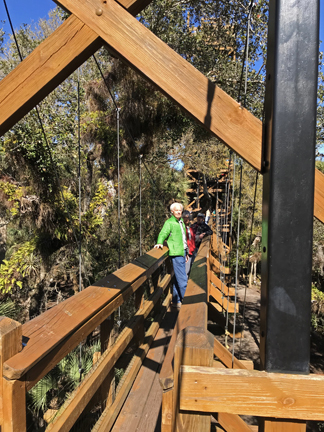 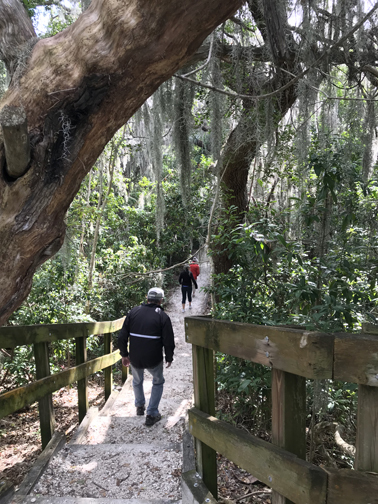 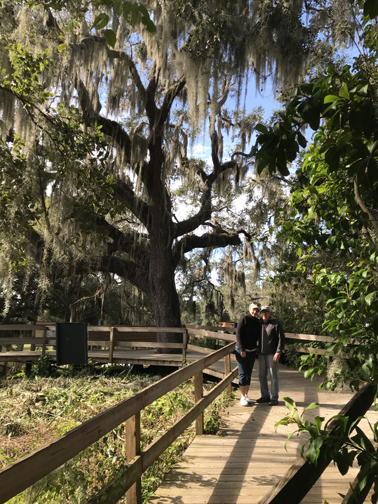 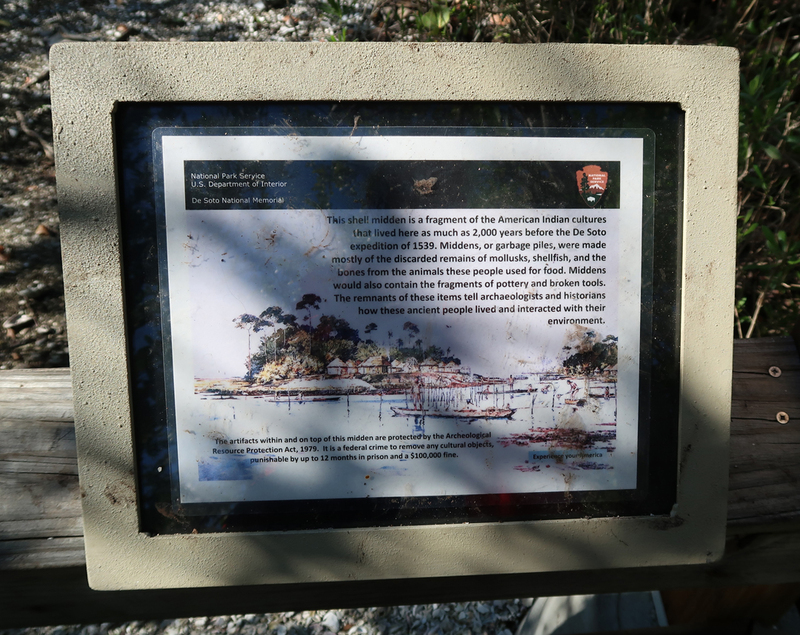 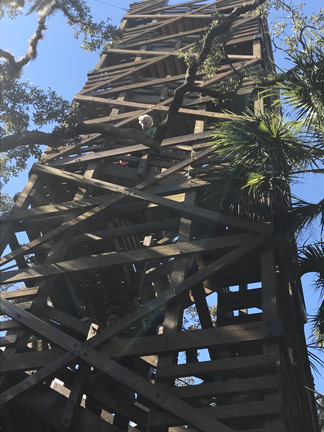 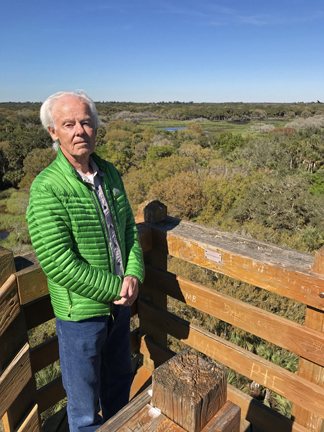 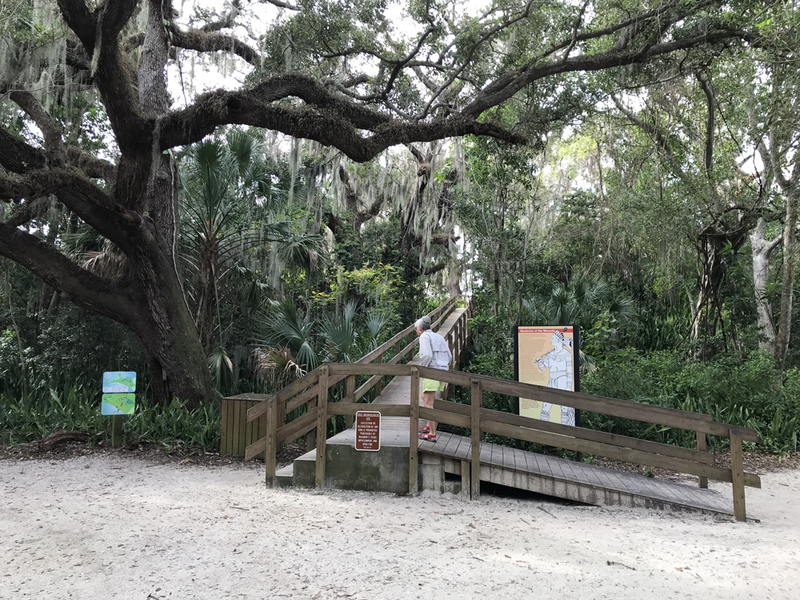 1/28 M – Lake Manatee State Park (not worth it); OK hiking at Rye Preserve, Red and Yellow trail about 2 miles; checked out Fort Hamer Park, it is as launch site on the Manatee River. 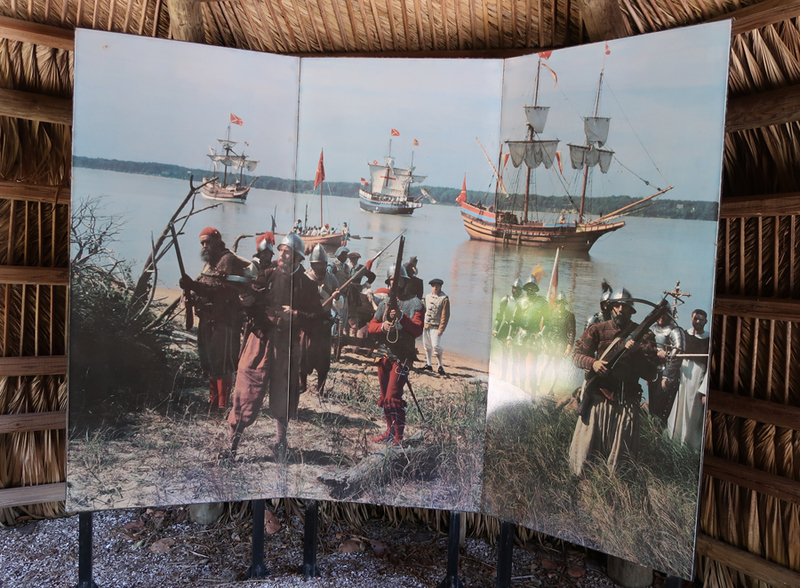 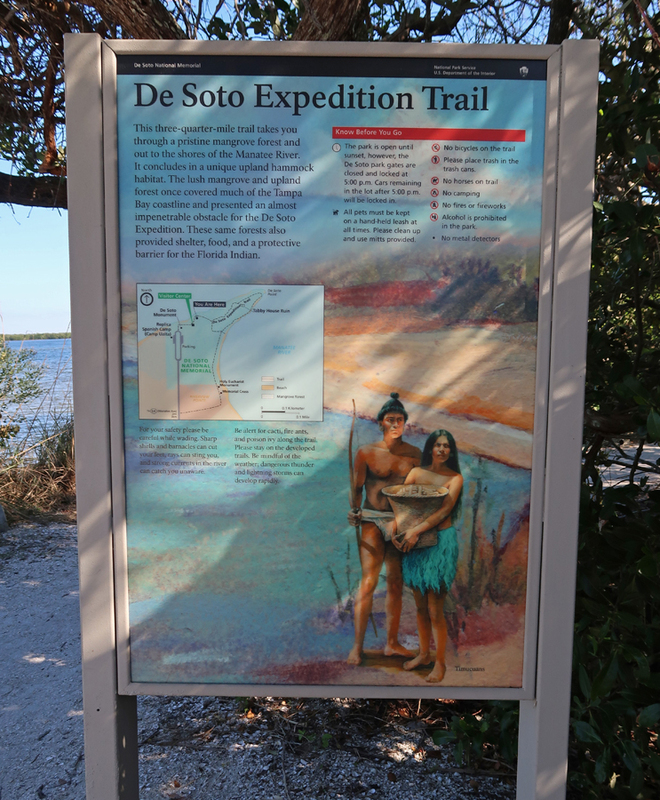 De Soto arrived at this location from Cuba in 1539 with 622 soldiers, 200 horses, a large herd of pigs, and fierce war dogs. 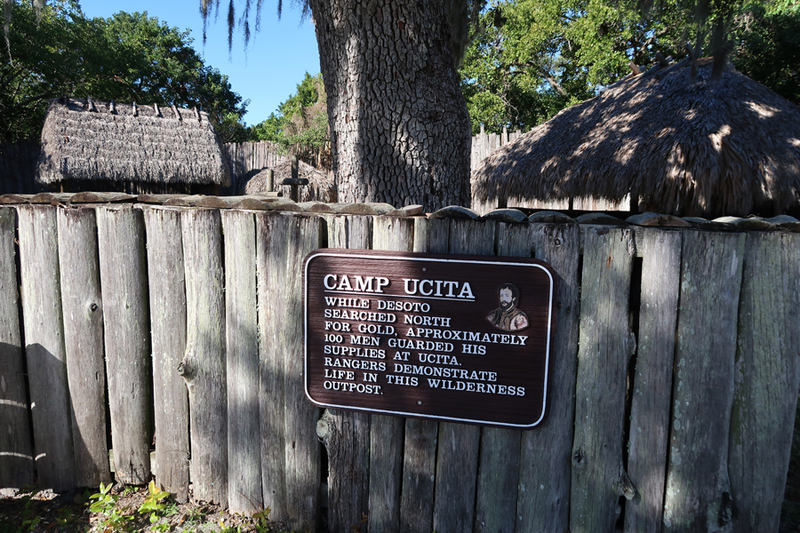 He left 100 men at this location (Camp Ucita) and started on his trail of destruction looking for gold. 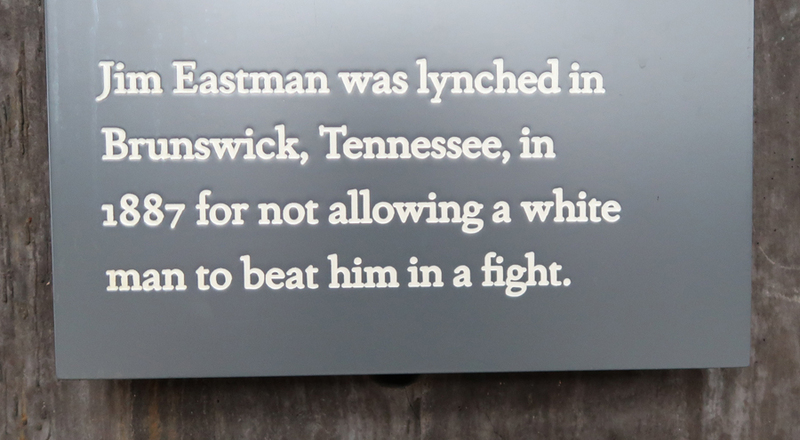 He died in 1542 and was buried in the Mississippi River. 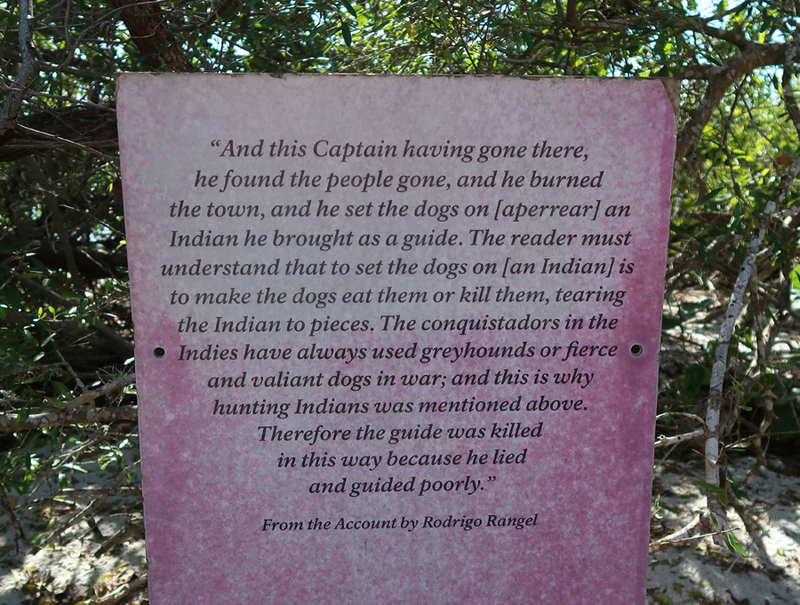 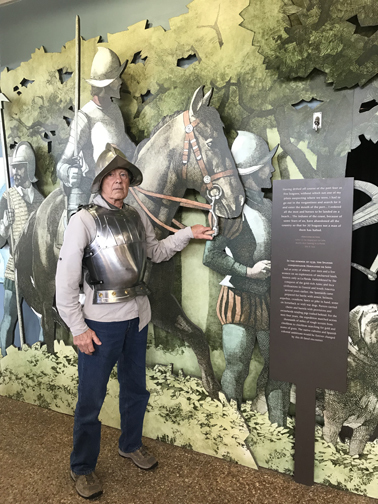 Sixteen months later his second in command was able to get to a Spanish settlement at the Panuco River in Mexico with only half his original men and no animals. 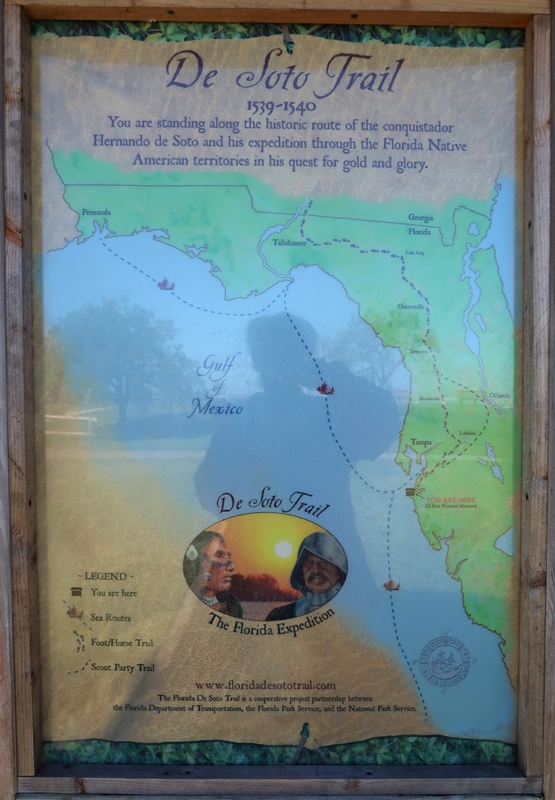 De Soto was ruthless and typical of celebrated conquistadores. 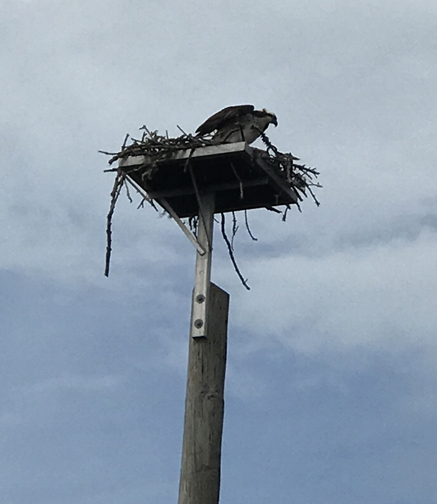 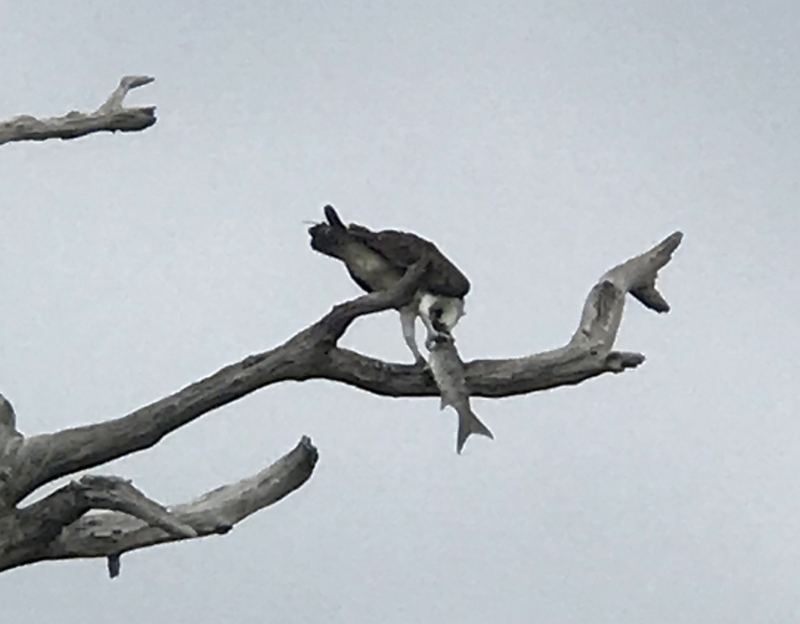 I saw what I think was an osprey fly in with its catch of the day. 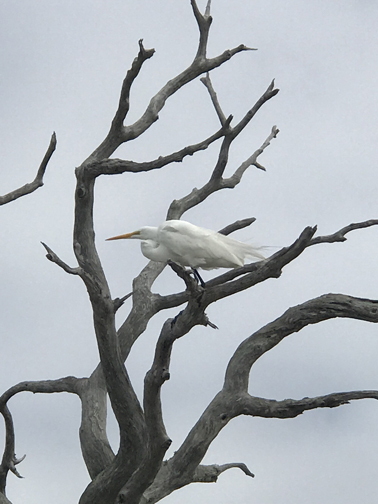 This pic shows it eating it’s lunch! 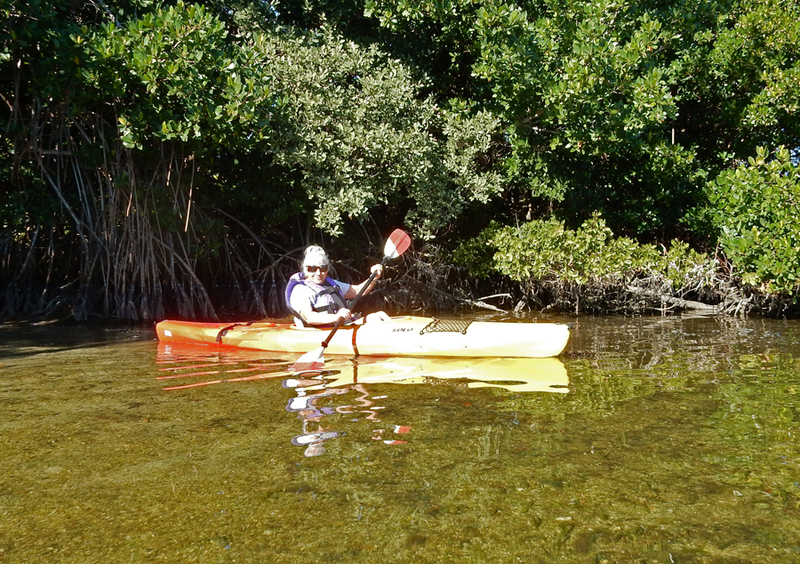 Helen swam, I exercised in the Fitness Ctr and helped Nathan (15) with his exercise program. 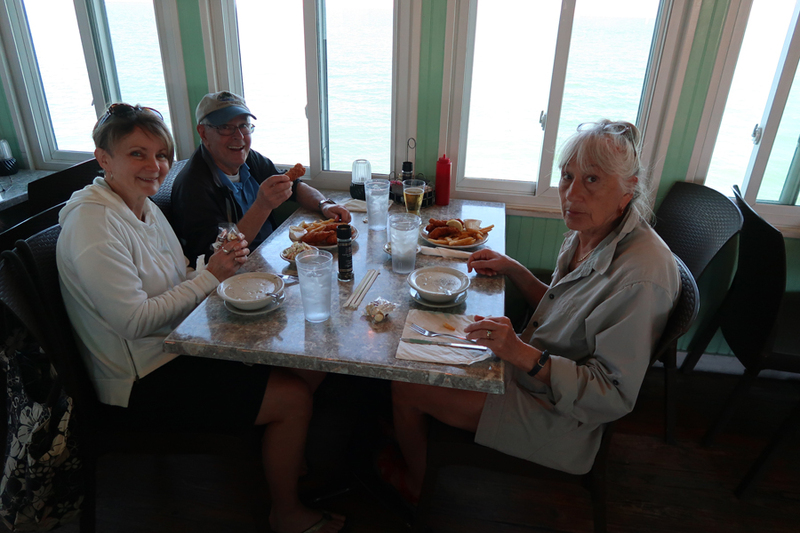 He is a bus boy at Theresa’s Restaurant on Sat and Sun. 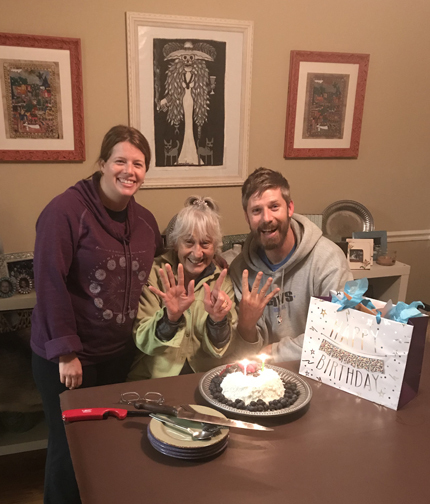 He served our table each of the last three Sundays for breakfast – surprised him with a $50 tip last Sunday. 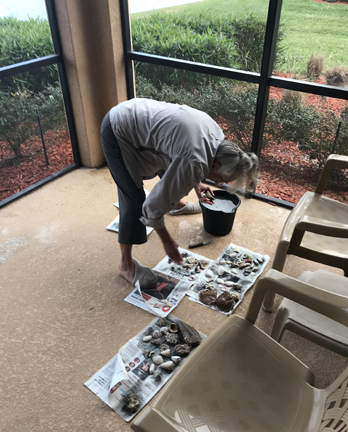 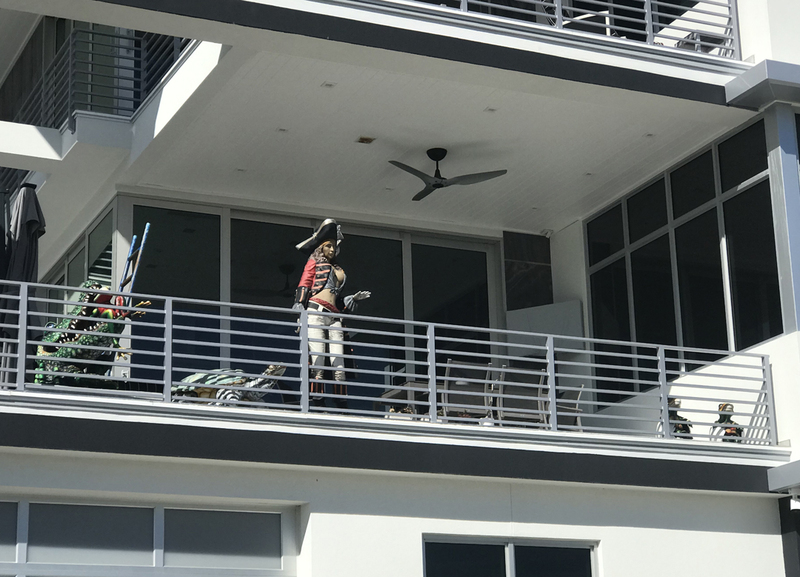 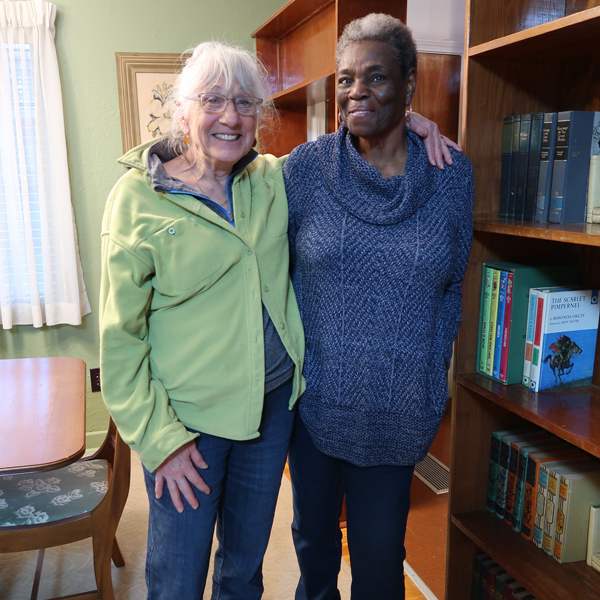 1/31 Th – last day of January, packing day (including Thrift Shop treasures), cleaning condo, and shells! 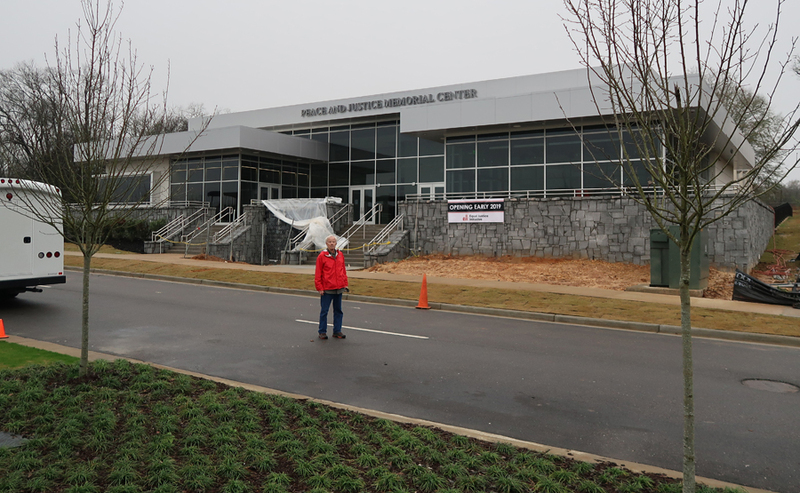 Also, last day for pool and Fitness Ctr. 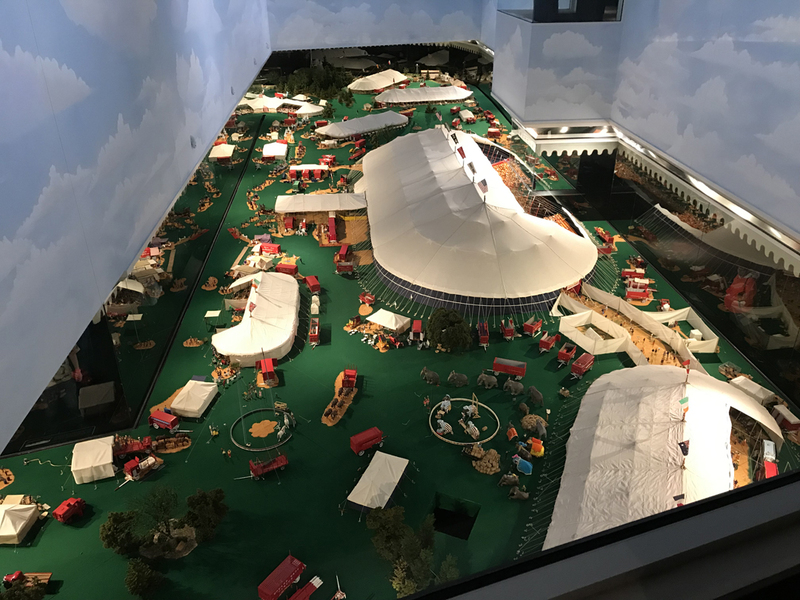 You are currently browsing the The Martin's Blog blog archives for January, 2019.